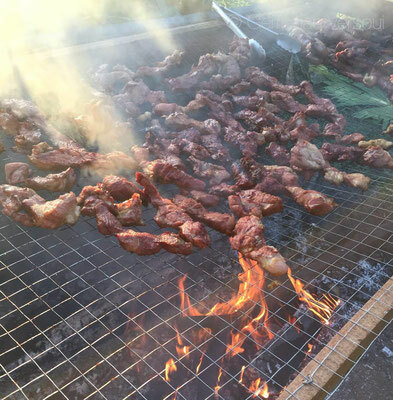 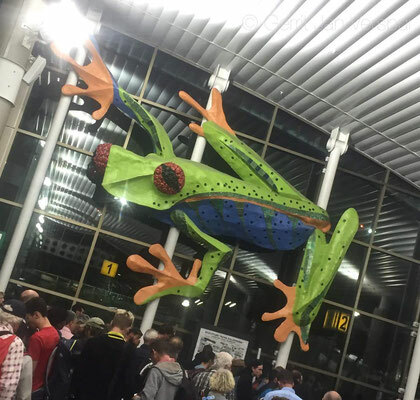 So I tried to arrange trip to South Africa, but the people I wanted to meet were already busy at that time, so that has to happen an other year. 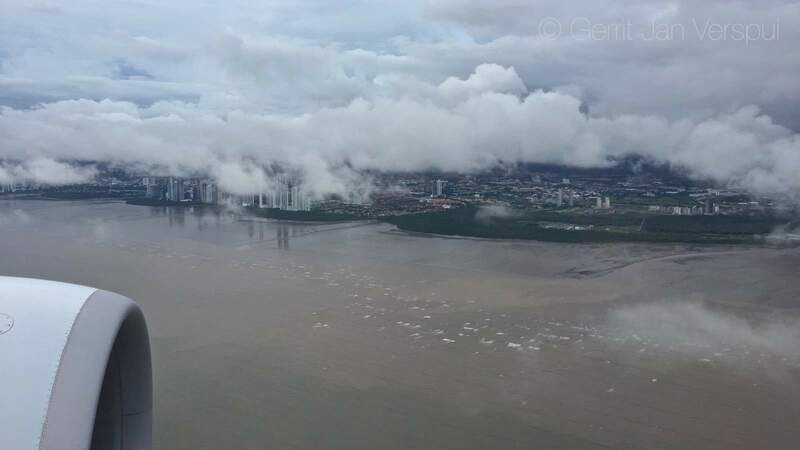 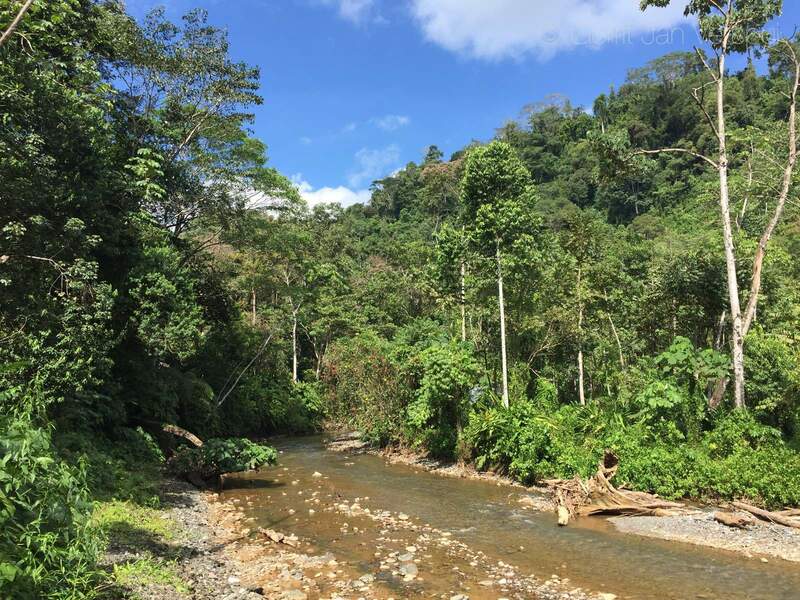 So what else is possible in december..I started to look for attractive tickets and it did not take long before I found some good ones for Costa Rica. I checked work and home if it was possible and the tickets were booked as soon as I got the green light. 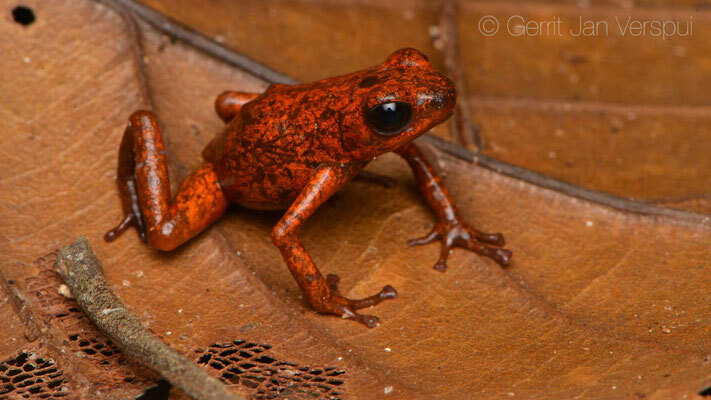 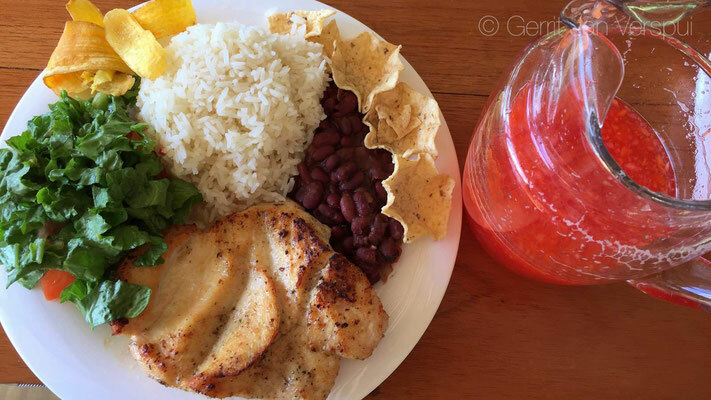 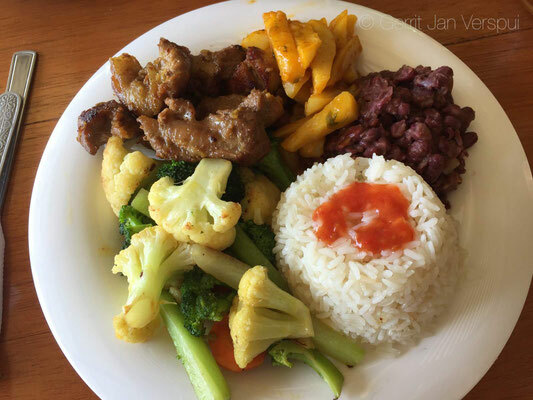 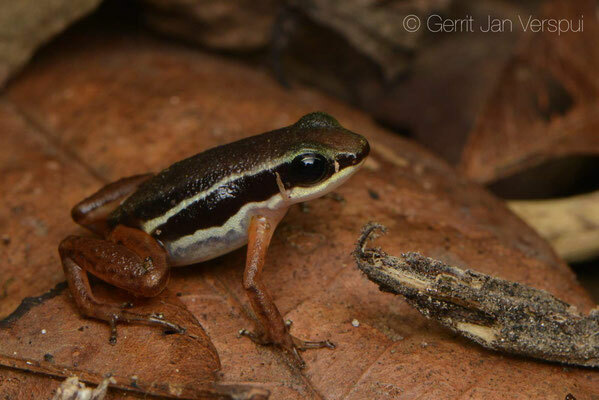 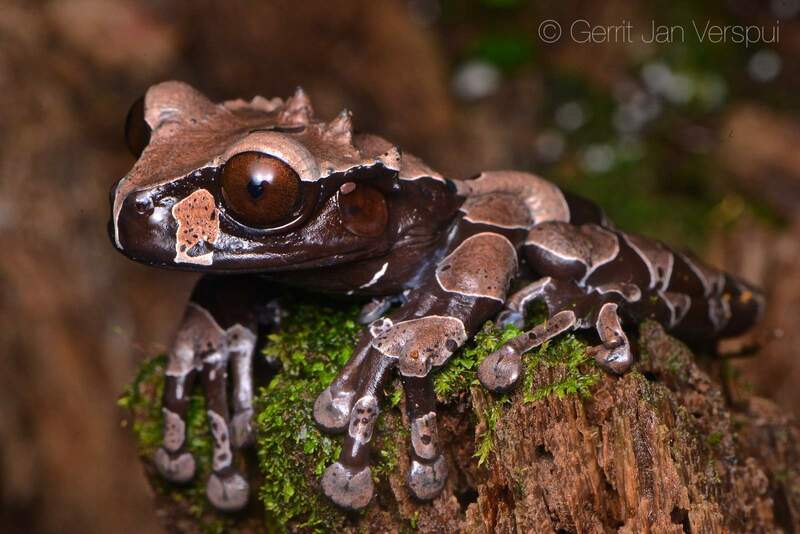 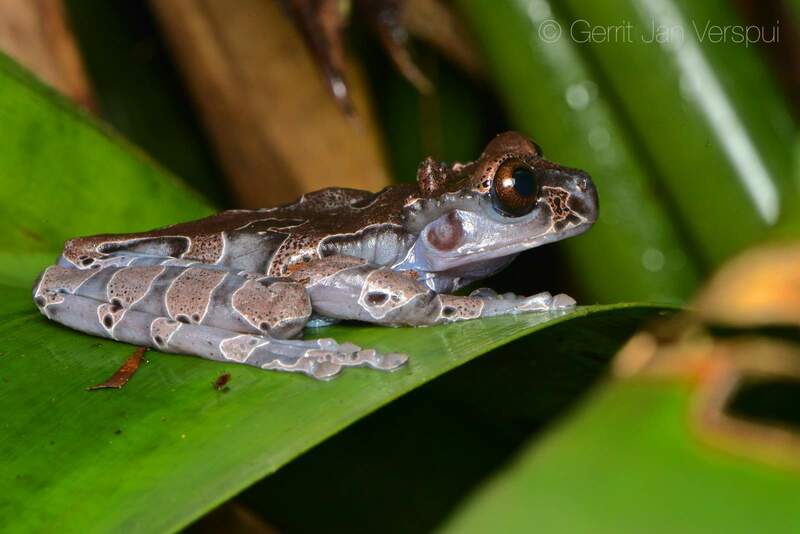 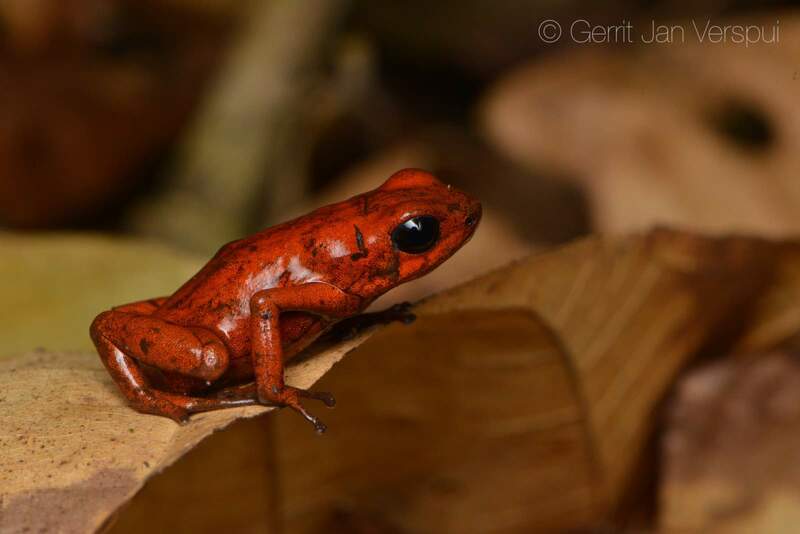 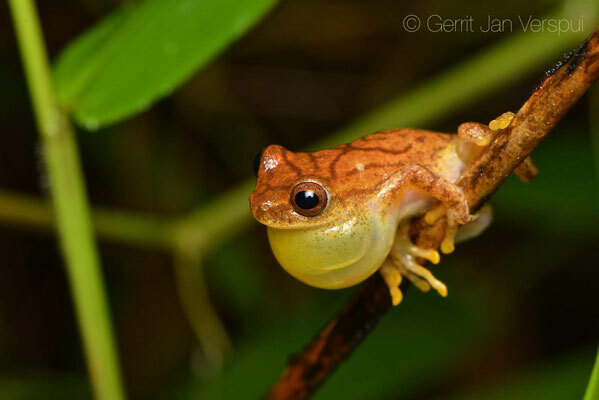 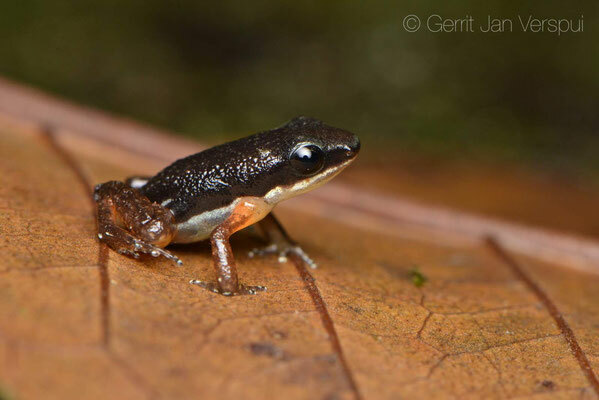 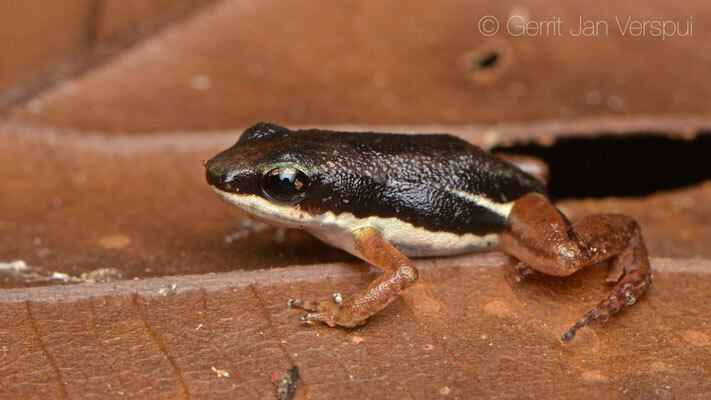 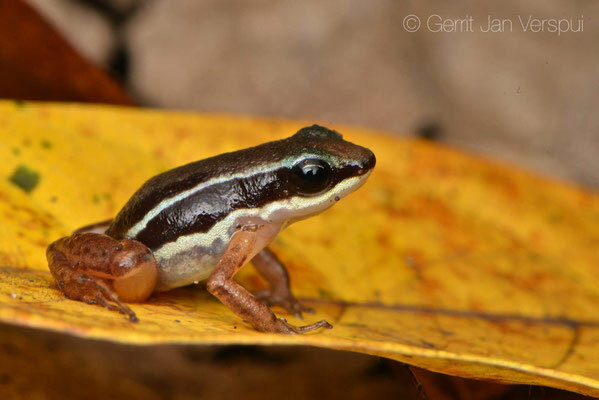 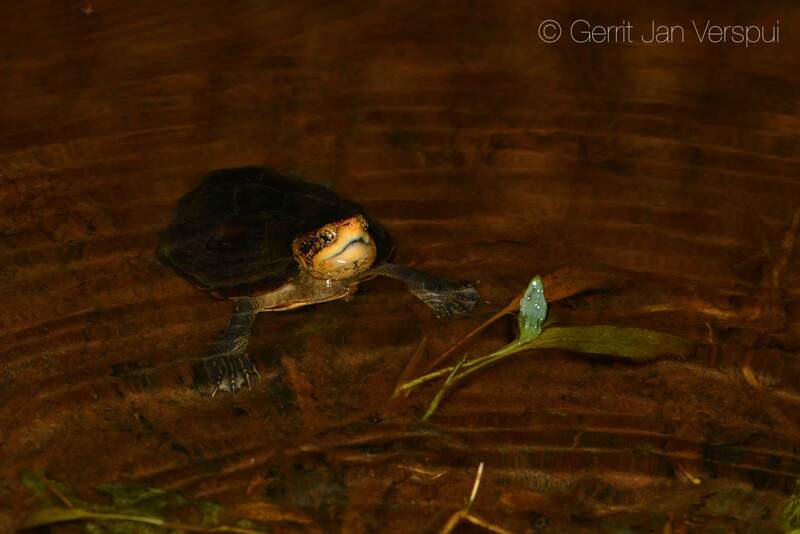 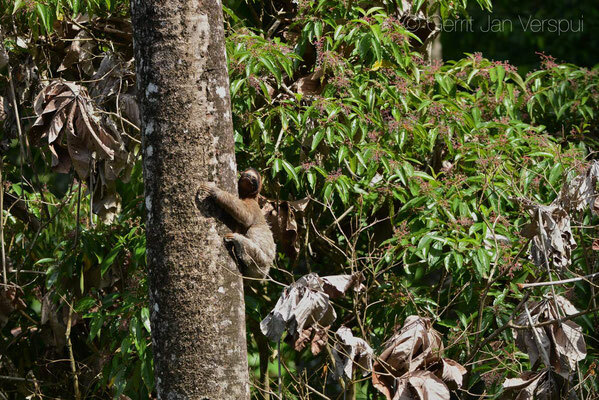 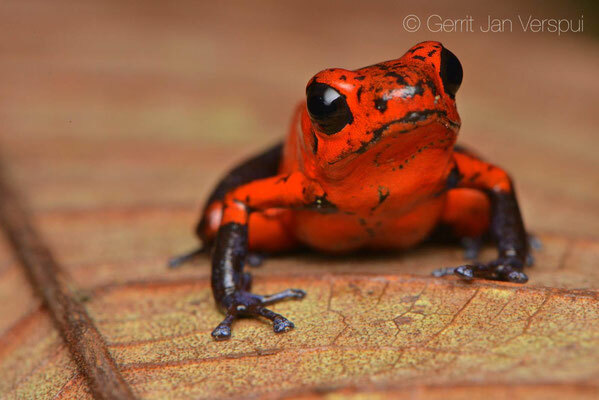 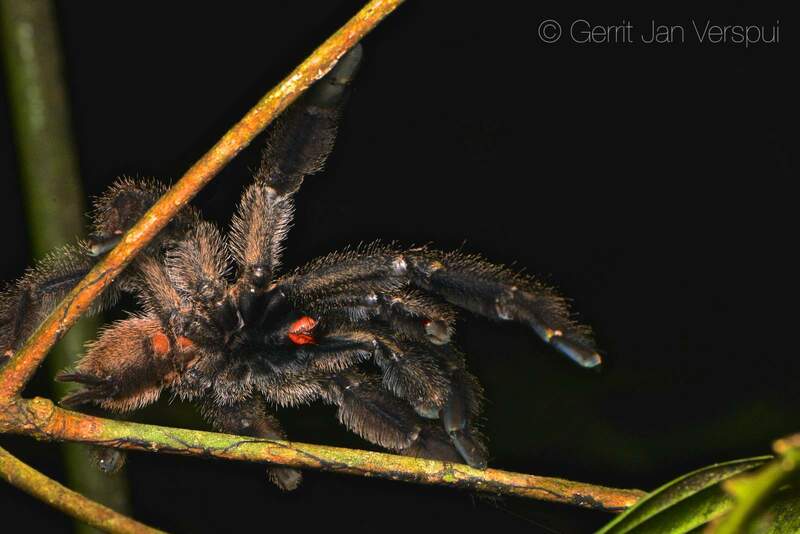 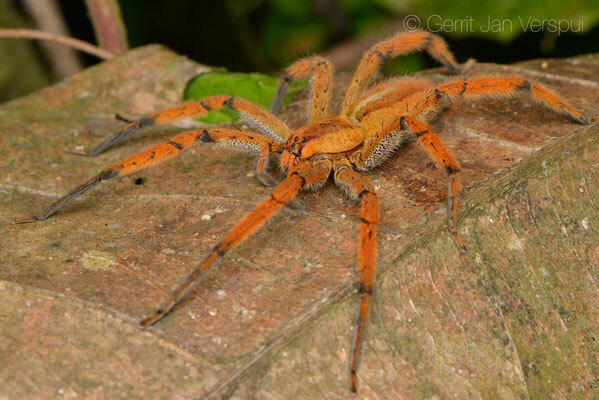 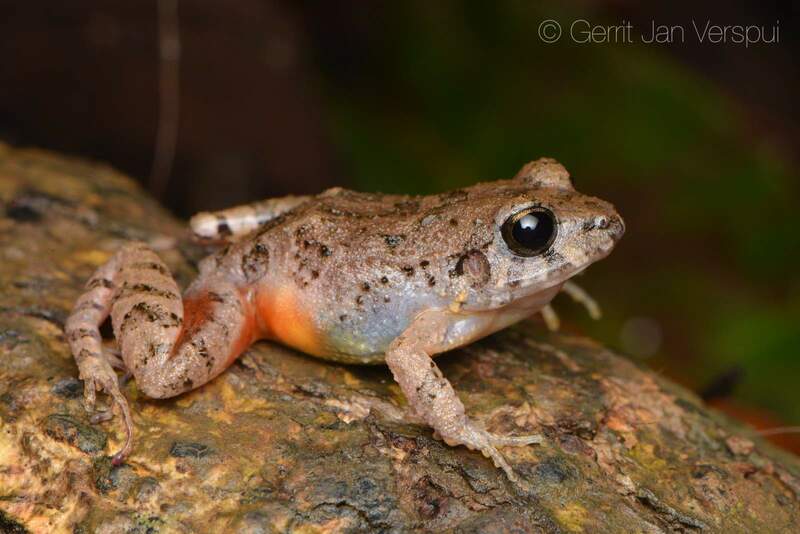 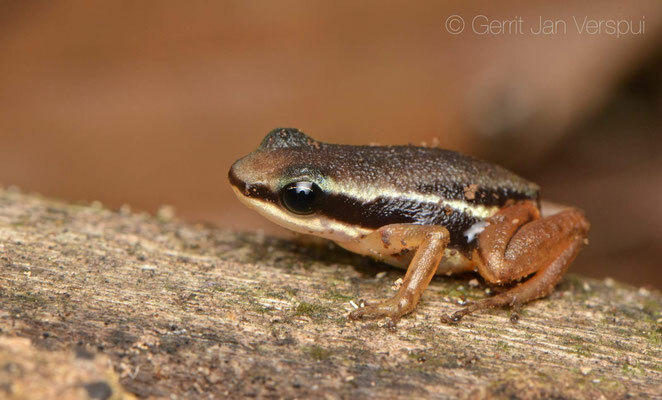 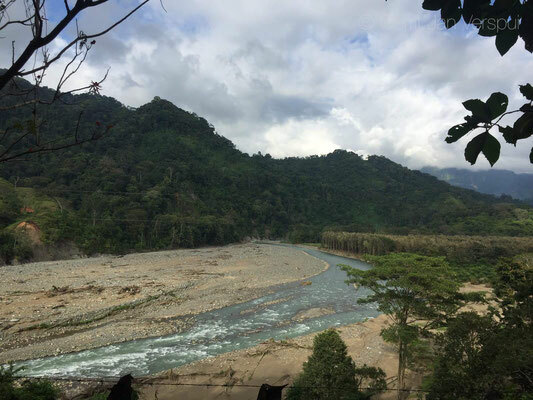 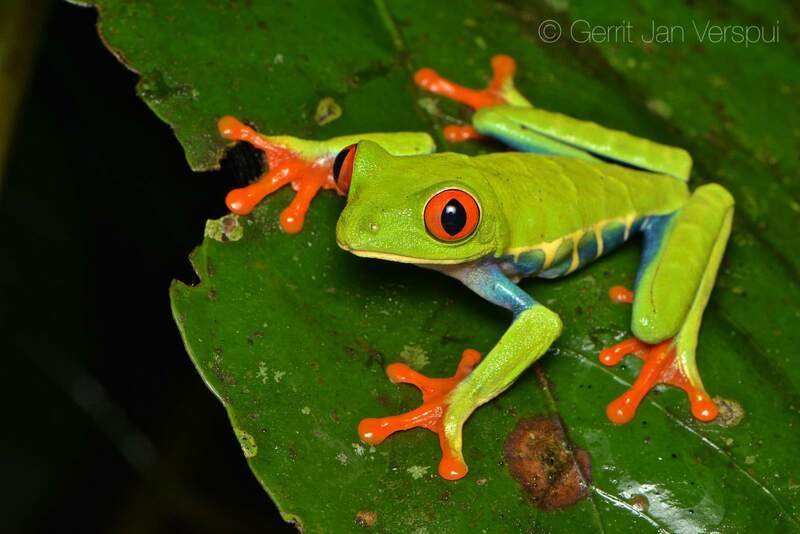 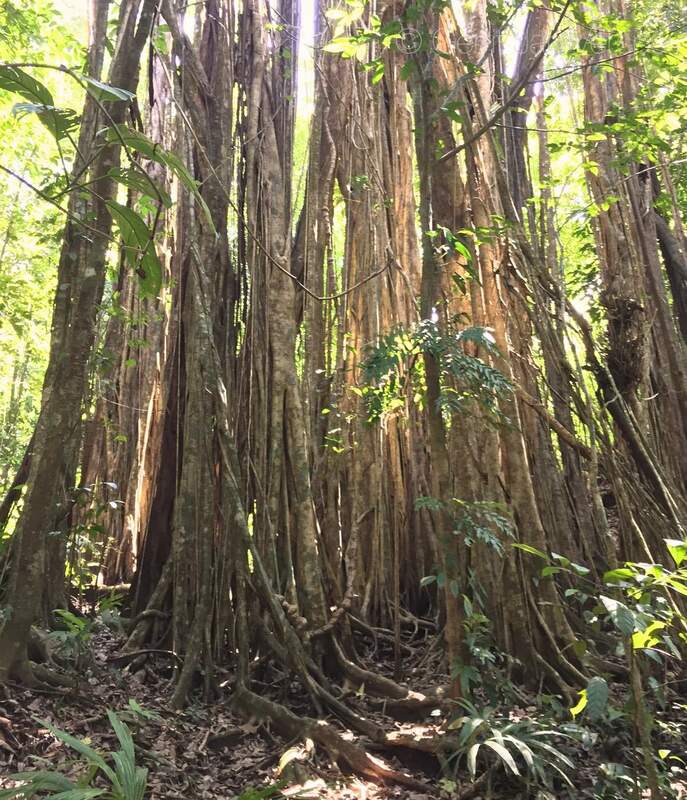 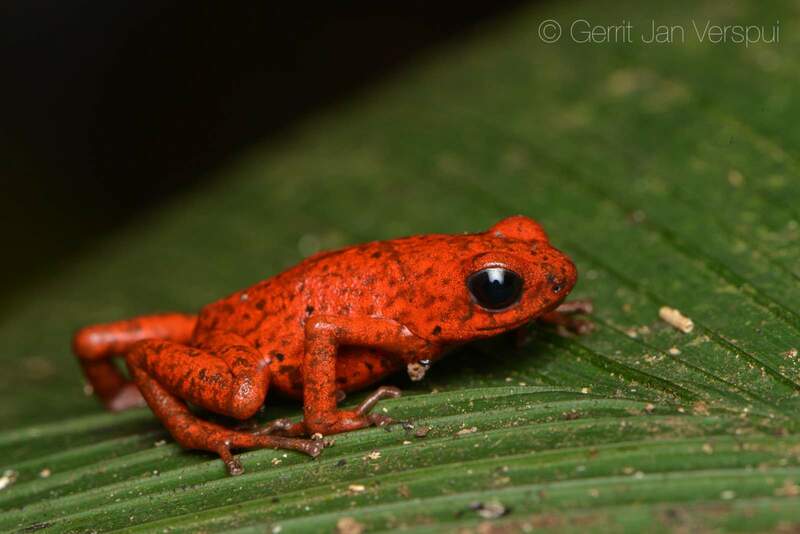 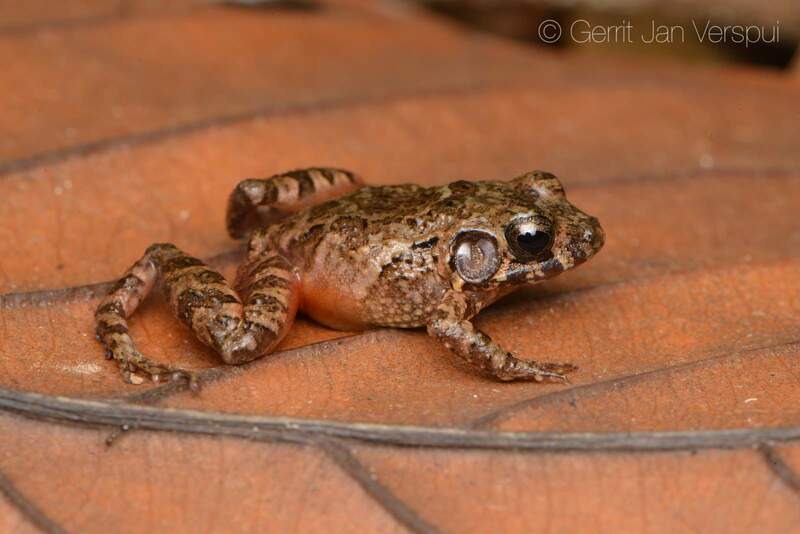 Costa Rica was not new for me, I already went there for 3 weeks with my family in 2015 (Trip report 2015) and many amphibian and reptile species were found at that time. 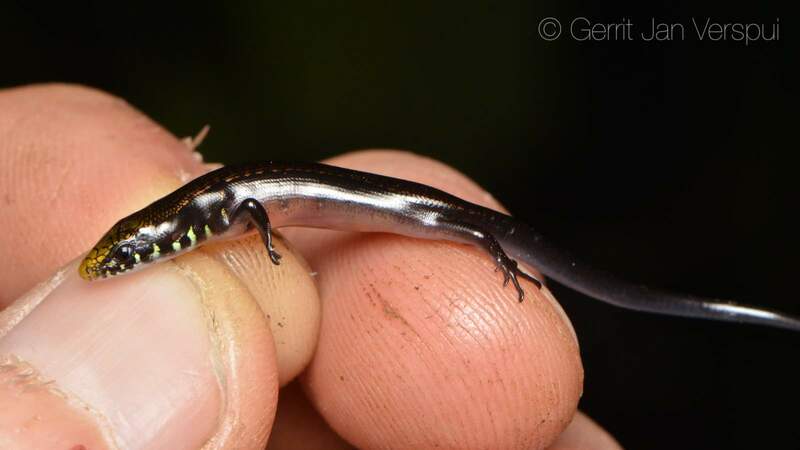 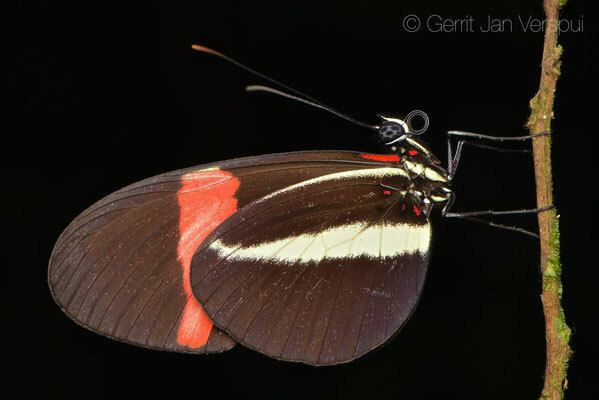 Finding around 125 species out of 400 is good, but there are still enough reasons to go back there and try to find some new stuff. 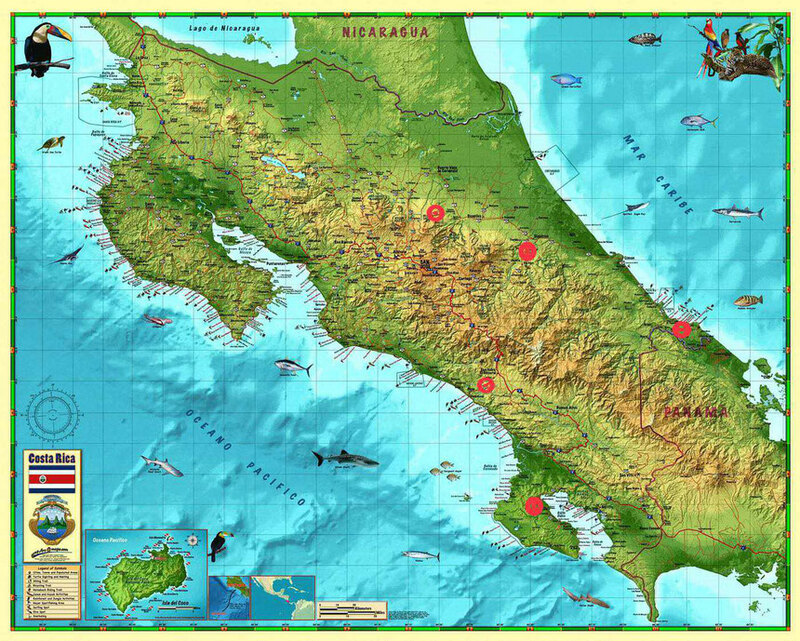 I already knew some places that I wanted to visit, so I checked them all and within 5 days all 5 places were booked. 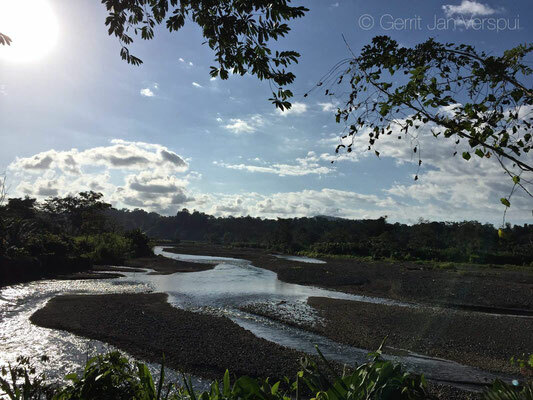 Yatama Eco Lodge, CRARC, Kekoldi, La Ceiba Eco Adventures and Eco Turistico La Tarde were the places I went to. 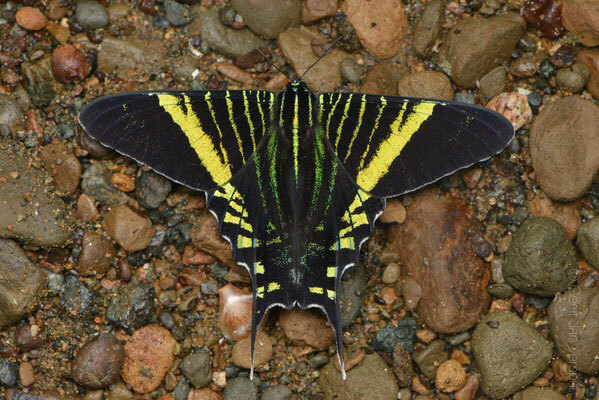 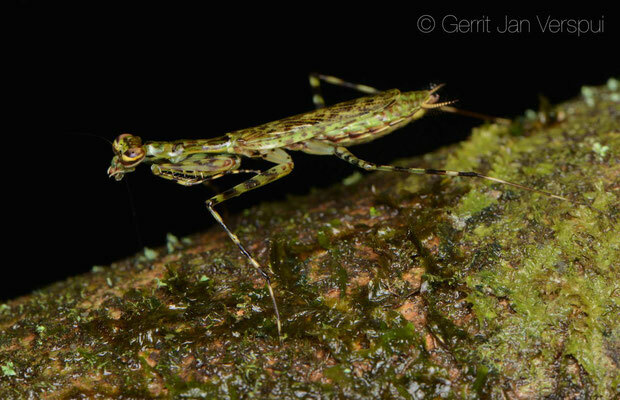 Anotheca spinosa, this was one of the biggest reasons for going back to Costa Rica. The flights I had booked were good, only 14 hours when I went there and in a straight line back home in 11 hours. 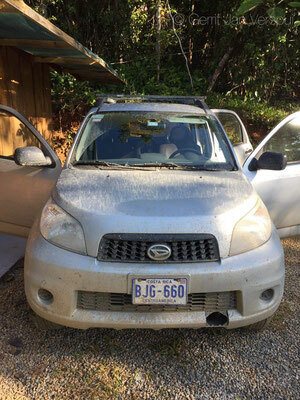 I arrived in San Jose around 19:00 and after I got my rental car I started the drive to Yatama Eco lodge, it was raining when I got to the last part of the route, it was a dirt road and I was told that I'd better park the car at the start of the road and that they would pick me up, but at the rendezvous point I saw nobody, so I drove further and it did not look that hard to drive up. 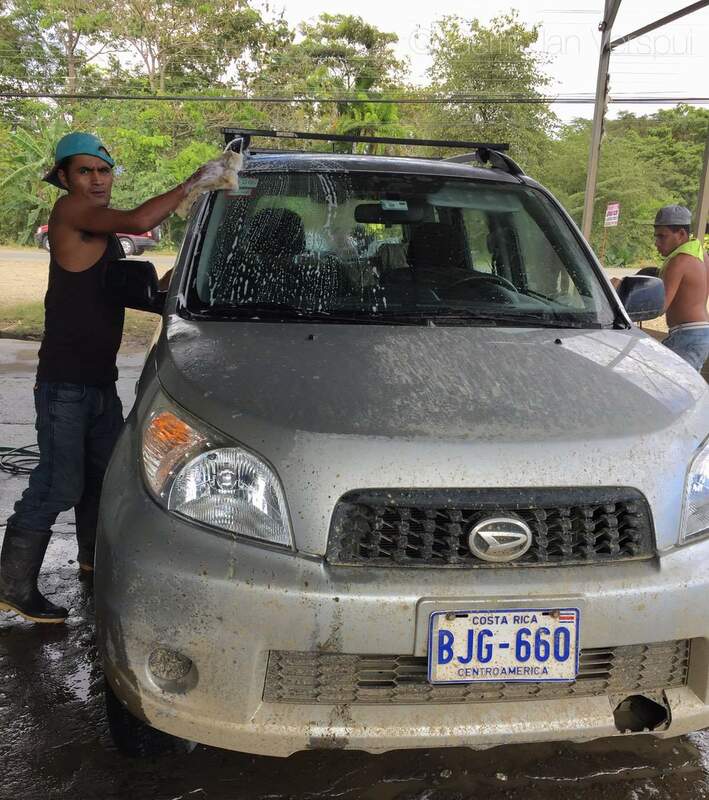 When I was almost there I saw a car coming down the mountain, it was the host Pedro with Donald and Juan. He asked me if I wanted to try and drive up or get into his 4x4. 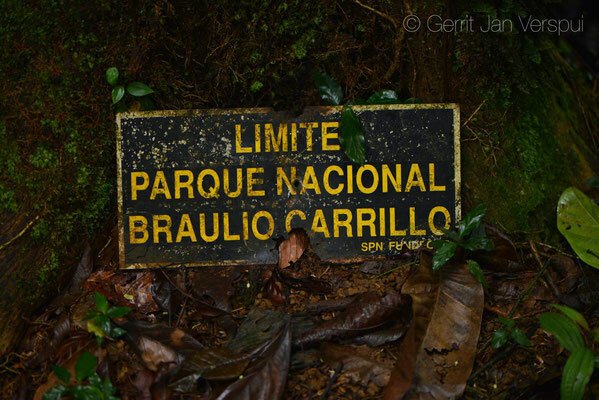 That is a question where only one answer is possible...So Pedro stepped into my car and we drove up without problems...we only had to wait 2 times because the 4x4 of Pedro got stuck, hahaha. 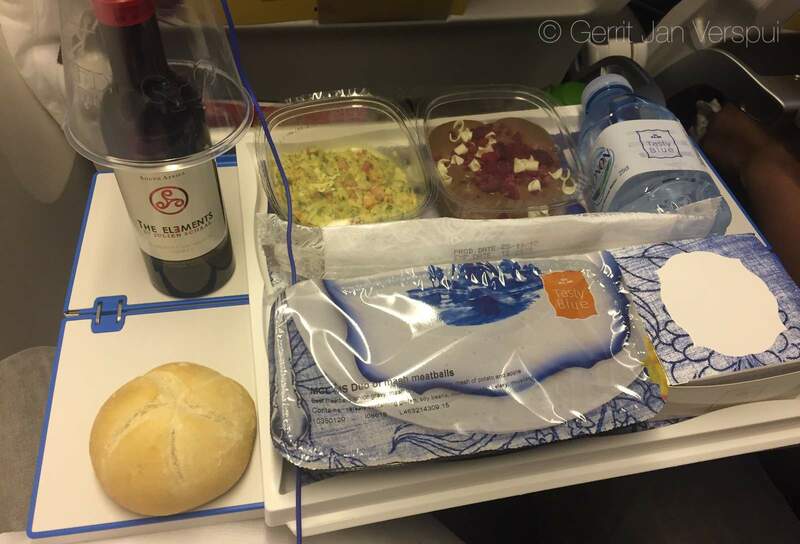 I was already after midnight when we arrived, but Pedro made me a nice meal first and asked me what I wanted to do. 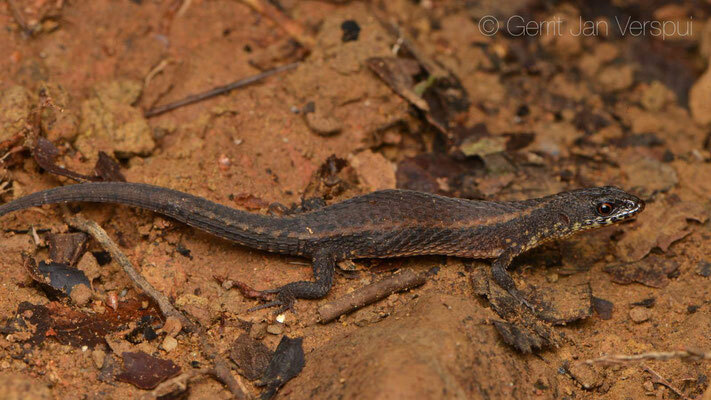 I was only awake for 24 hours, so the best thing to do than is herping!! 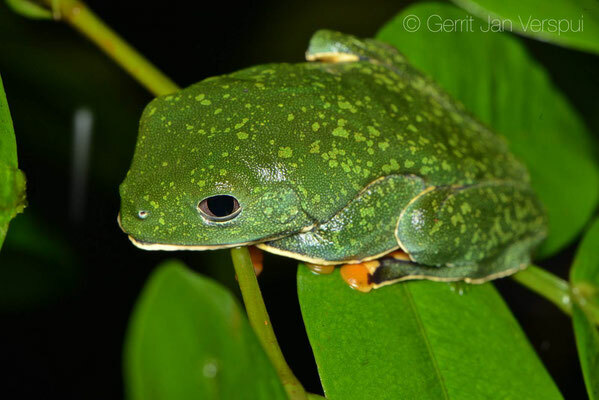 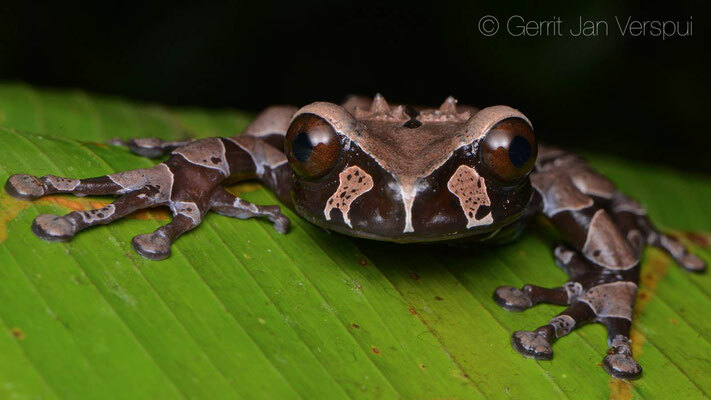 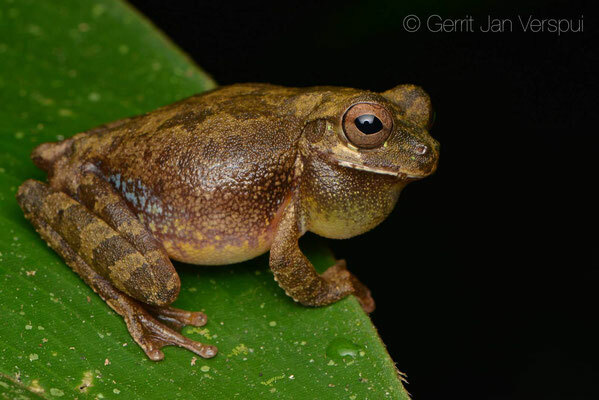 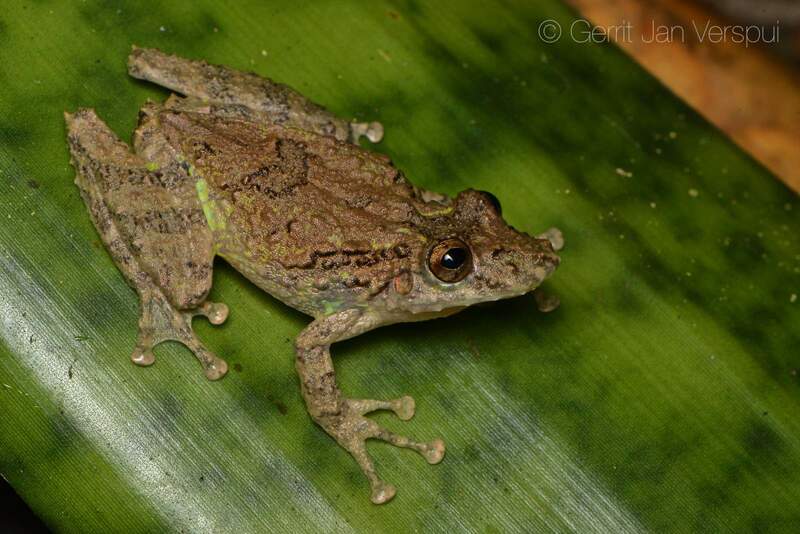 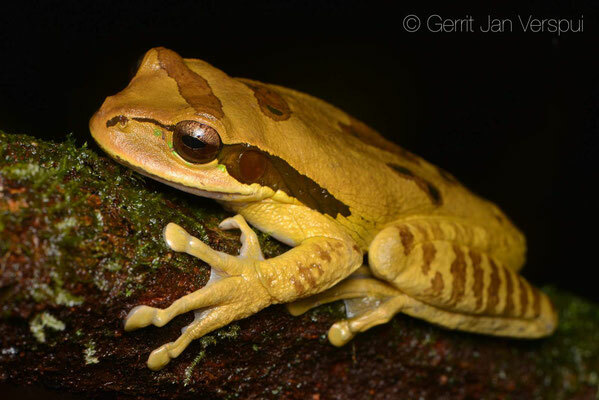 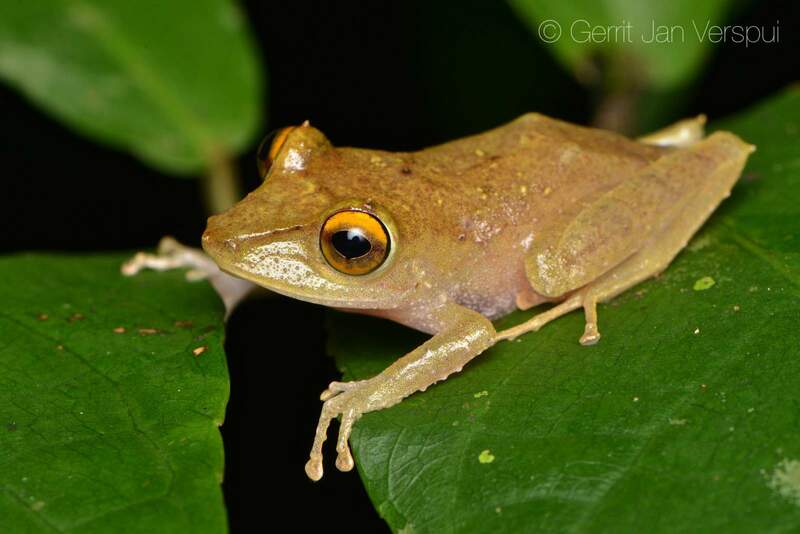 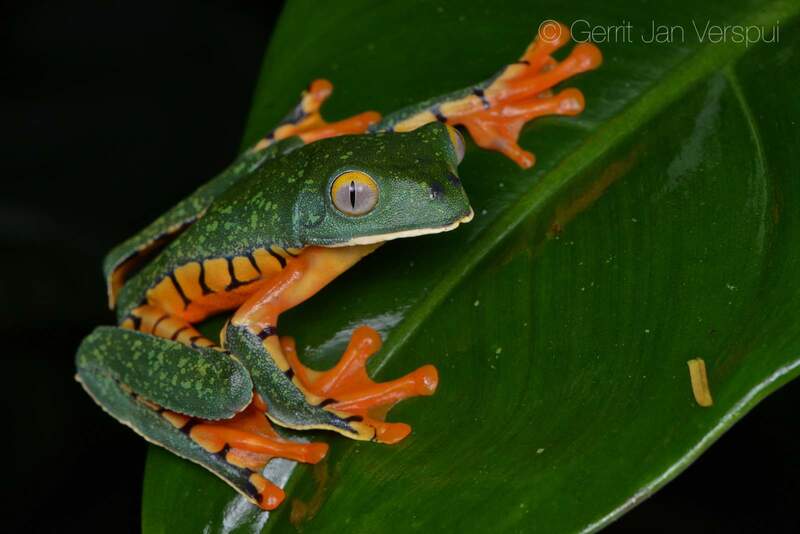 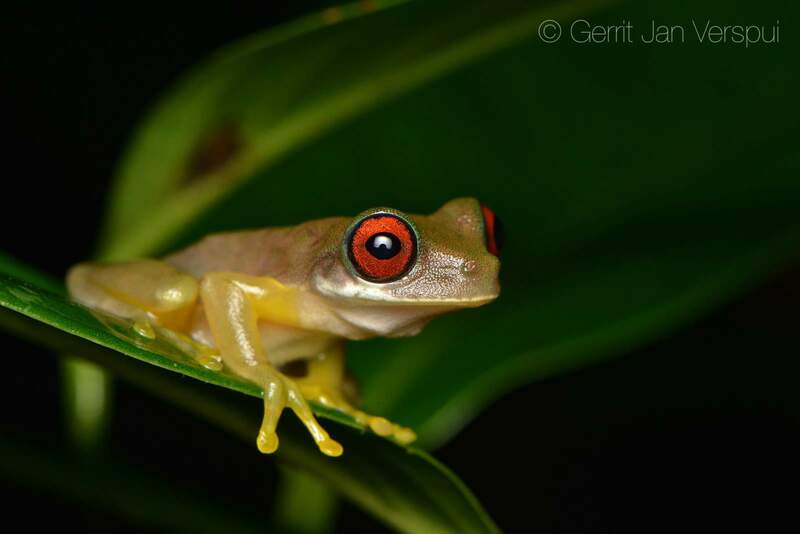 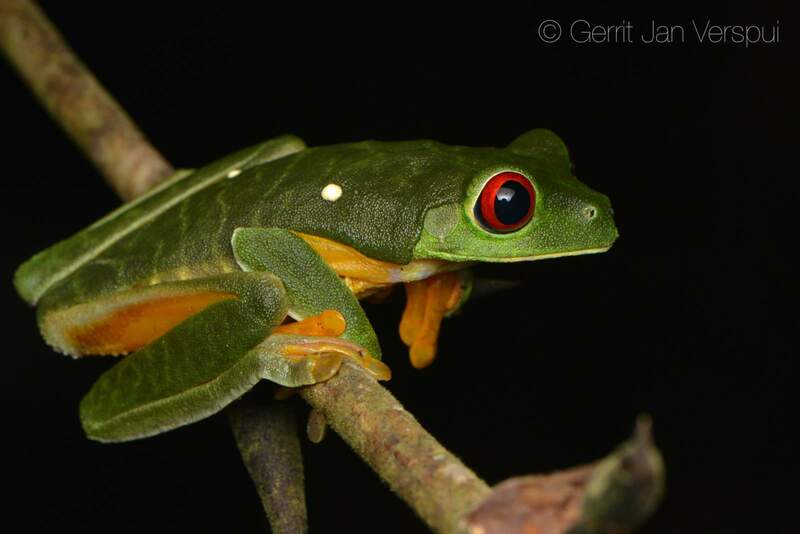 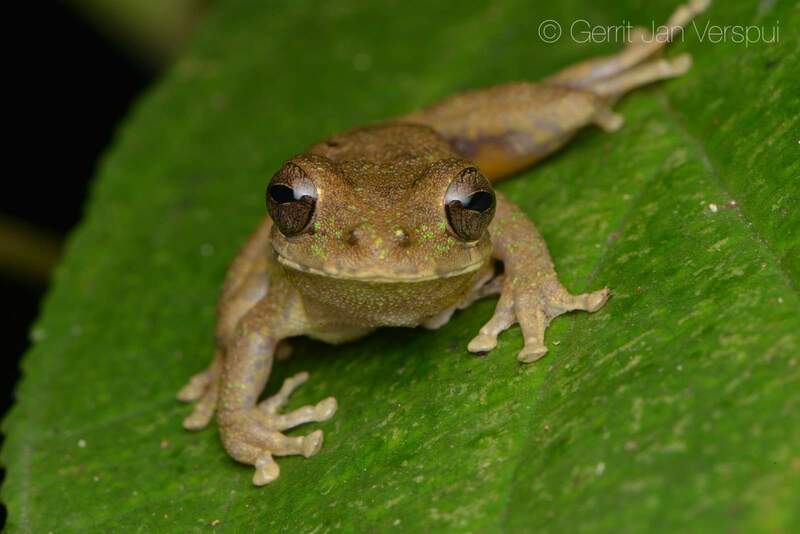 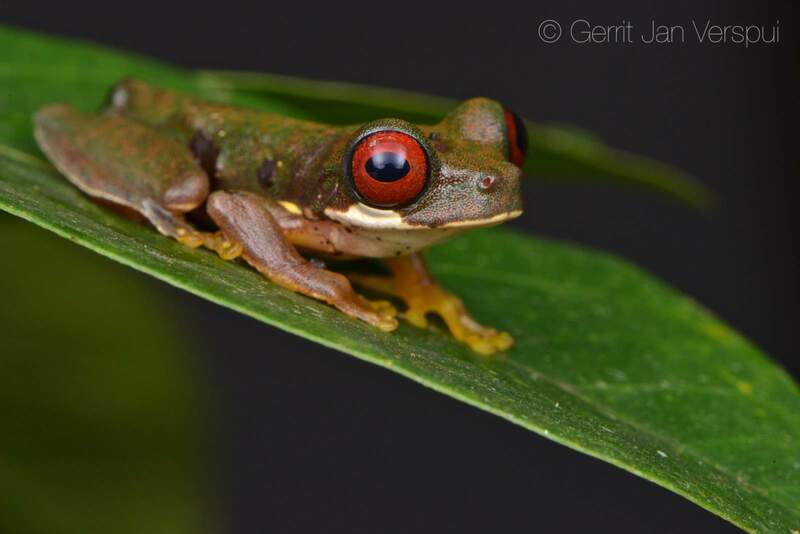 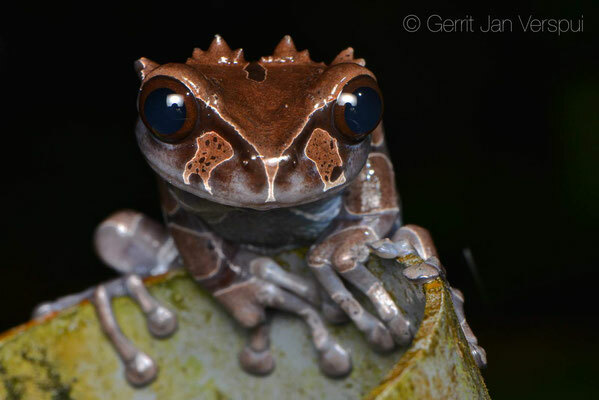 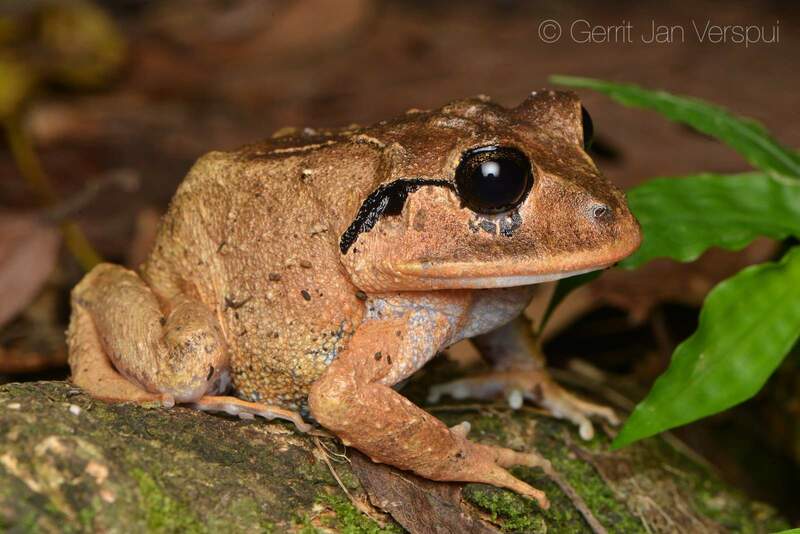 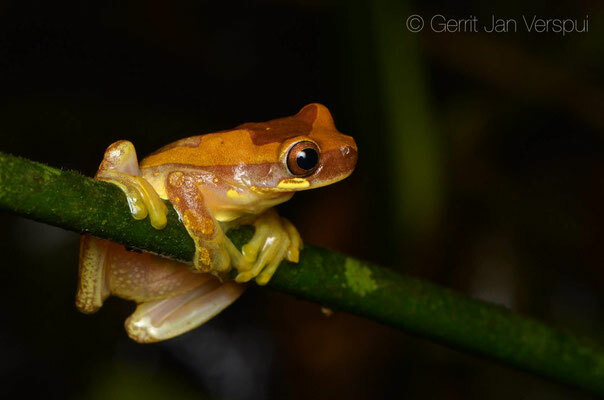 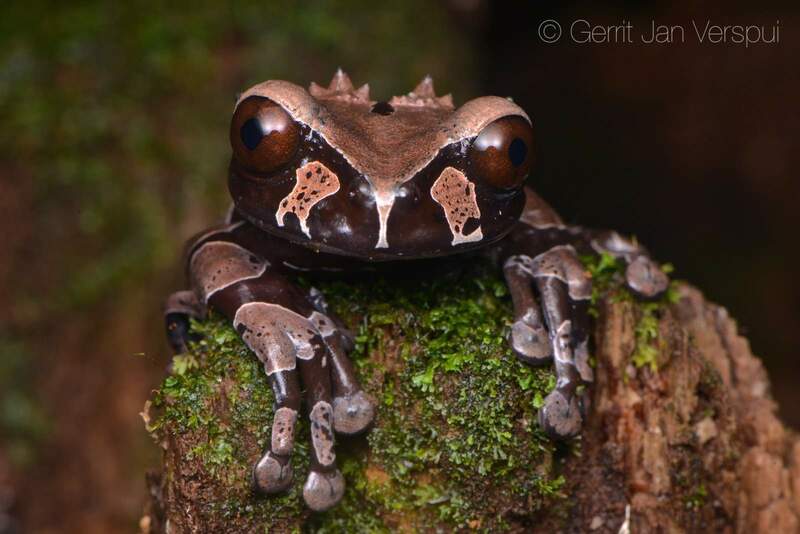 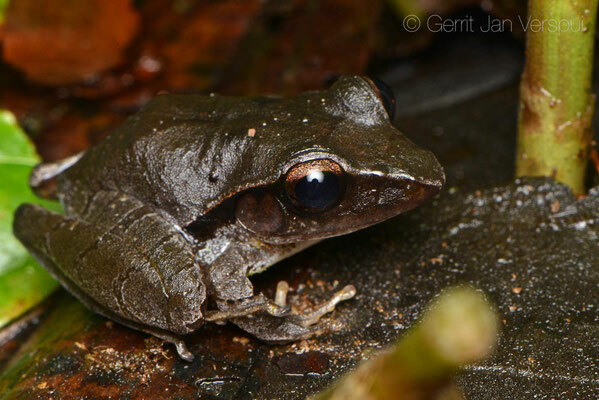 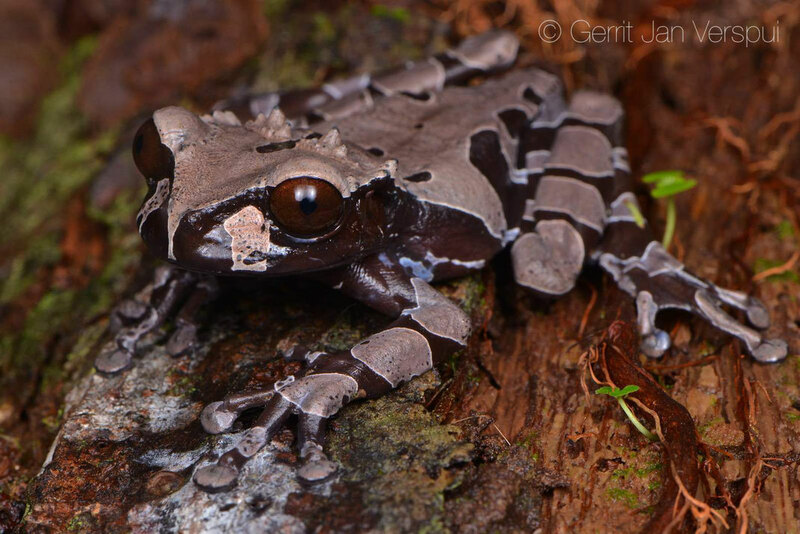 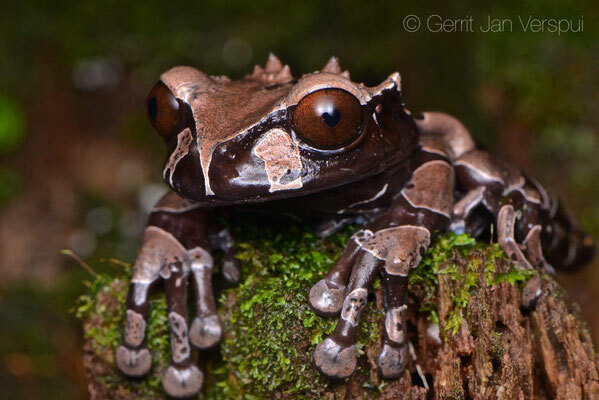 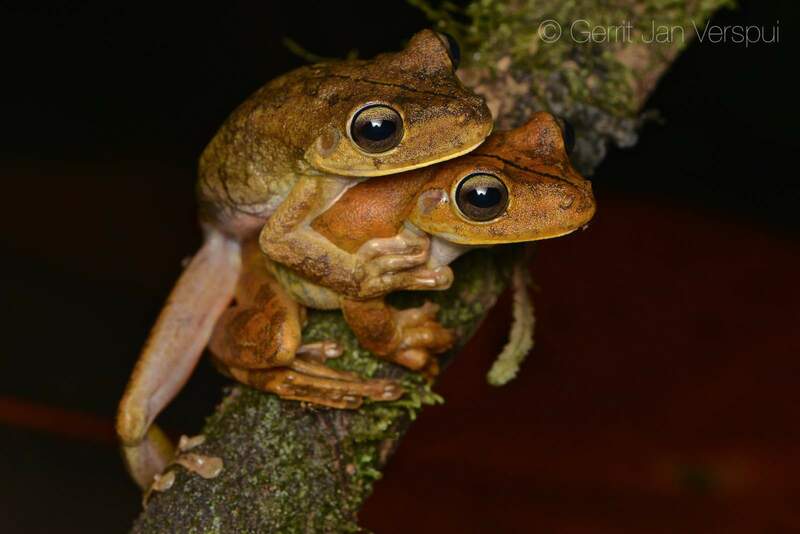 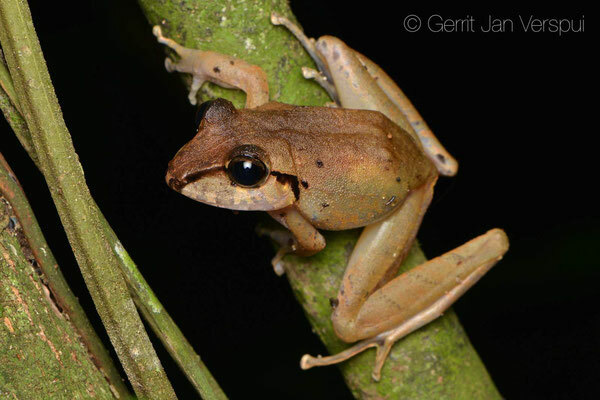 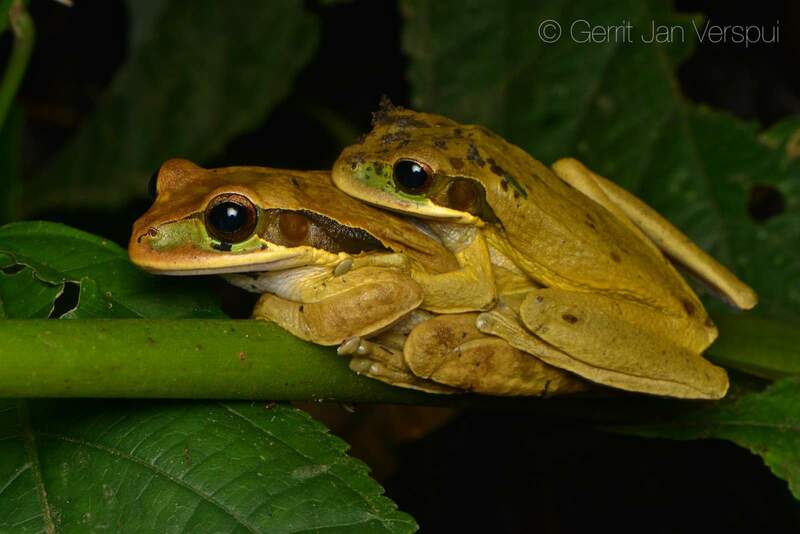 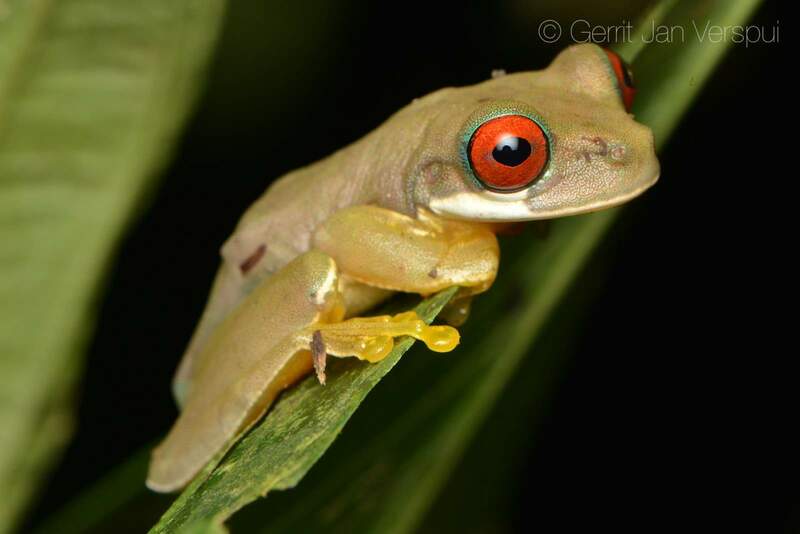 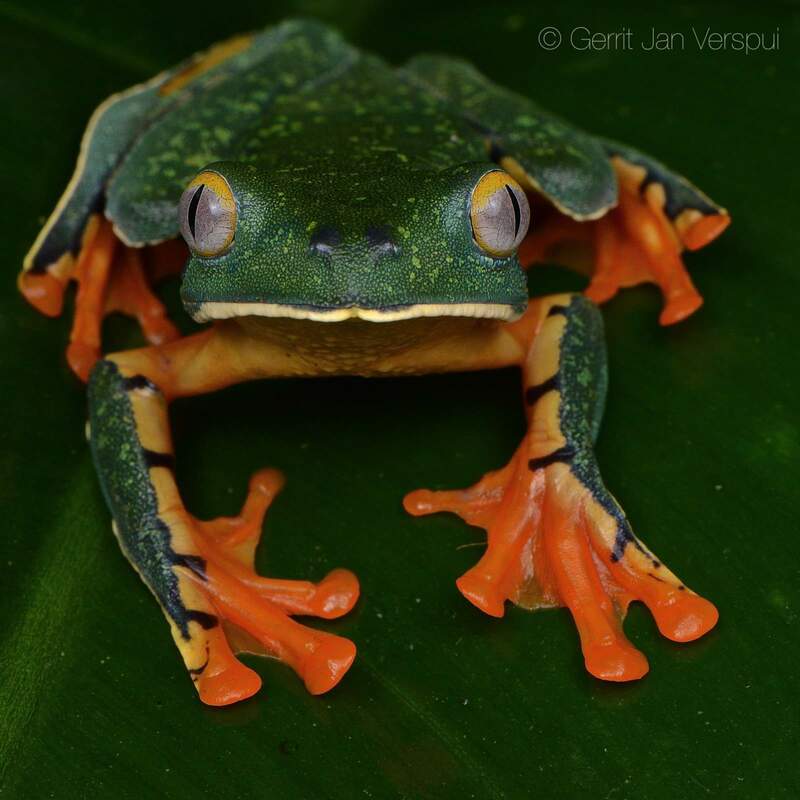 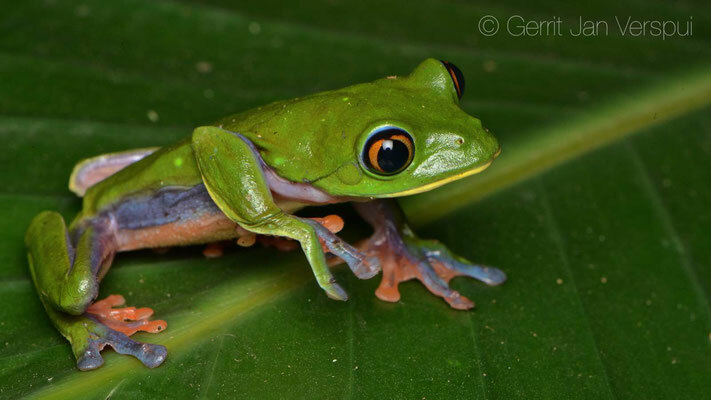 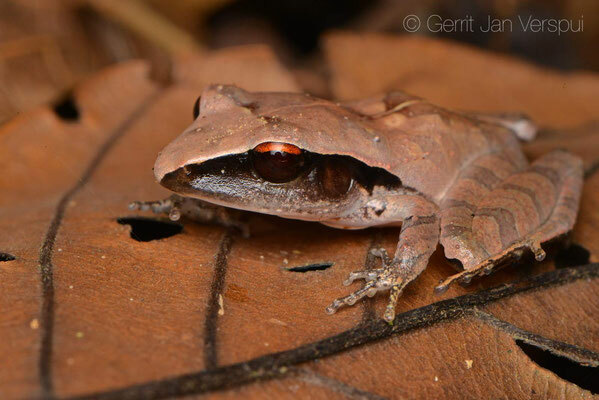 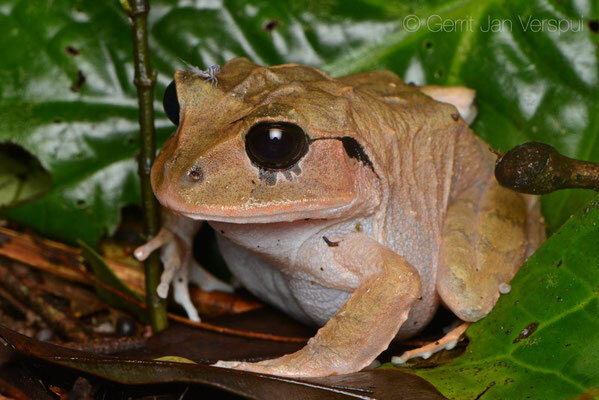 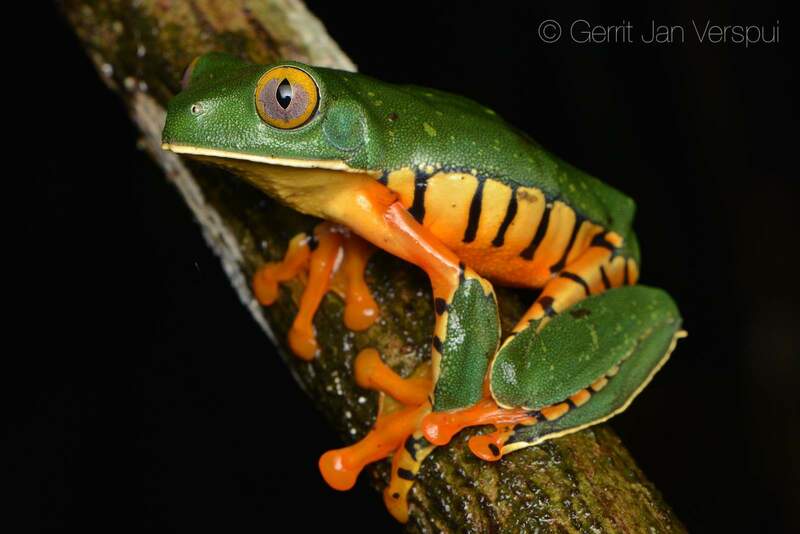 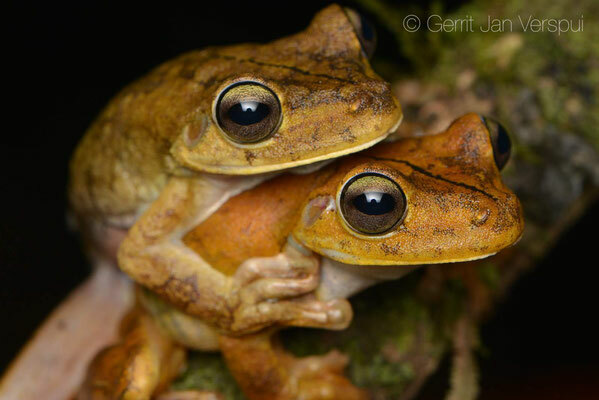 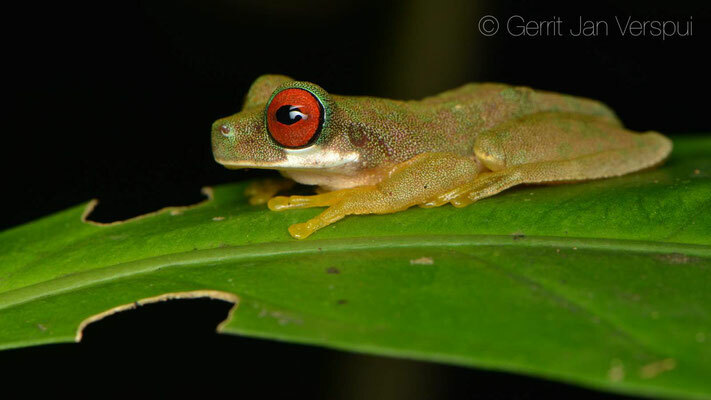 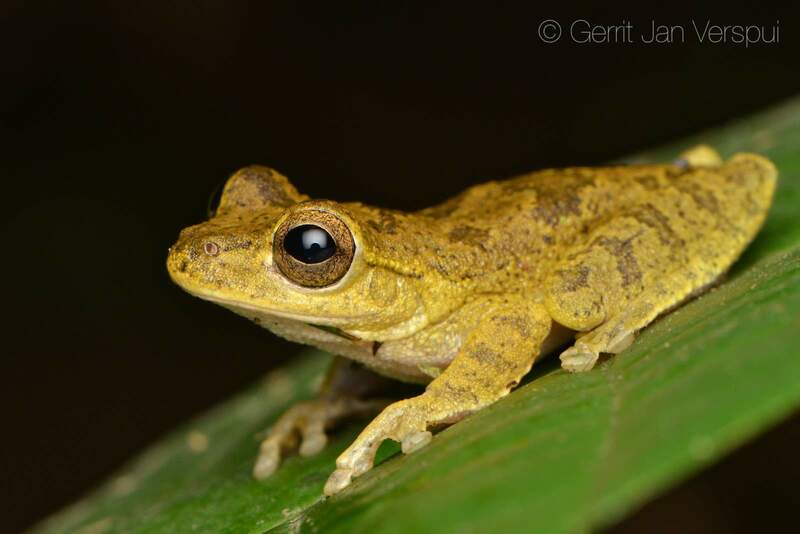 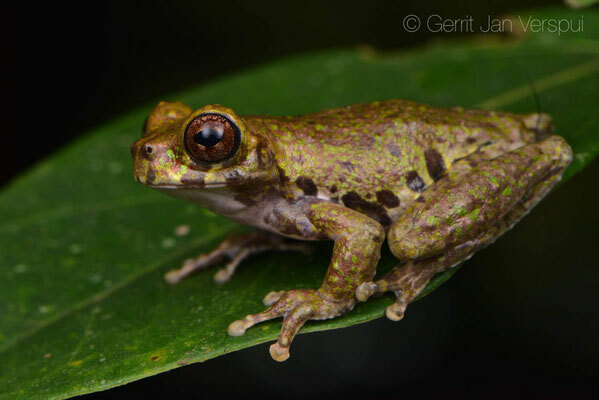 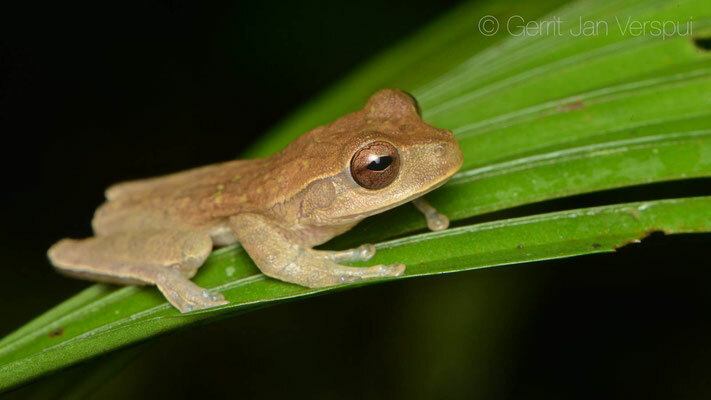 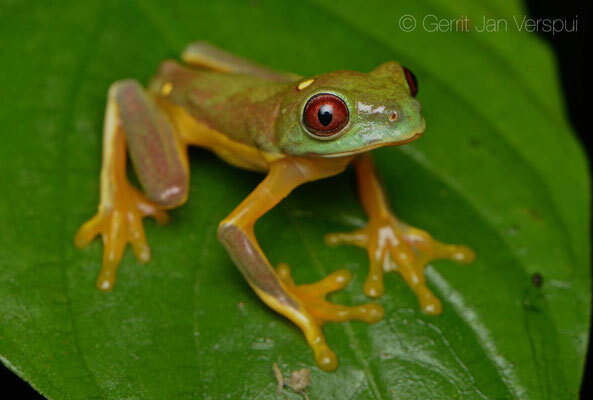 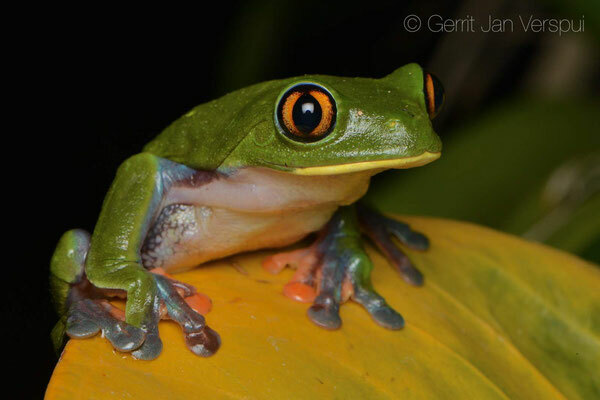 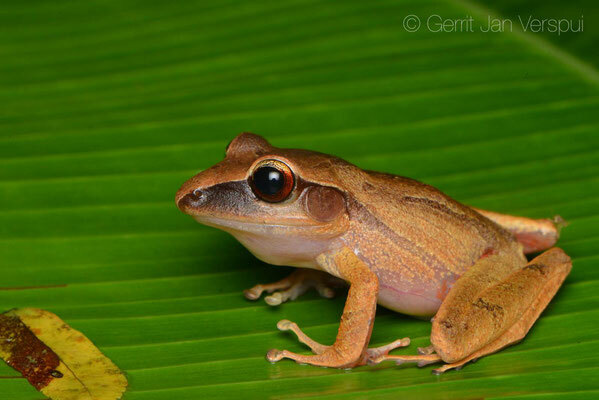 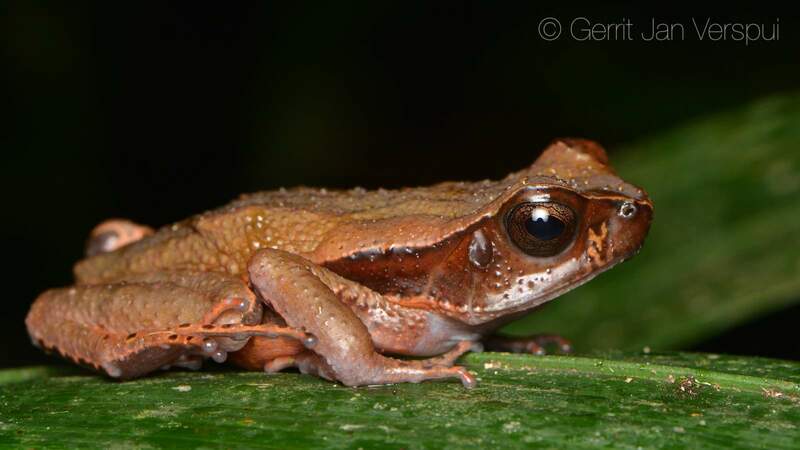 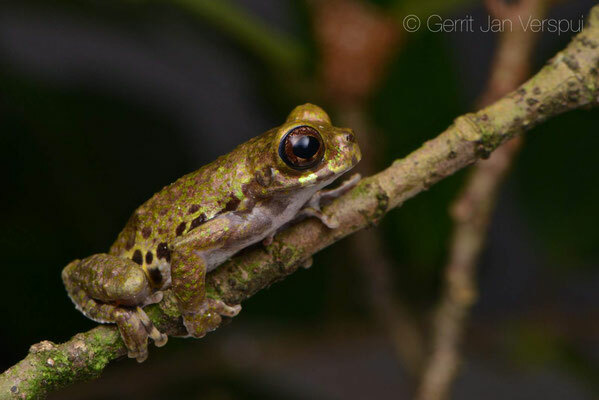 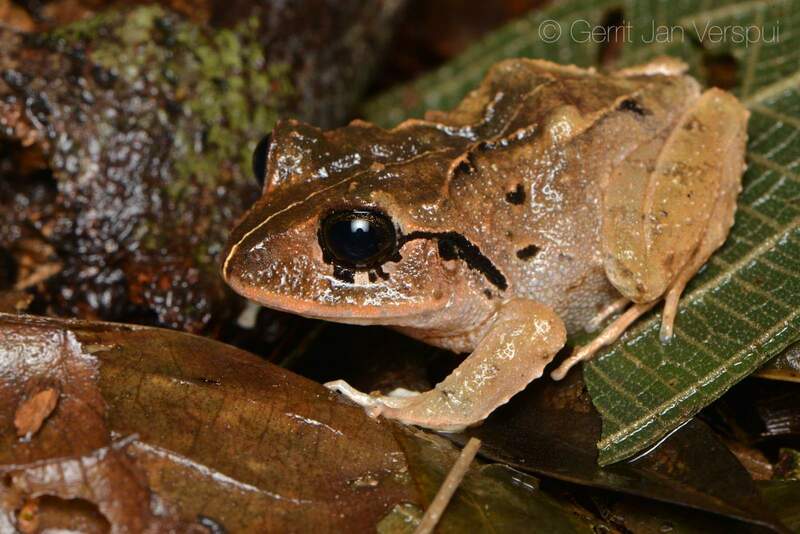 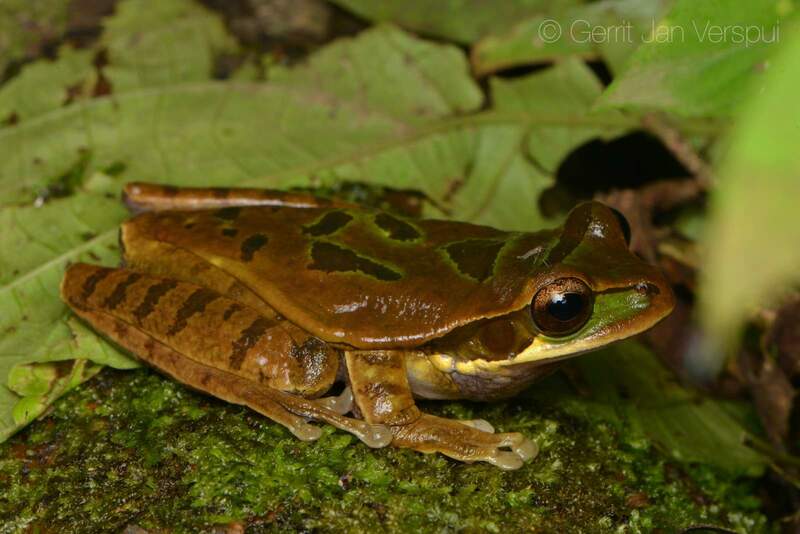 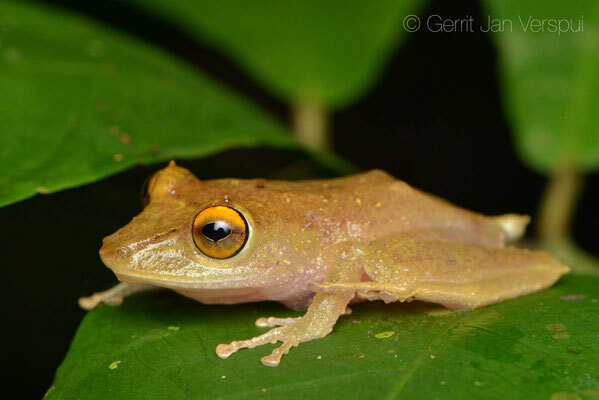 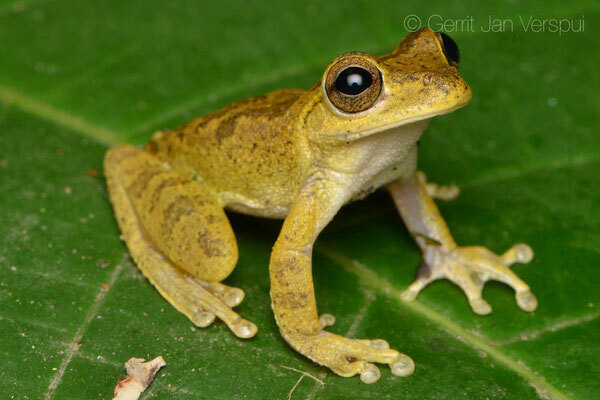 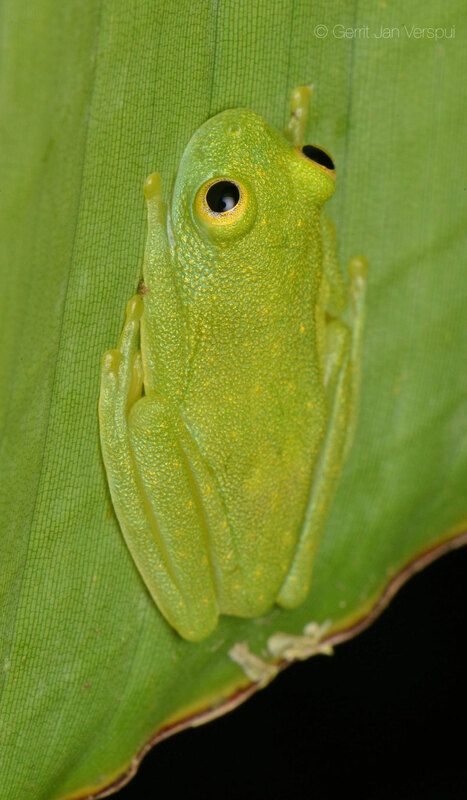 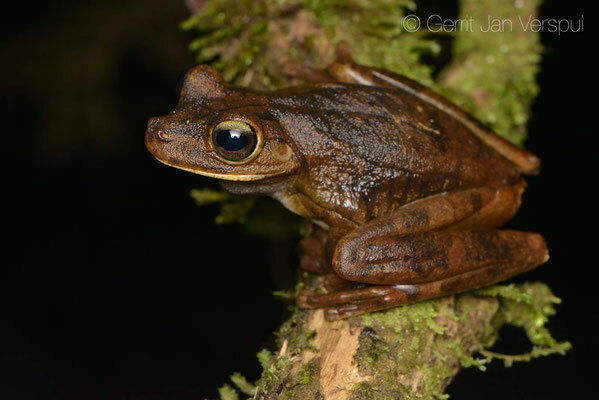 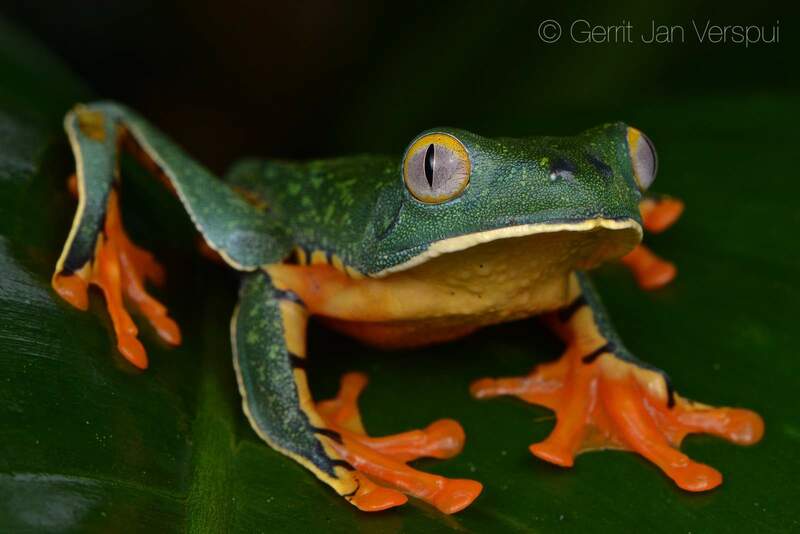 After the great midnight meal we went out and within 2 minutes a Smoky Jungle Frog was on the trail and just after that I saw a big tree frog on top of a leaf, it was the best tree frog that Costa Rica has in stock, the Crowned Tree Frog! I could not be more happy, finding this highlight within 5 minutes was a dream start for this trip! 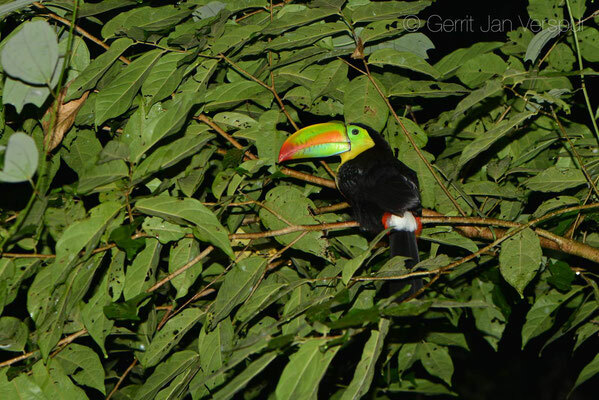 We did not stop there and more cool species were found, around 04:00 I was in bed and 4 hours later I was already enjoying breakfast. That day I went with Juan and Donald on a day tour, Donald knew a trail that is not known by many people, at some points we had to cut our way through the vegetation and regularly we crossed rivers and followed streams. 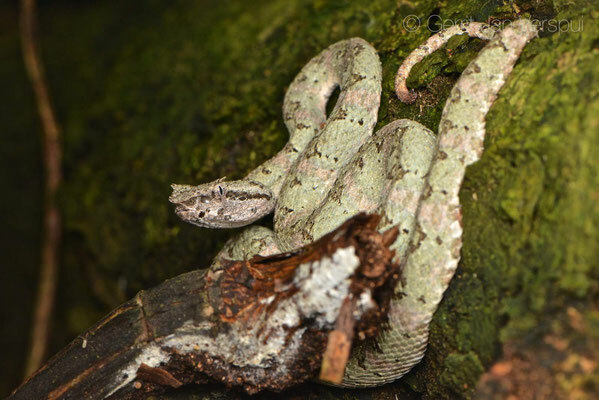 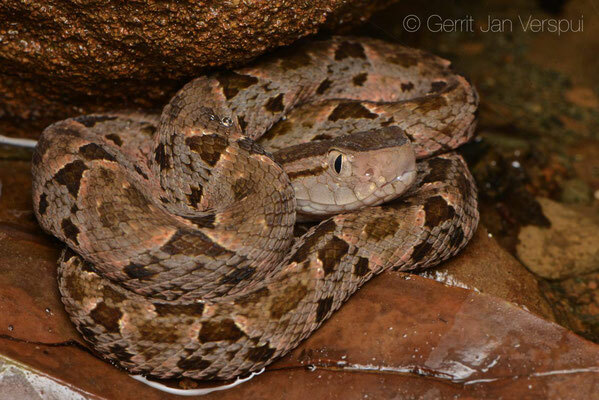 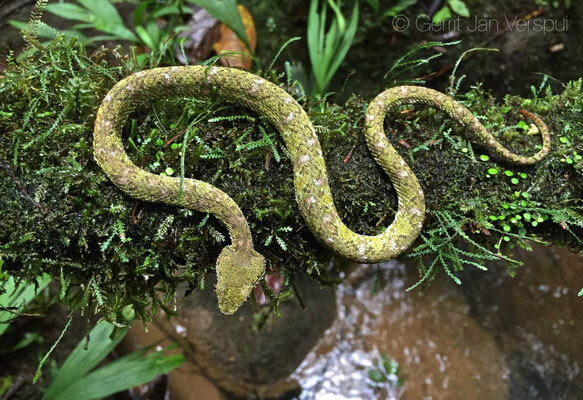 We walked around 4 hours and the highlight of this hike was a big fat Fer de Lance with a huge head that was curled up on the side of the trail. 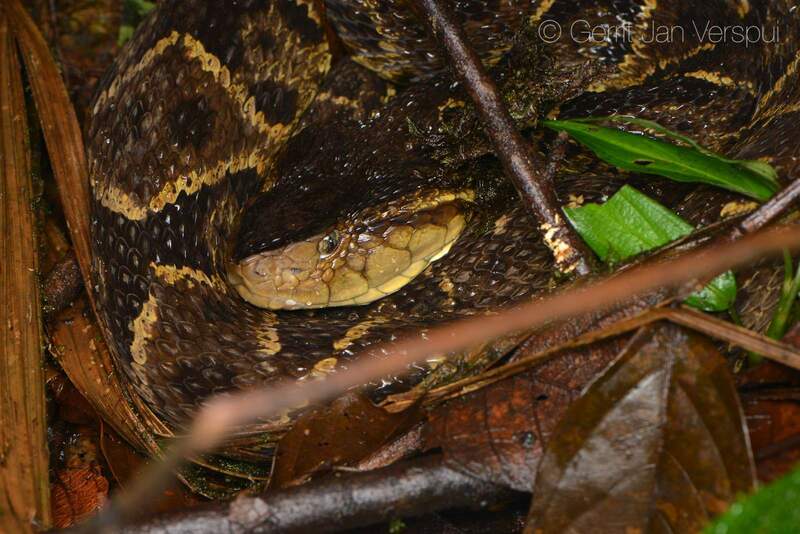 Donald and Juan kept a more than safe distane from this snake while I took some photos. 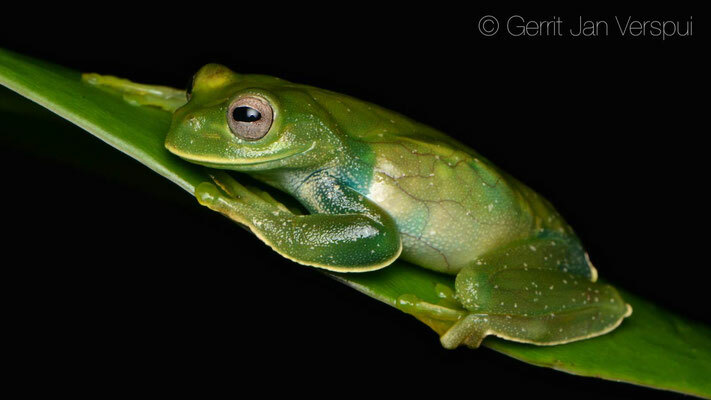 In the afternoon I photographed some animals from the night before and after that I released them. 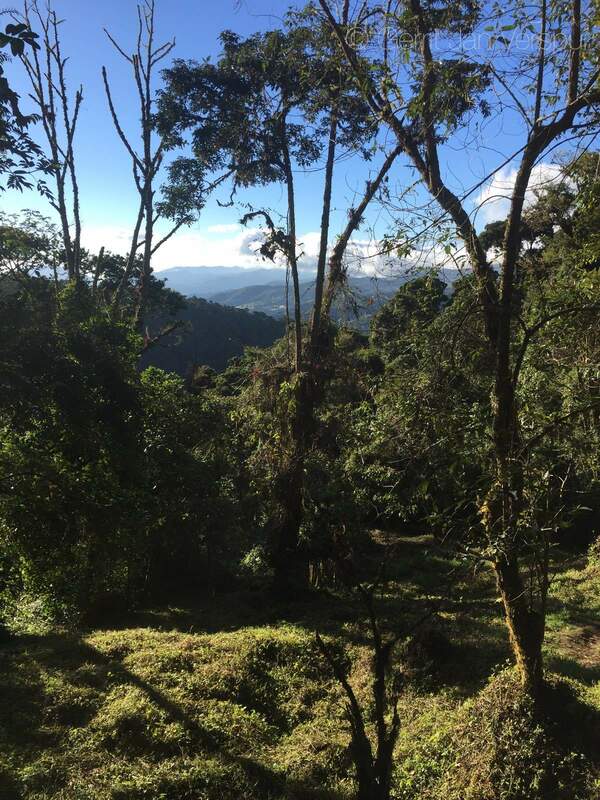 In the evening we did an other hike and this time we climbed up the mountain a bit more and did a trail there, we were with 5 guys now, Andrey Solís also joined. 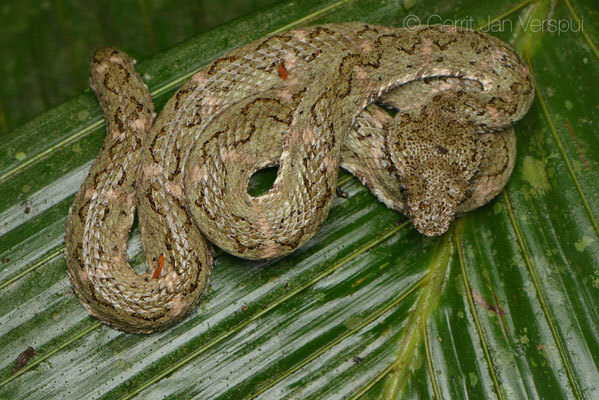 Donald was walking up front and we were behind him, many amphibians were spotted along the way and even some snakes, Donald found a Tamaga (Hog-nosed Pit Viper) on the ground with his head up on a big leaf and on top of that leaf was an Eyelash Viper, it was a very cool situation to witness, but unfortunately both snakes started moving when I wanted to make photos. 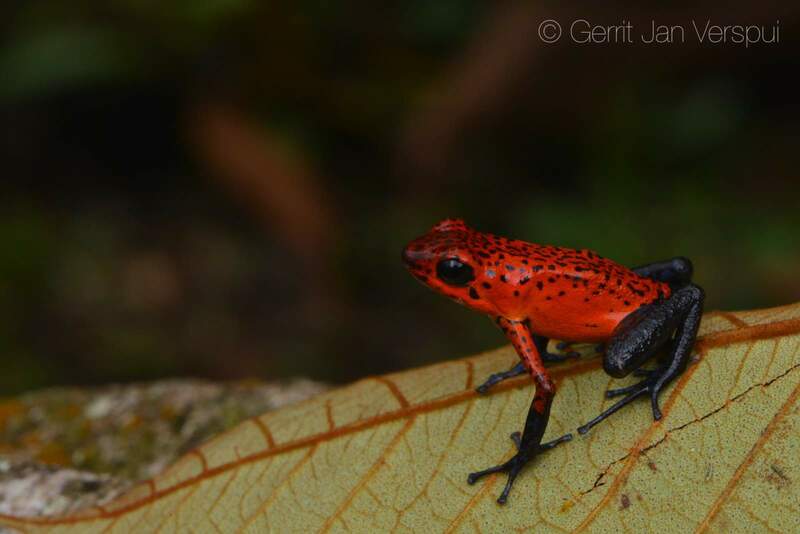 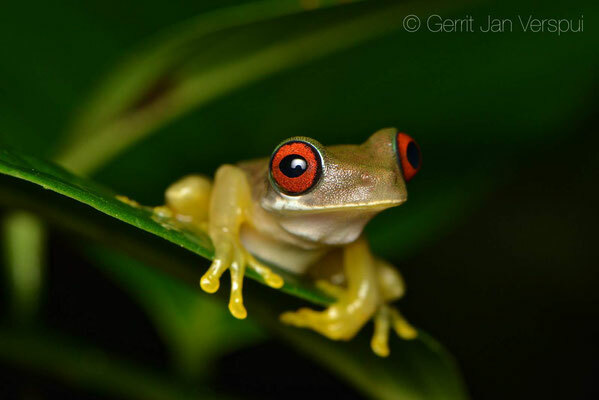 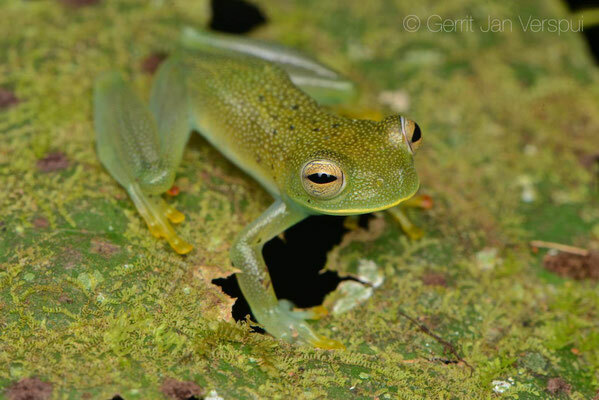 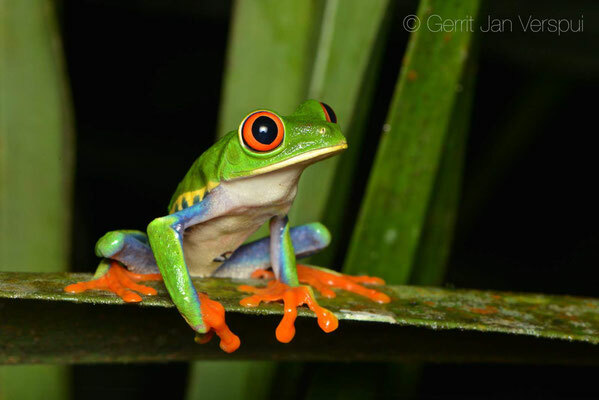 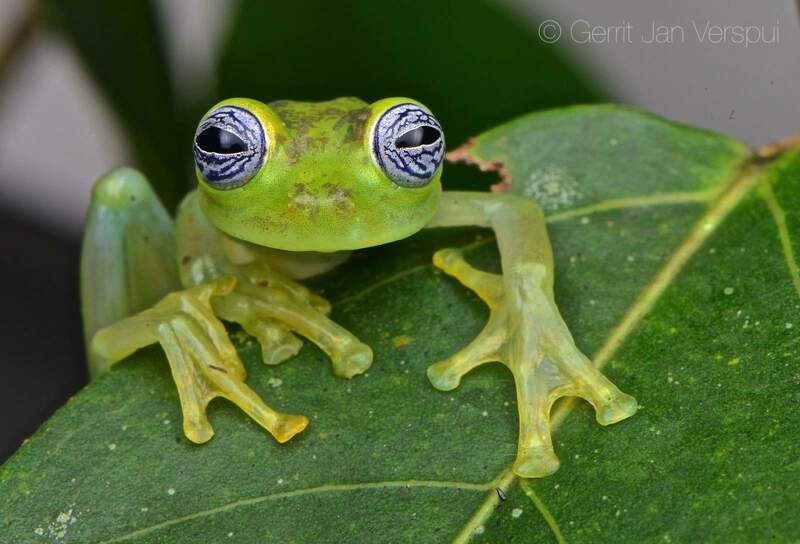 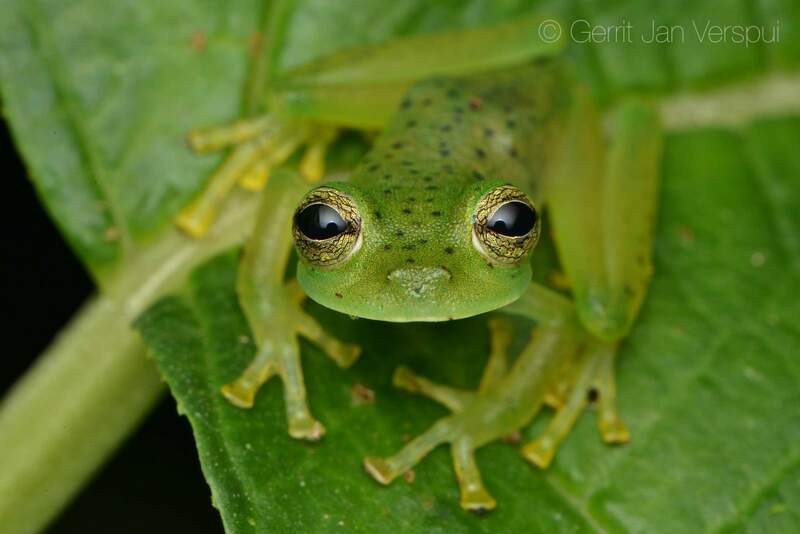 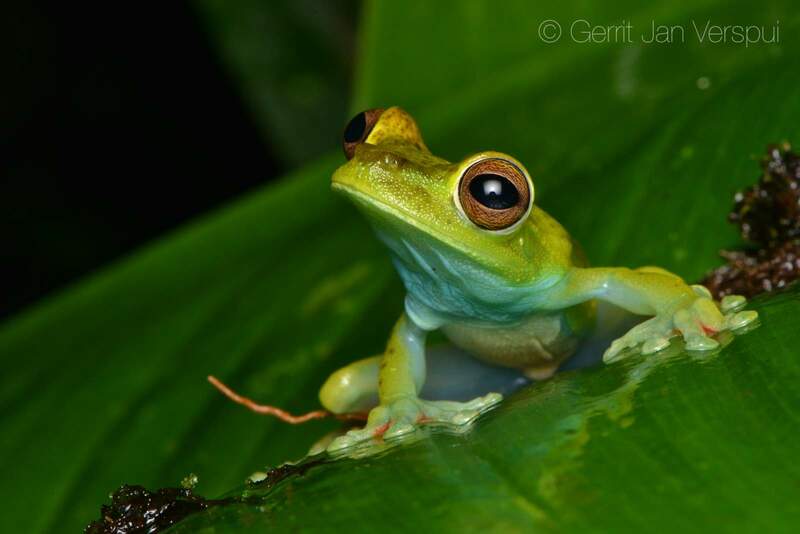 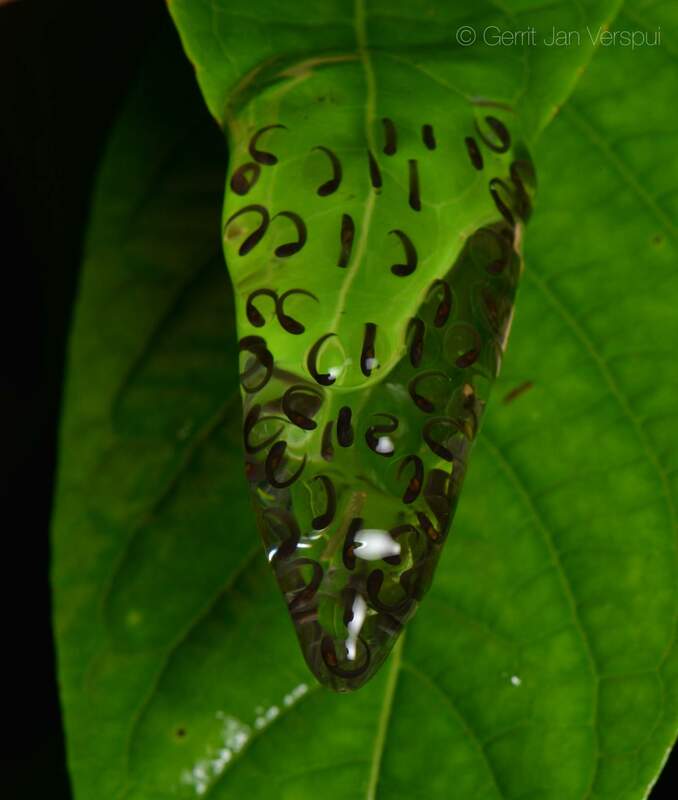 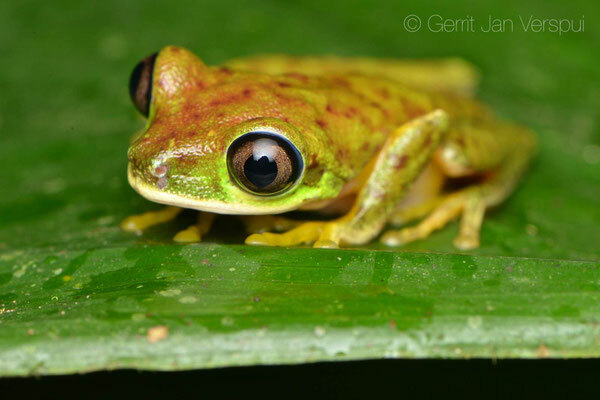 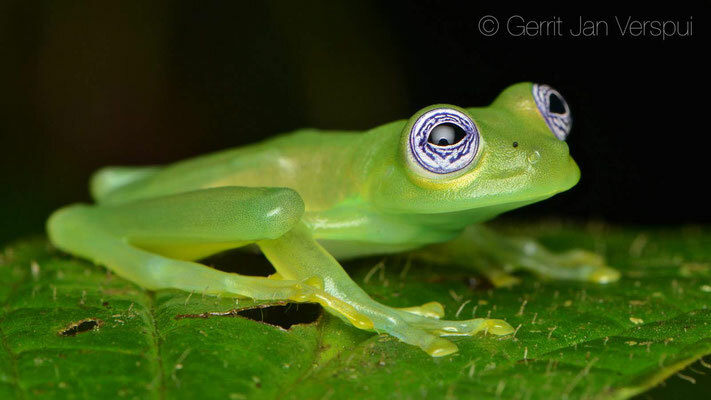 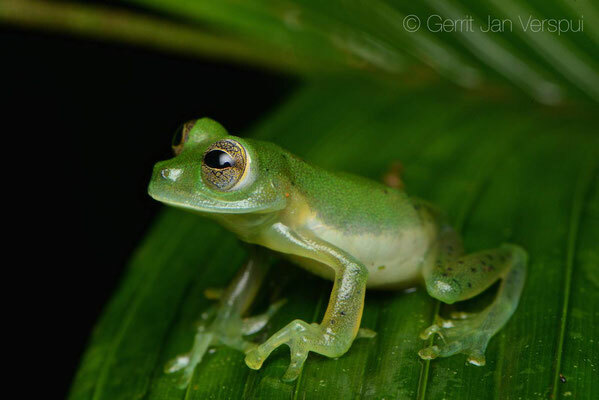 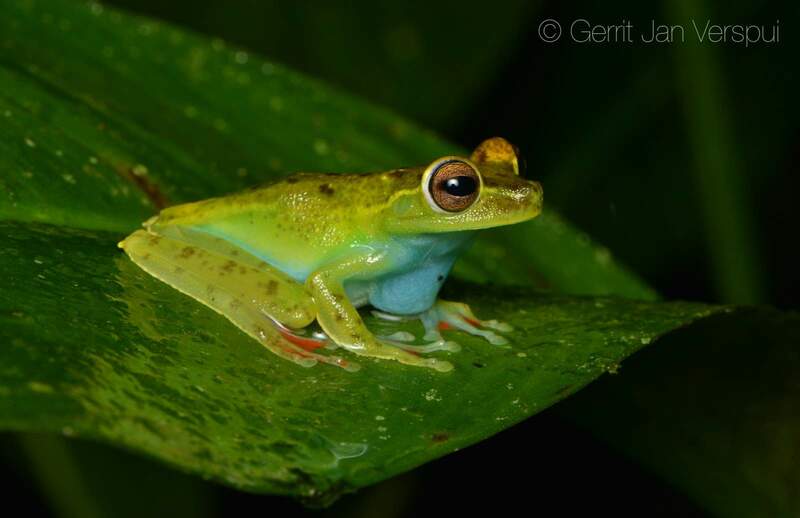 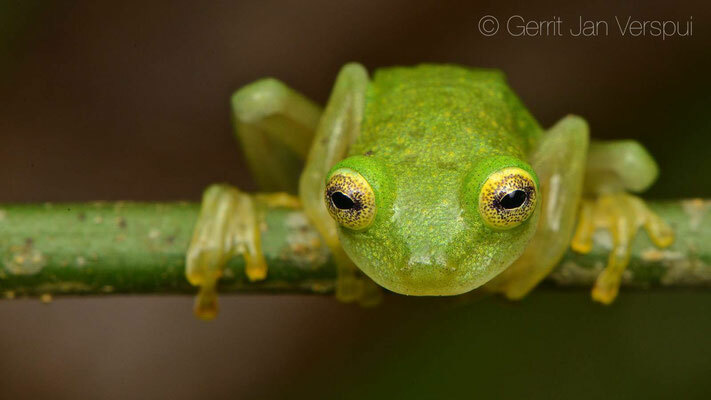 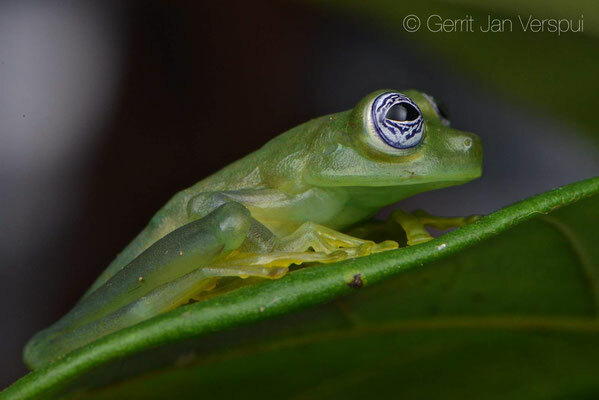 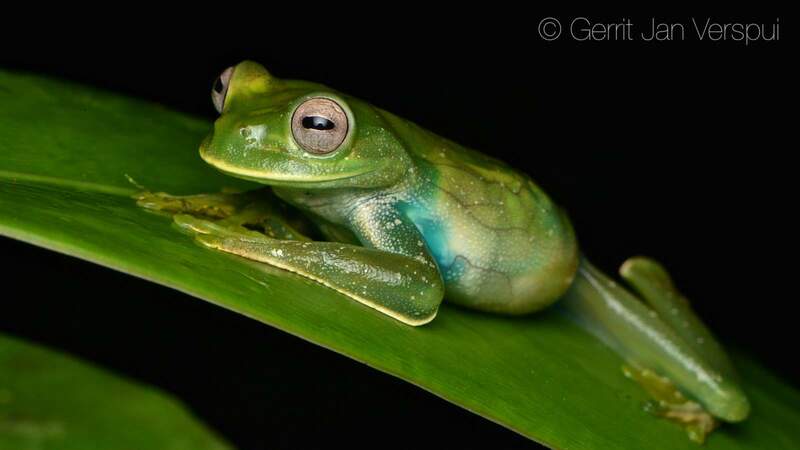 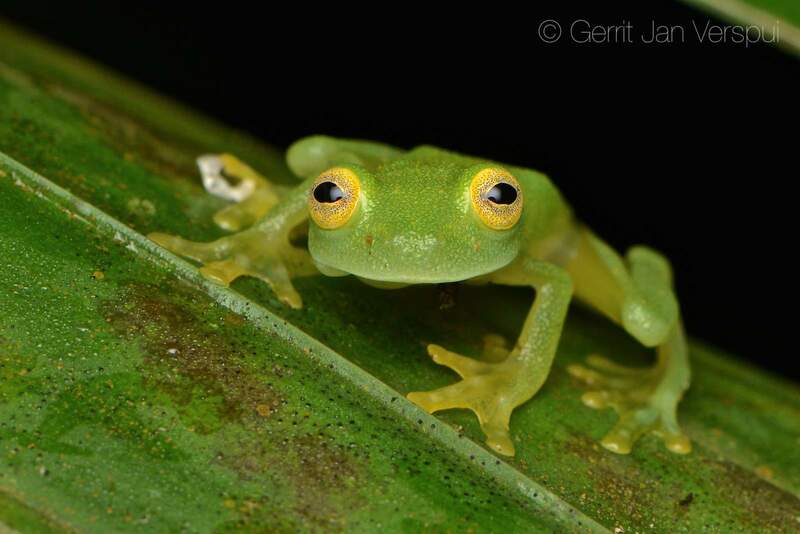 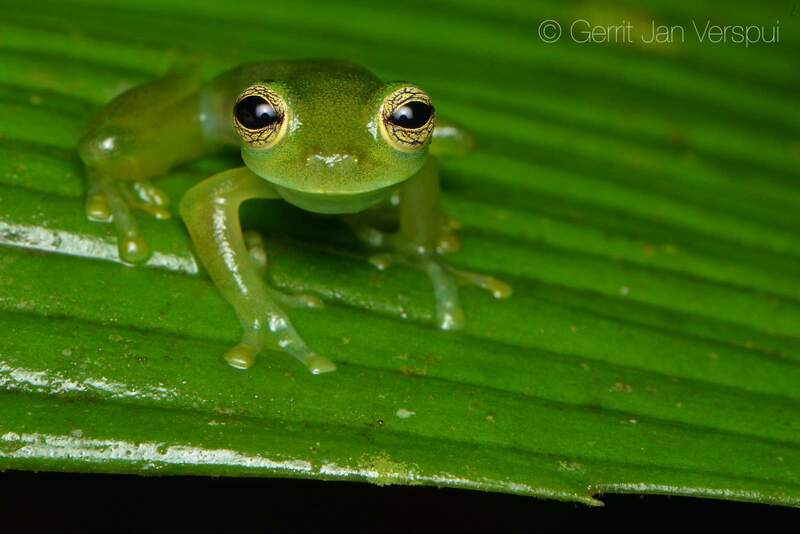 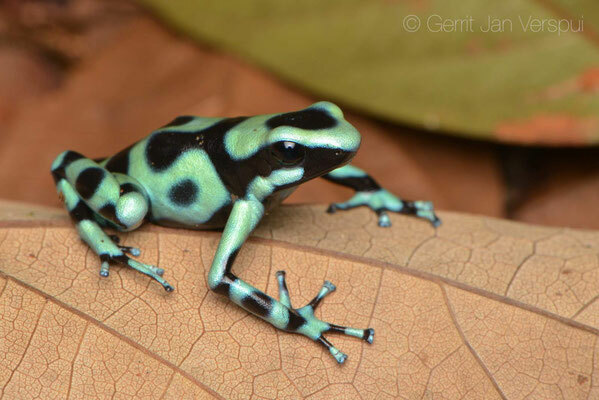 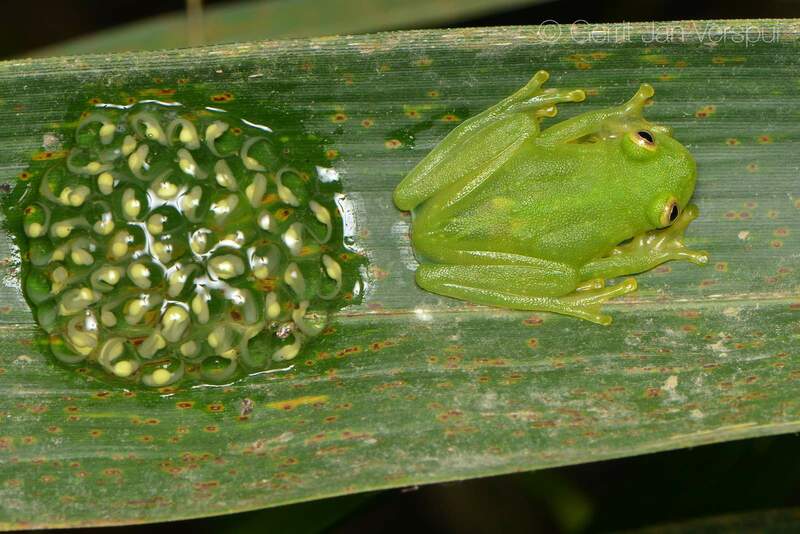 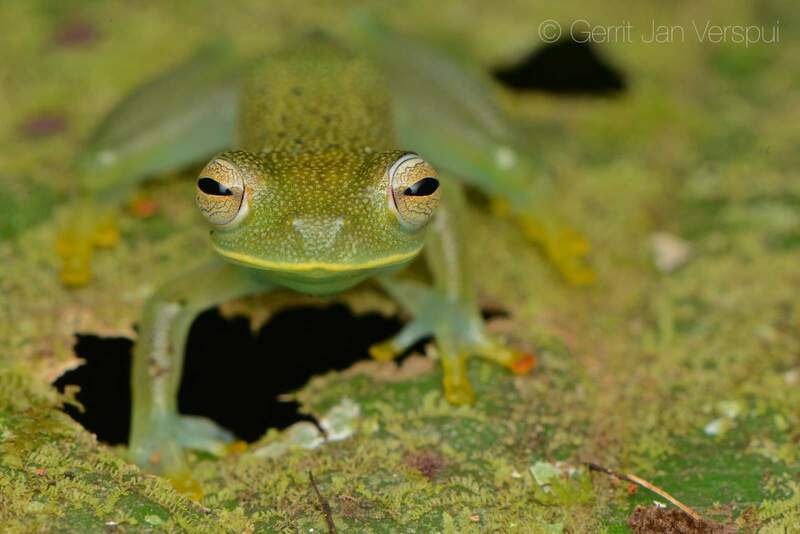 An other reason for visiting Costa Rica again was that I wanted to see more Glass frog species in that country, in 2015 I found 7 out of 14 species already and now I wanted to see new ones. 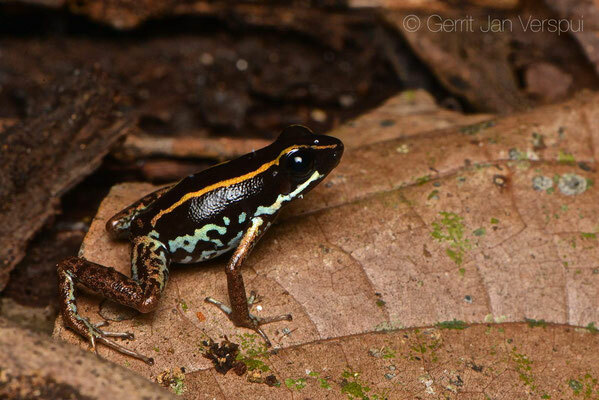 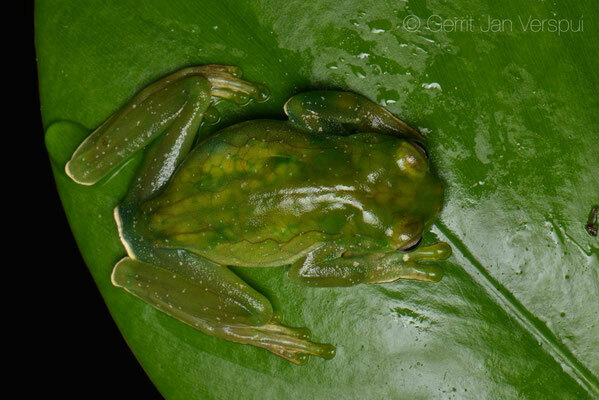 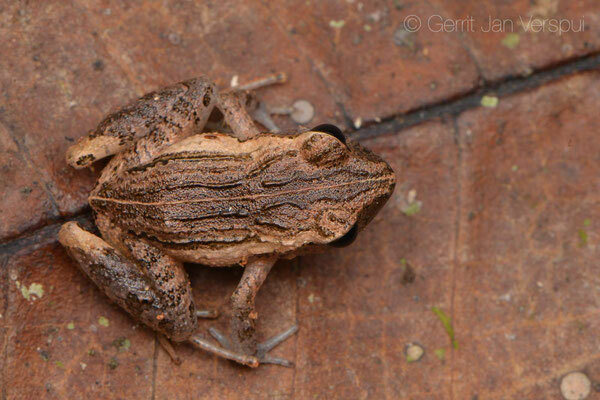 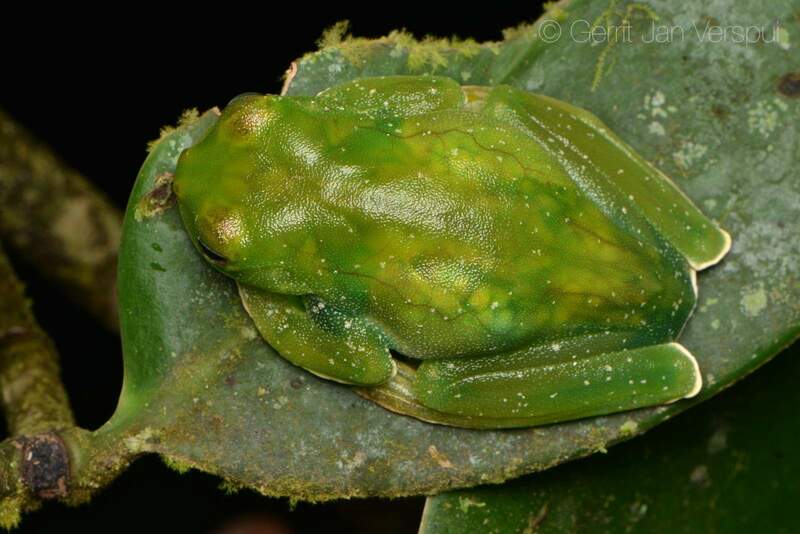 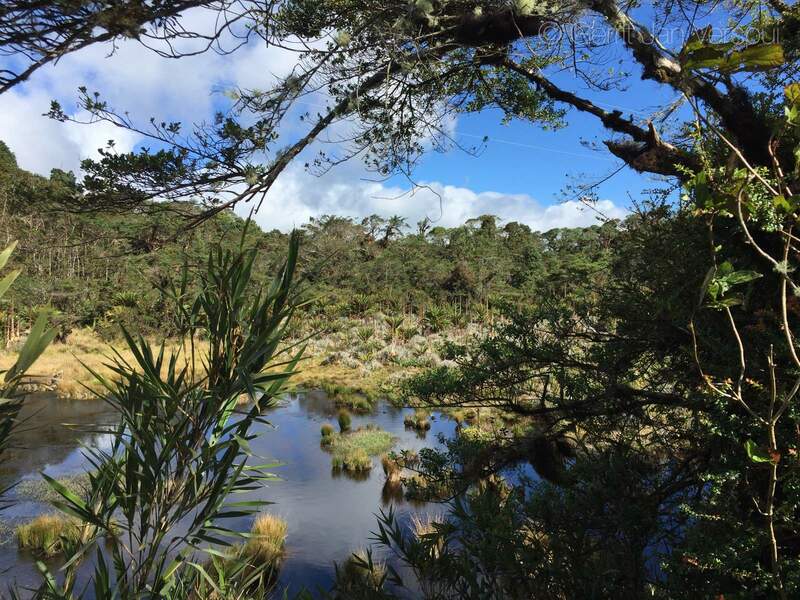 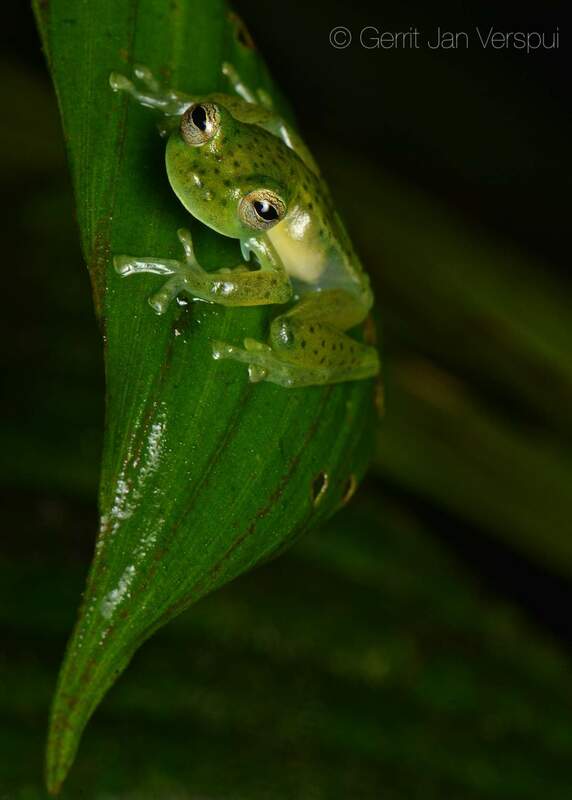 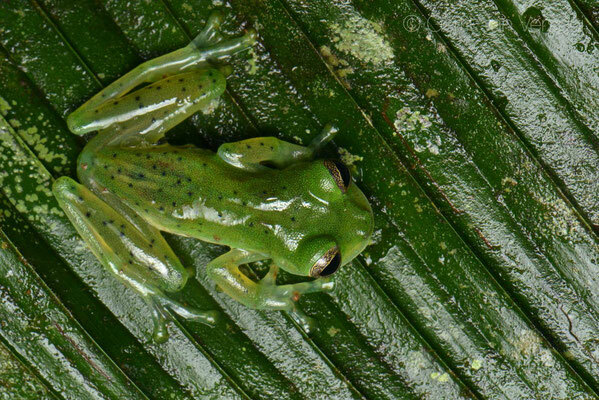 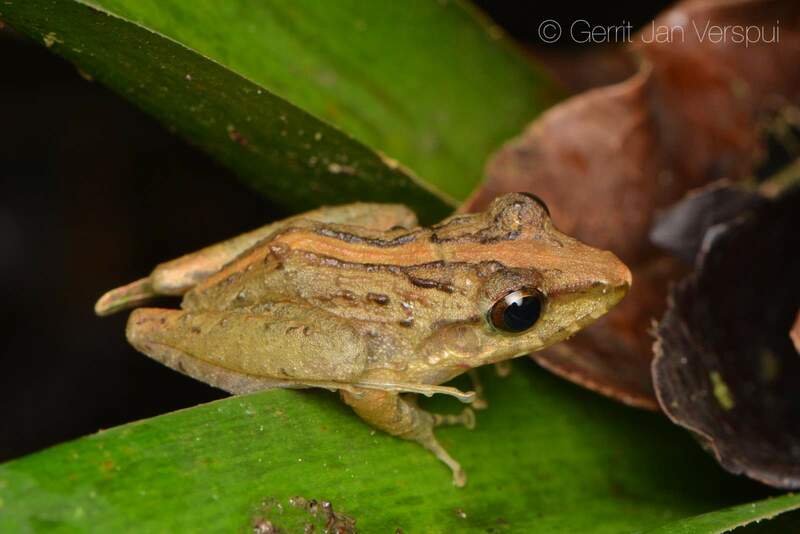 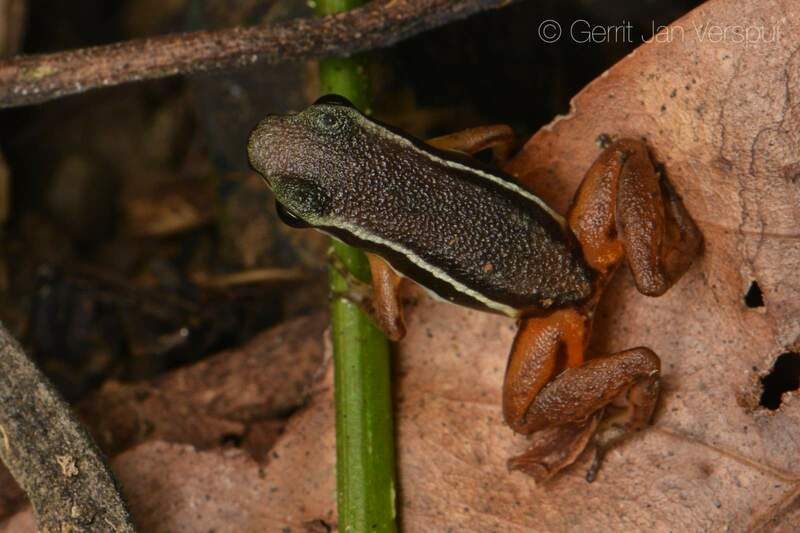 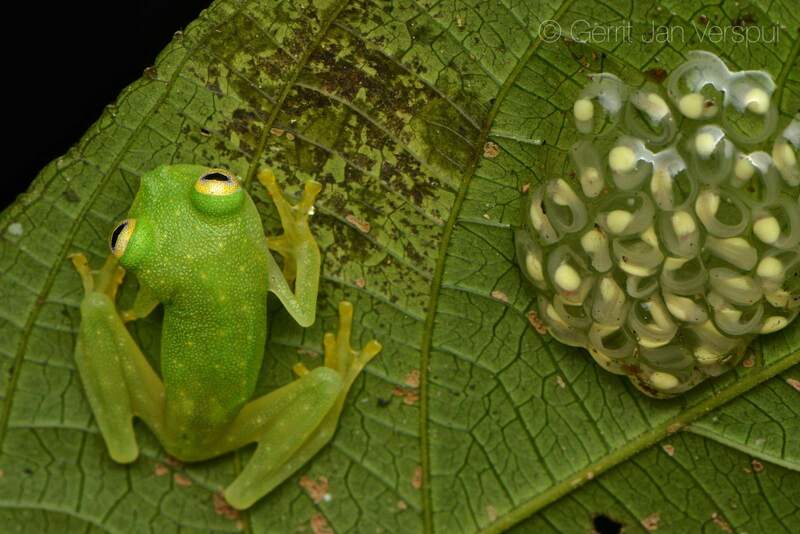 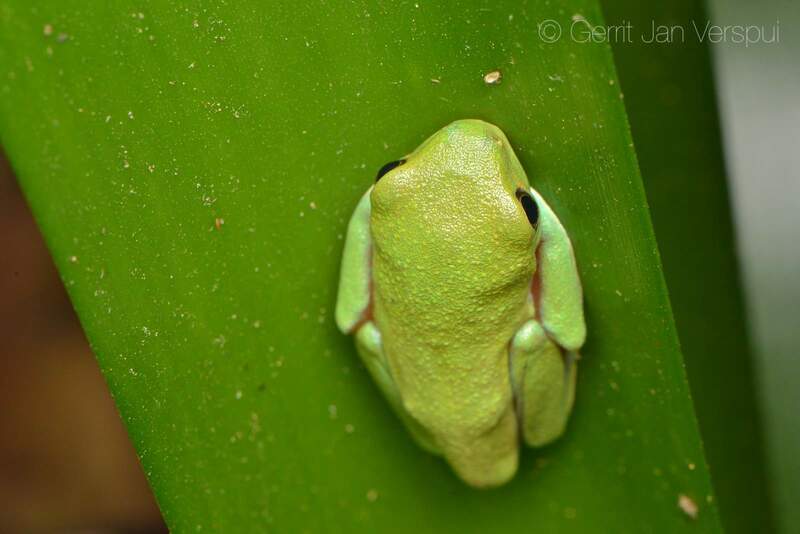 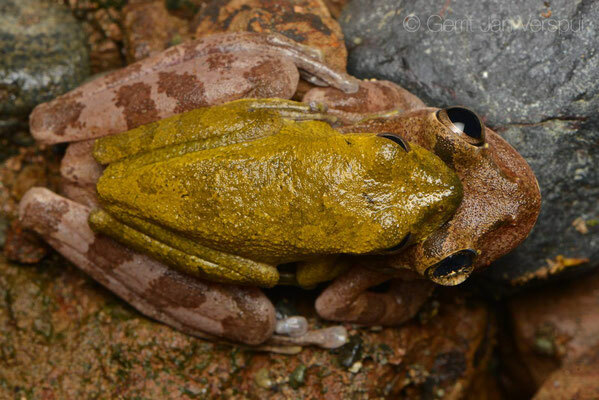 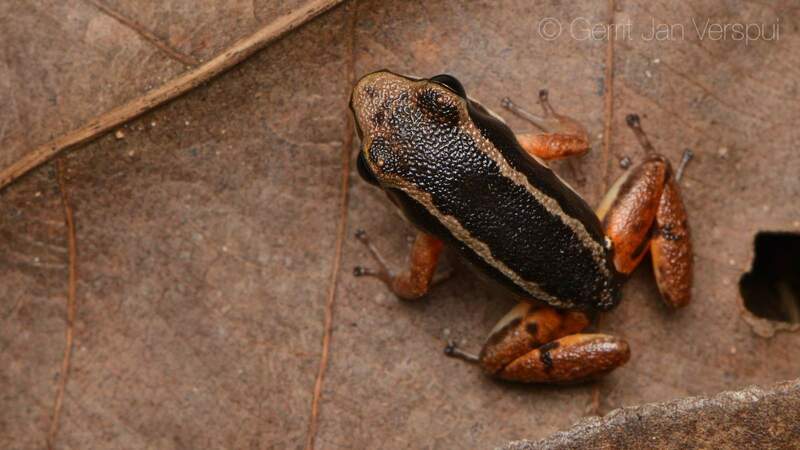 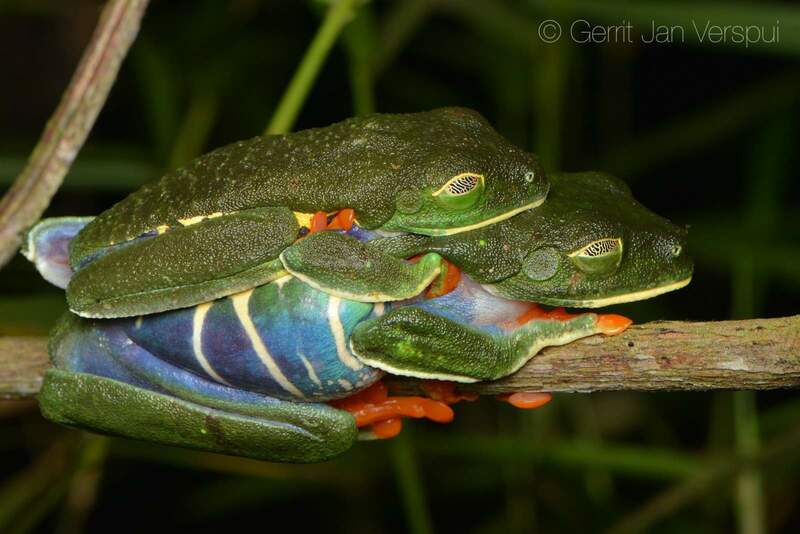 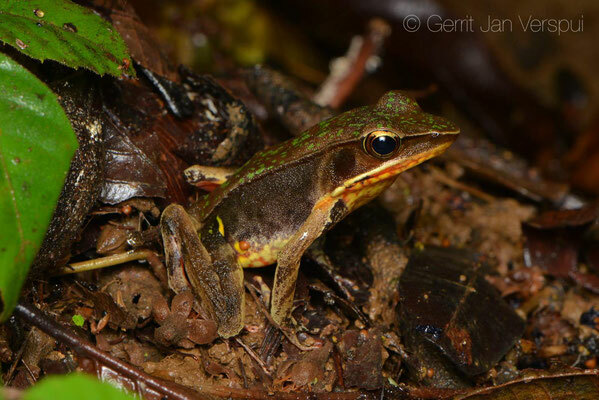 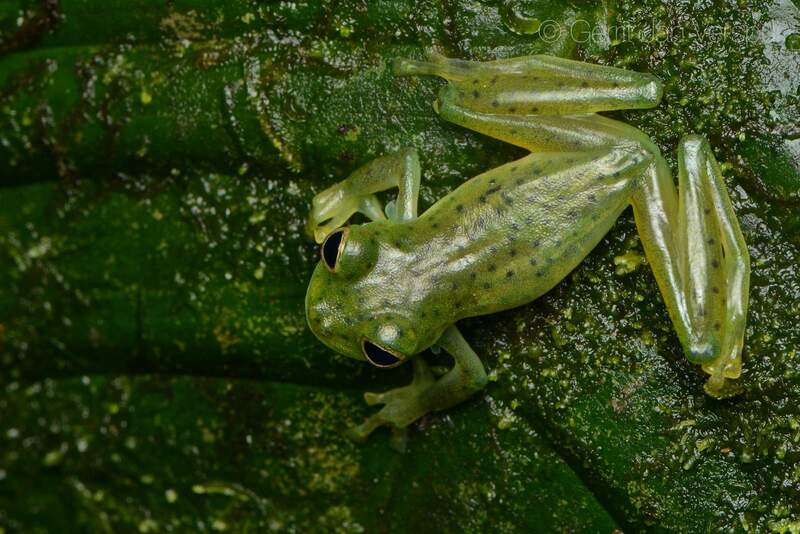 During this hike we would look for Emerald Glass frogs and we found a female first and a juvenile later. On the way back to the lodge we spotted a big frog on a hollow pole and it was the second Crowned Tree Frog, in the pole was water with tadpoles inside, most likely they were hers. 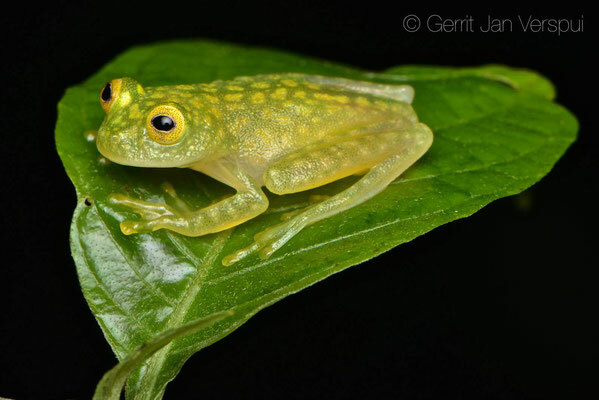 Around midnight we were back at the lodge, but me and Andrey were far from done yet, we decided to search a bit more around a stream with 3 species of glass frogs. 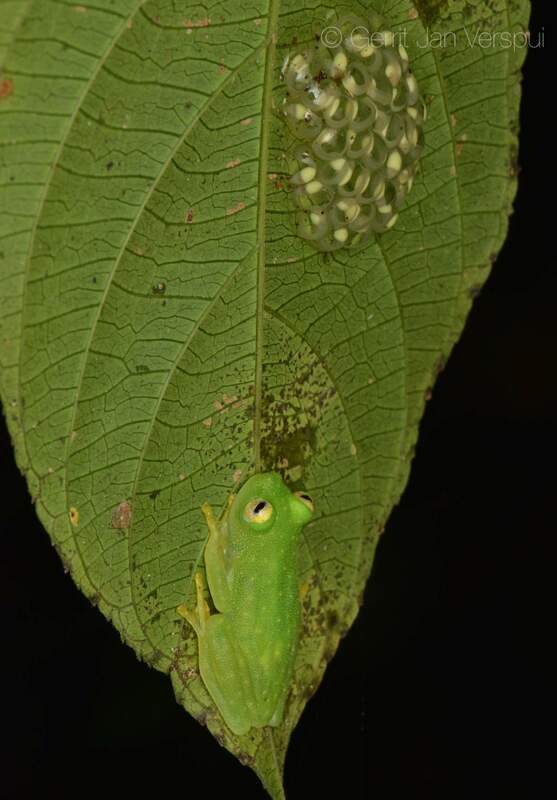 We found many cool things there, a male and a female Emerald Glass Frog, many Dwarf Glass Frogs and we tried to locate some calling Ghost Glass frogs, but they were all high up in the trees. 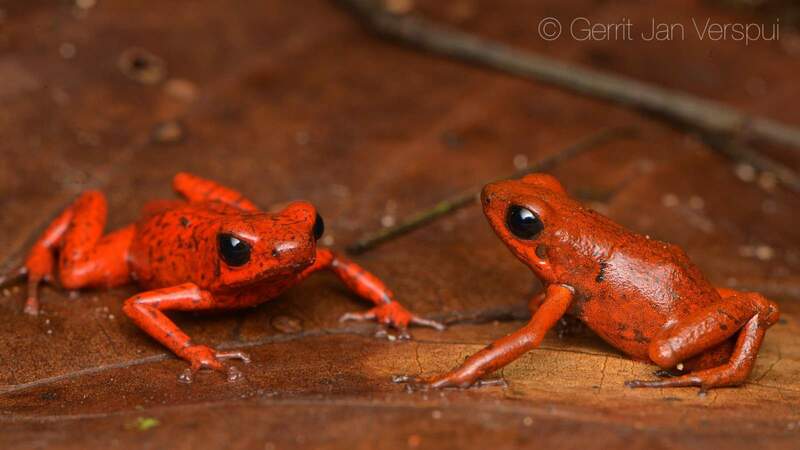 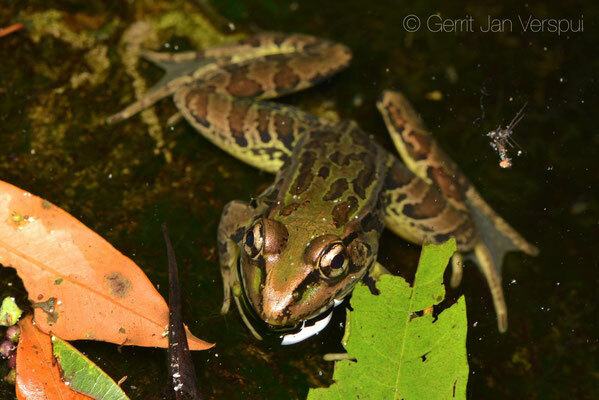 The best way for finding most amphibians is knowing and recognizing their calls and I must say this is pretty hard in a place like this, but it turned out to be the best option every time. 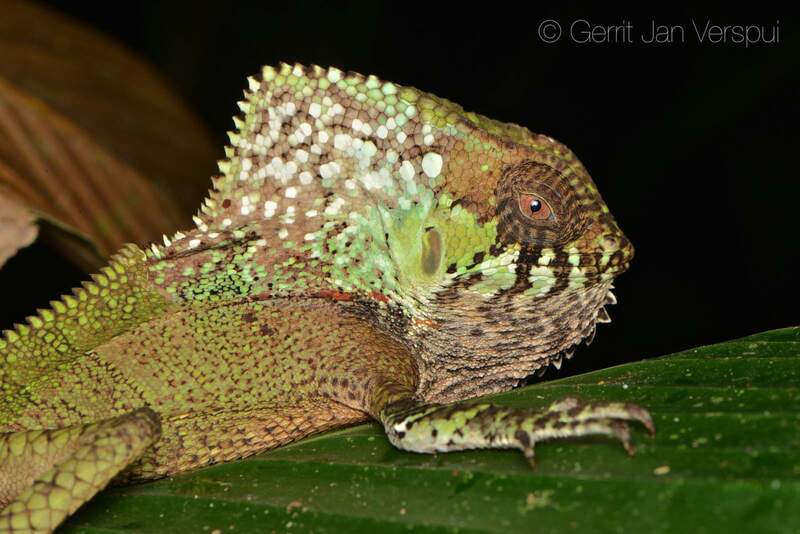 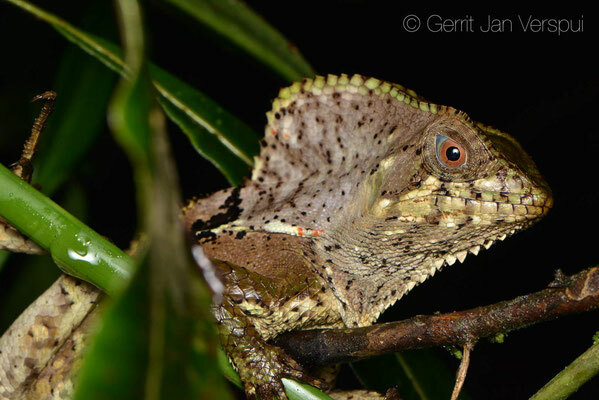 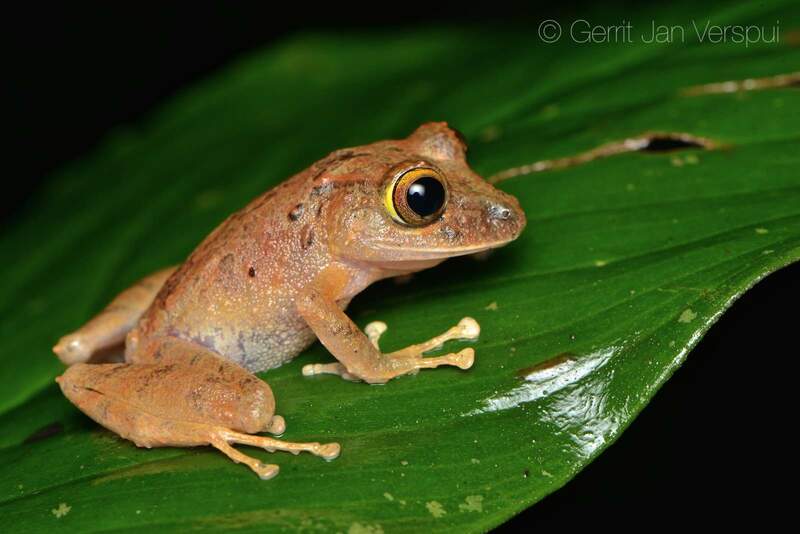 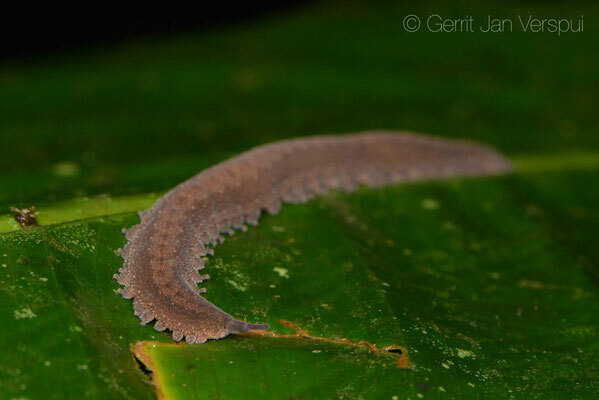 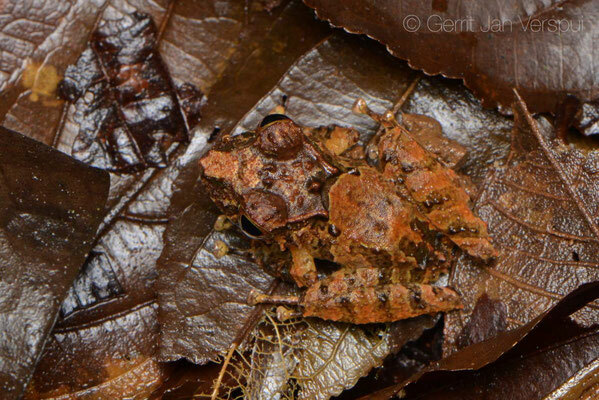 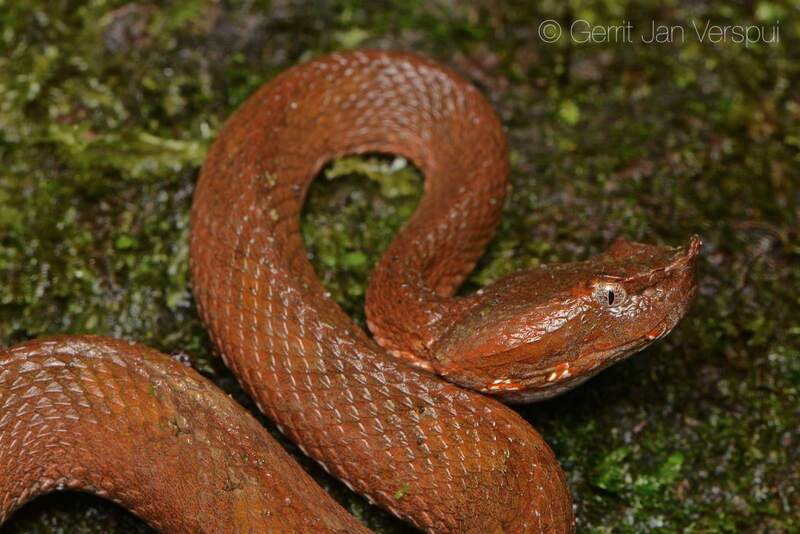 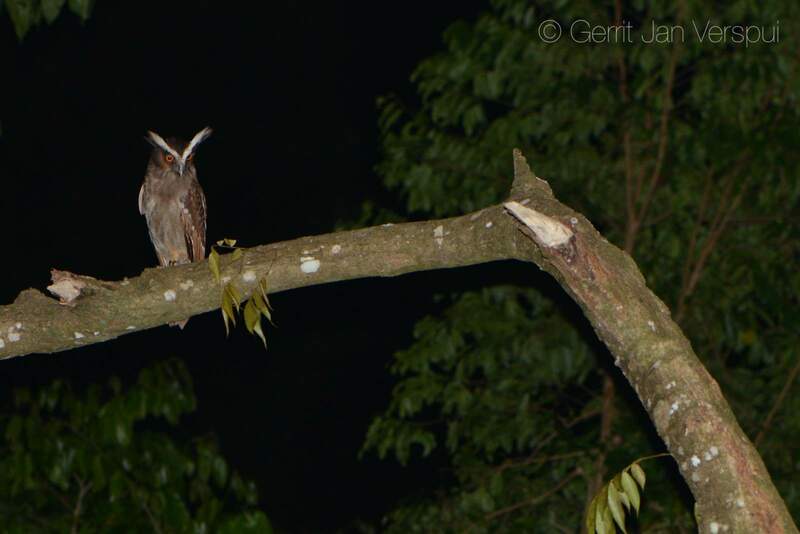 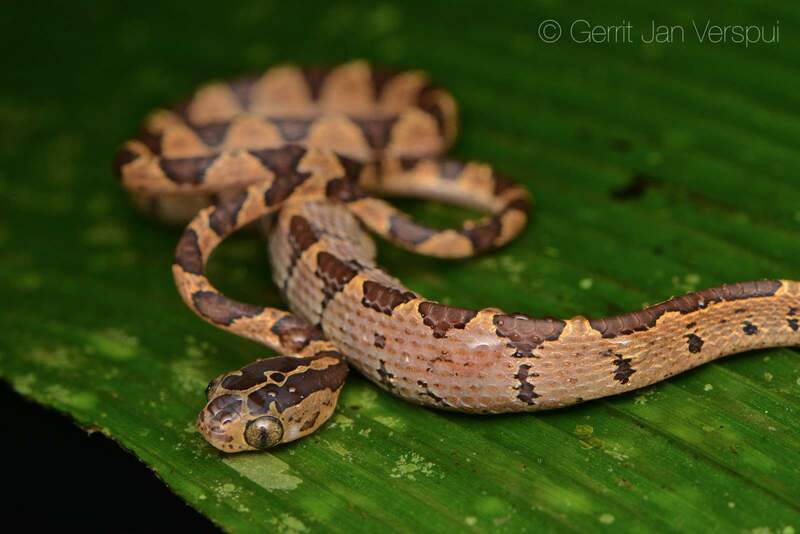 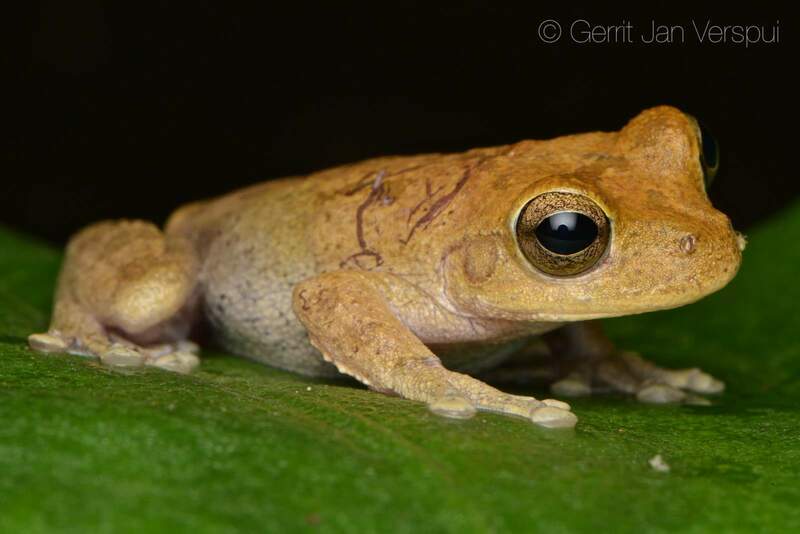 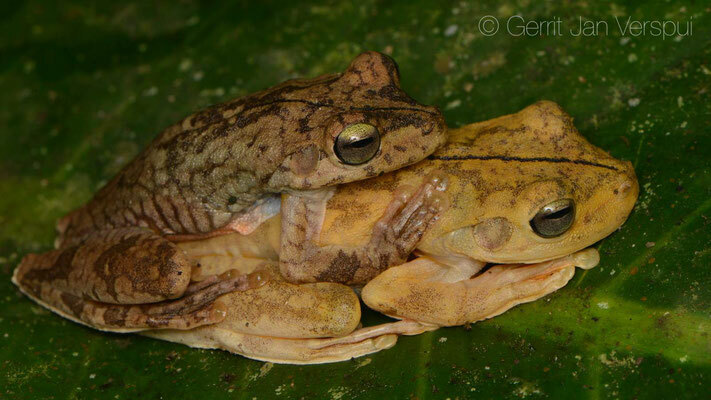 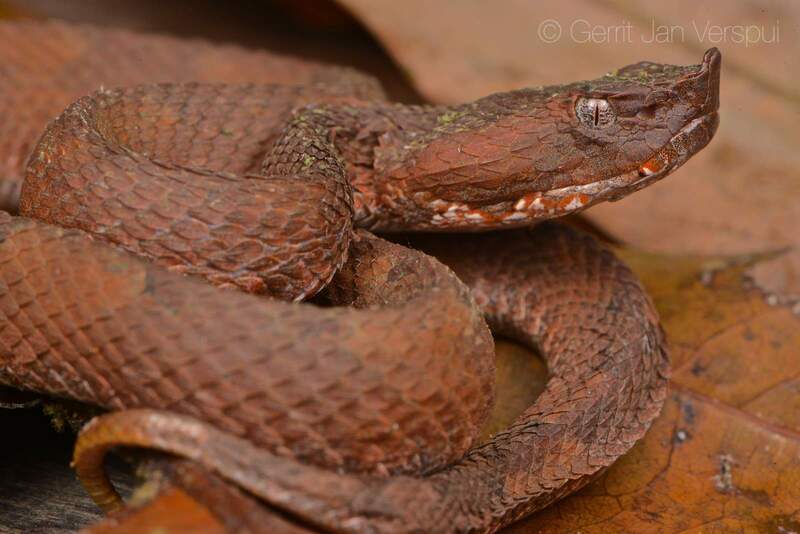 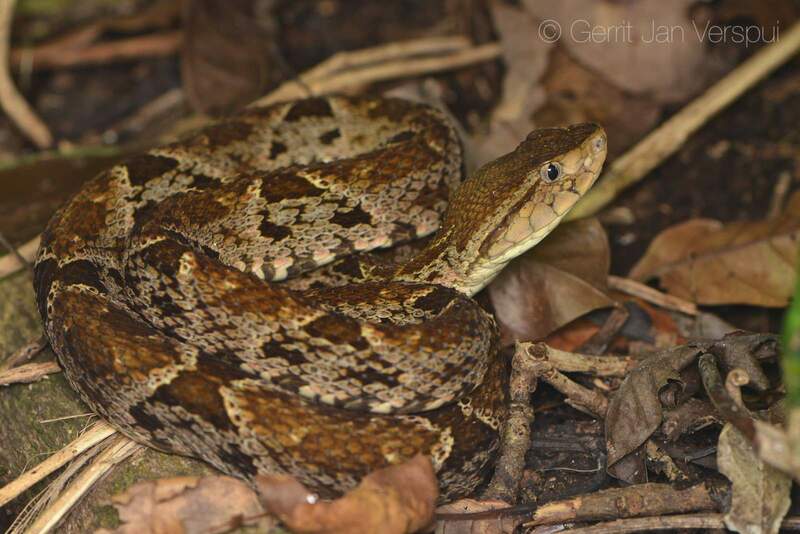 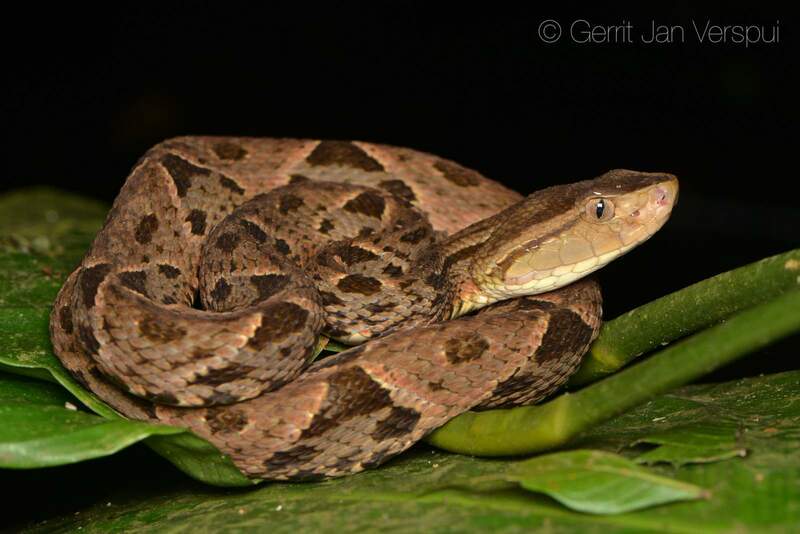 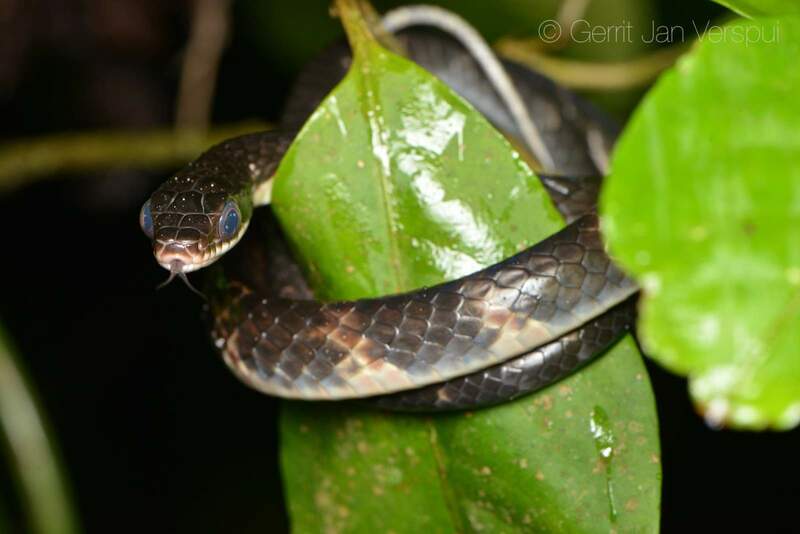 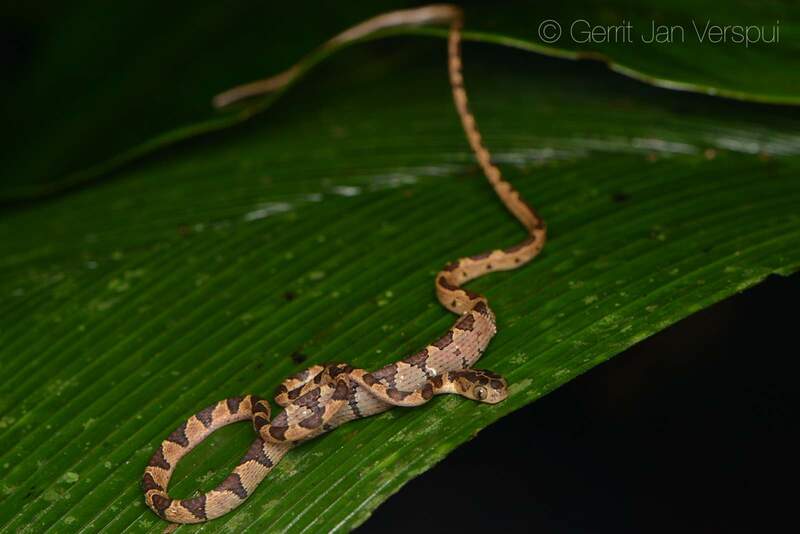 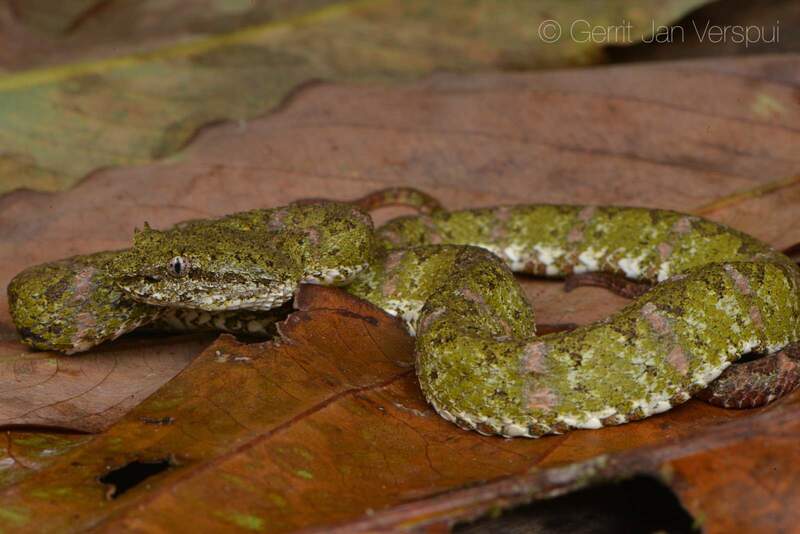 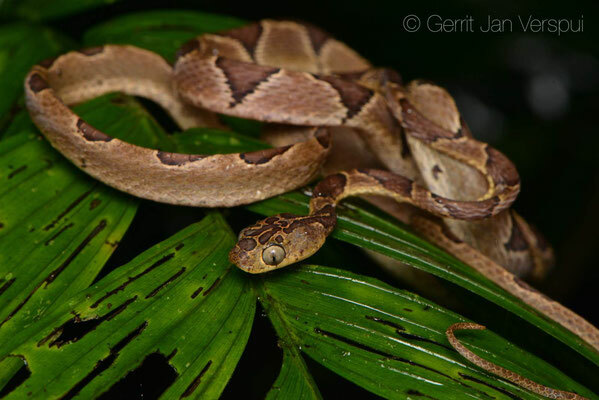 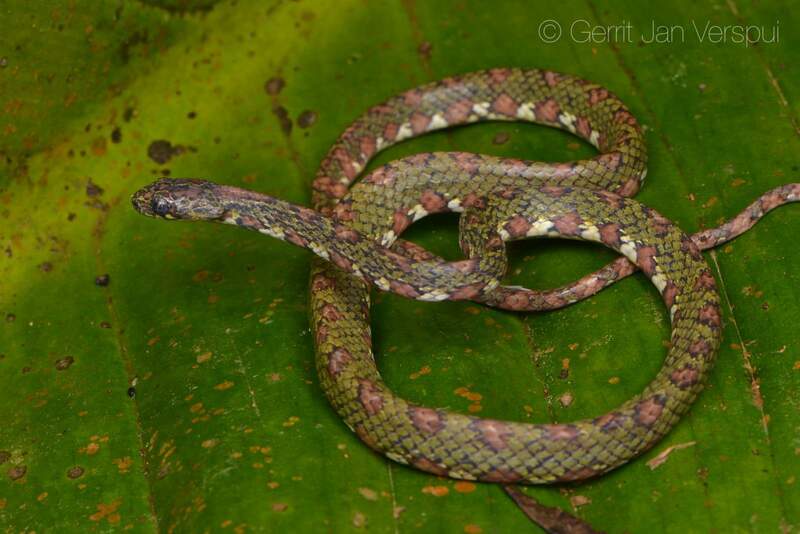 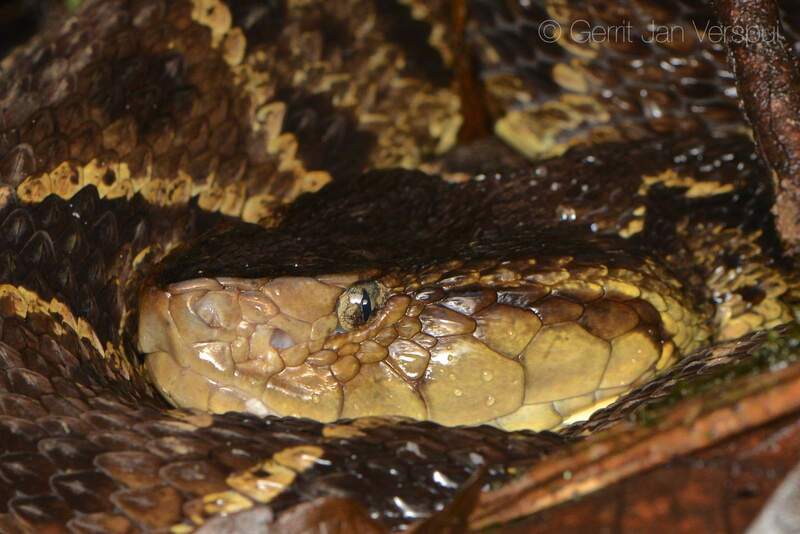 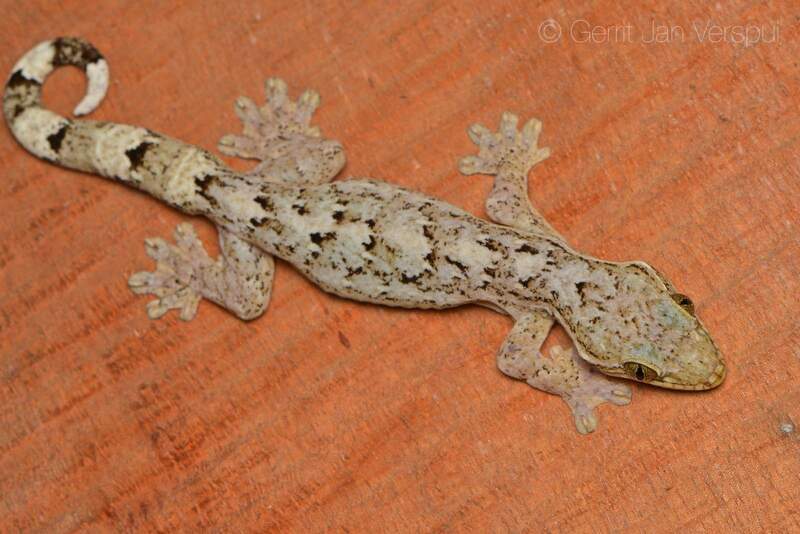 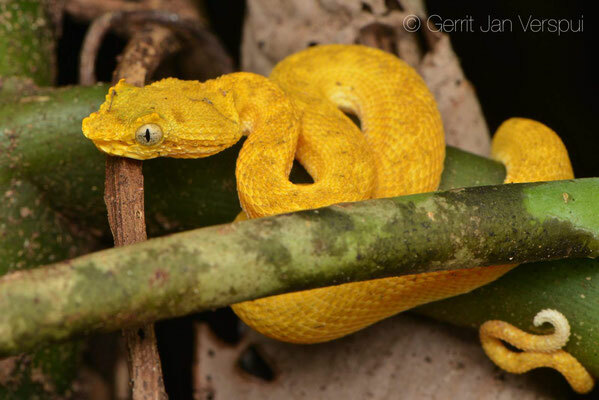 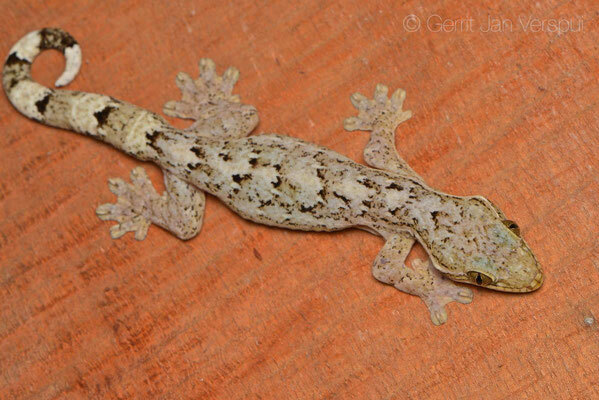 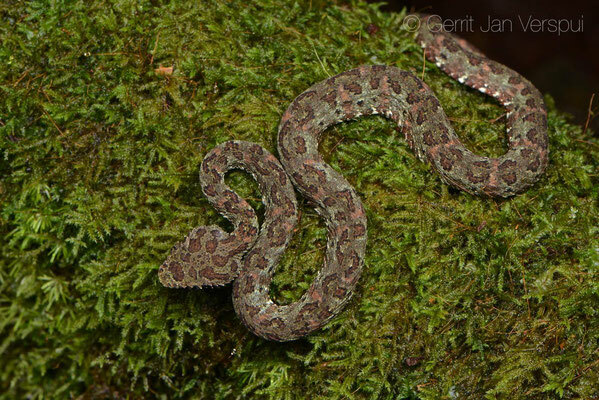 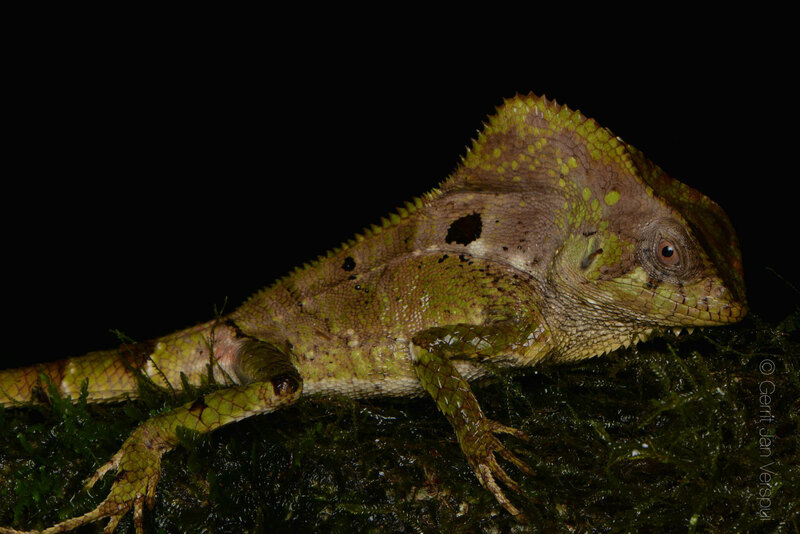 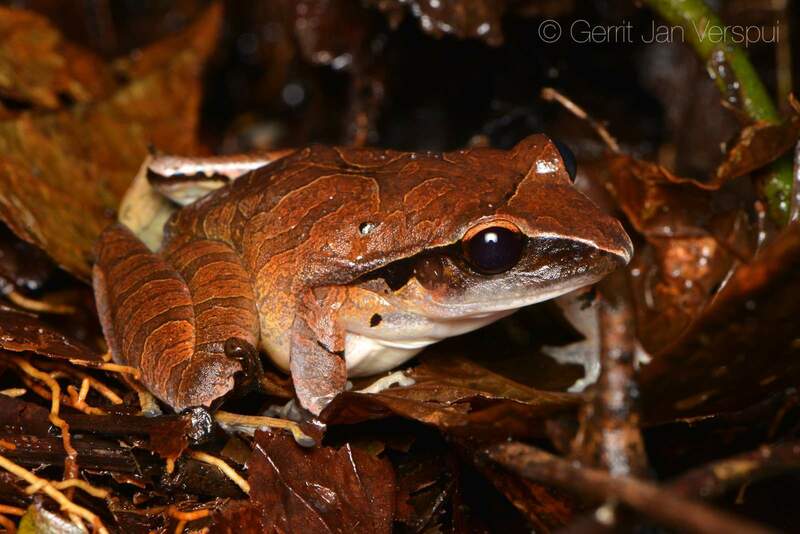 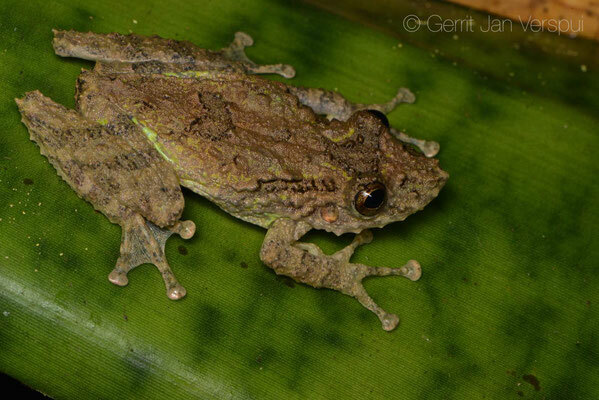 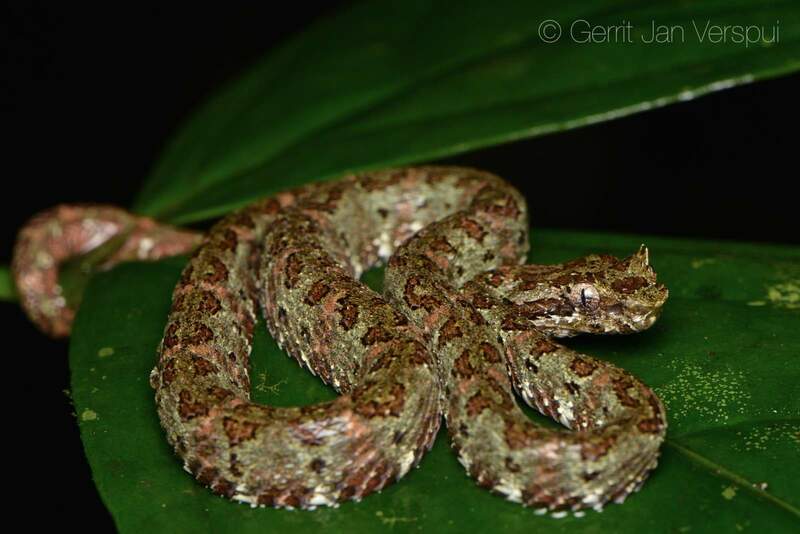 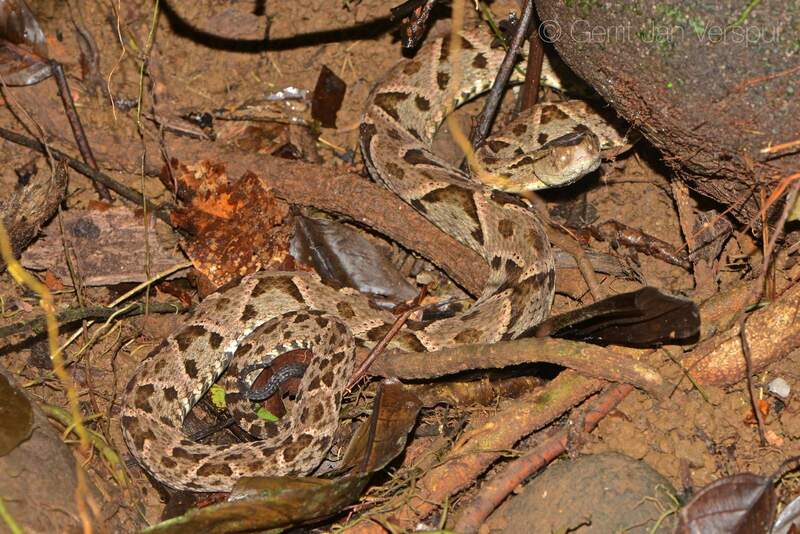 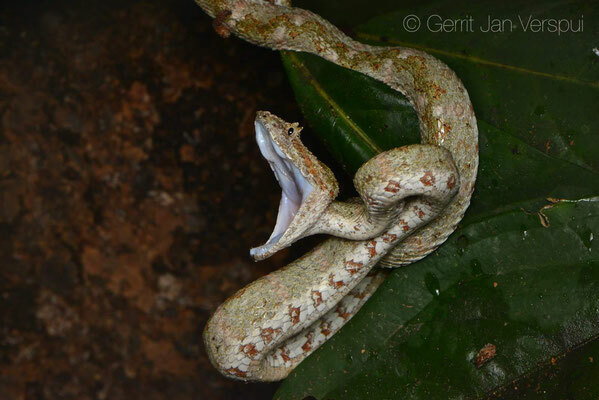 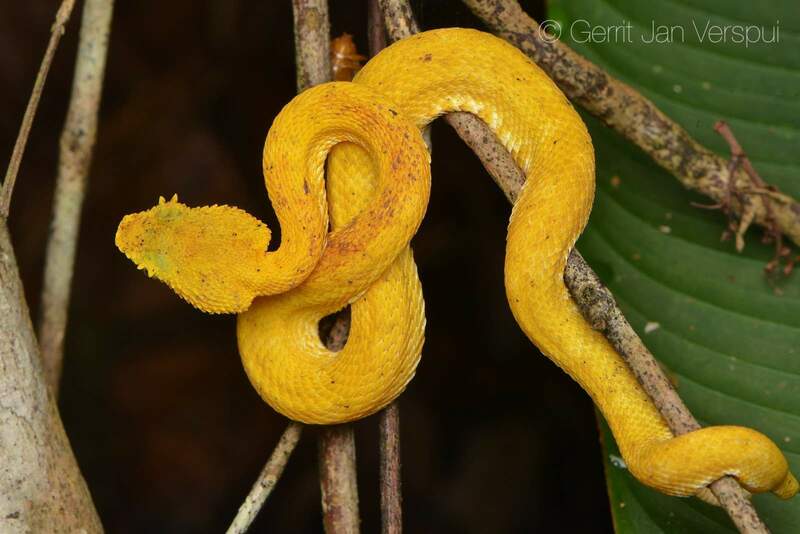 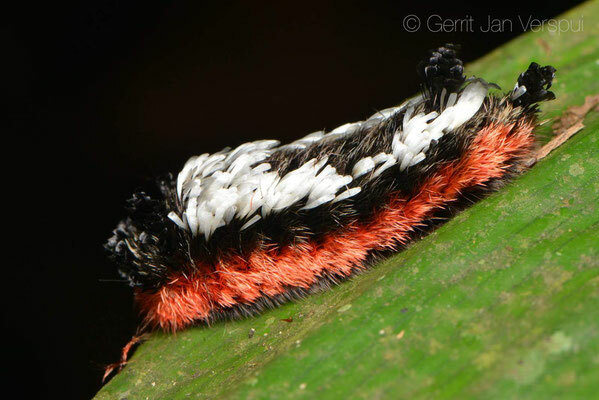 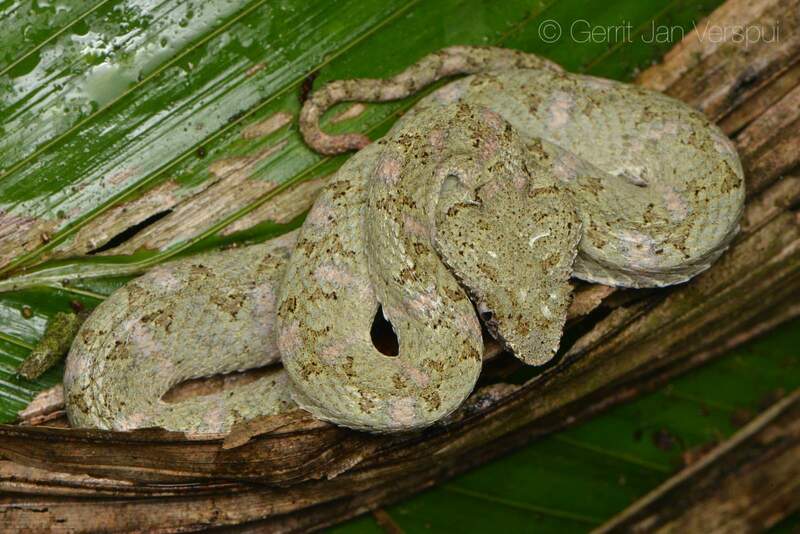 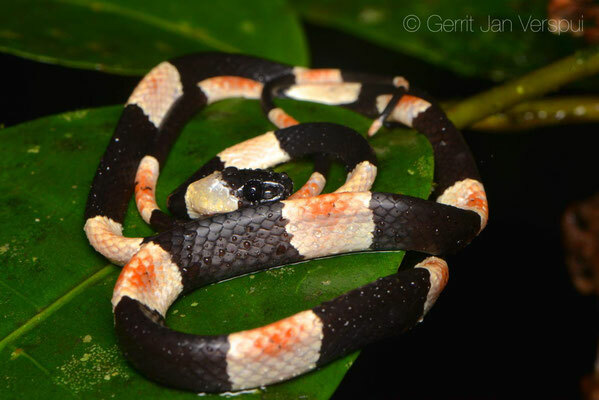 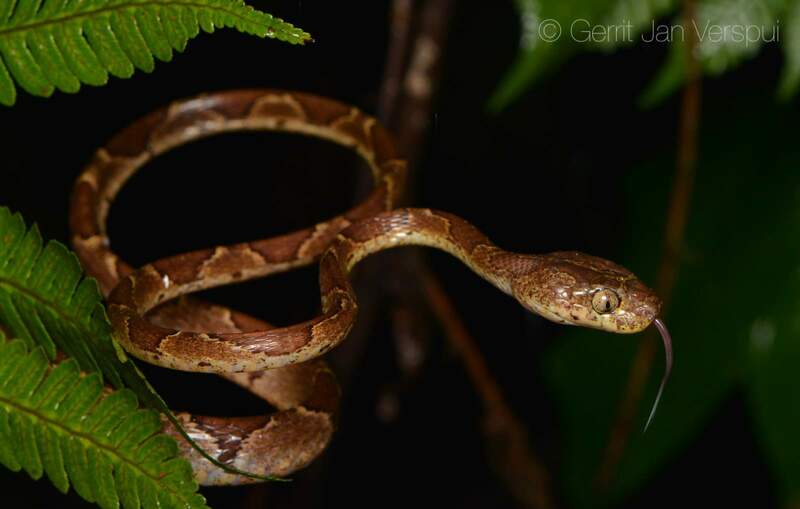 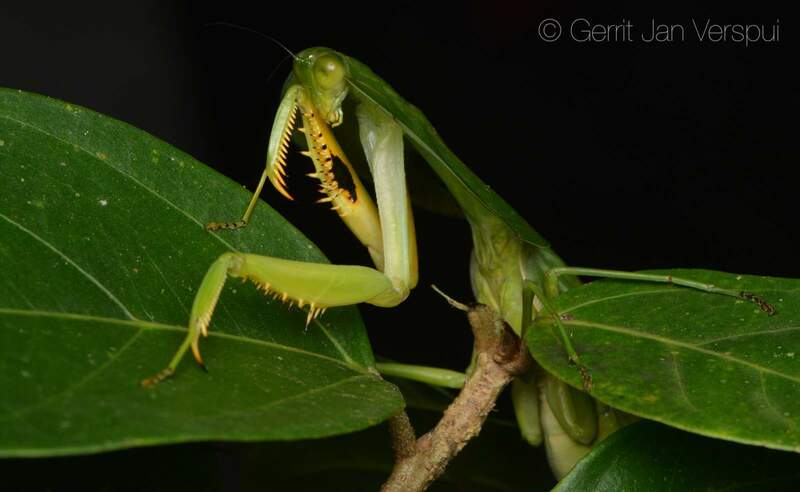 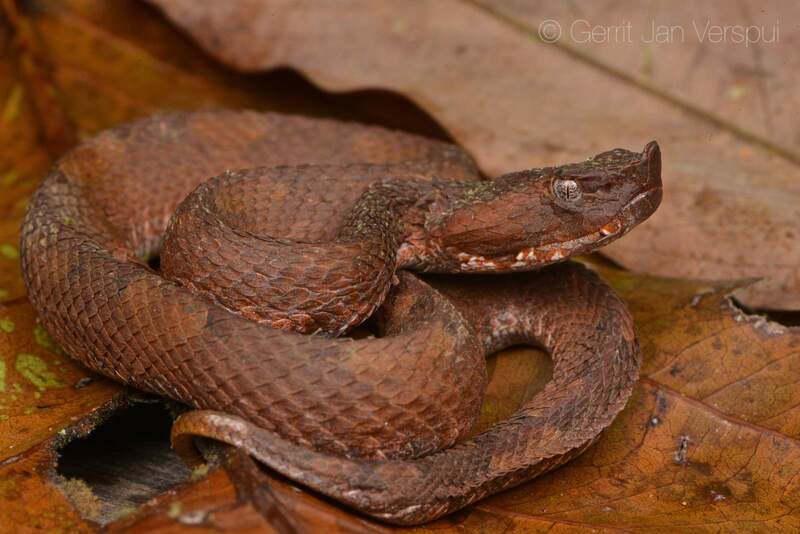 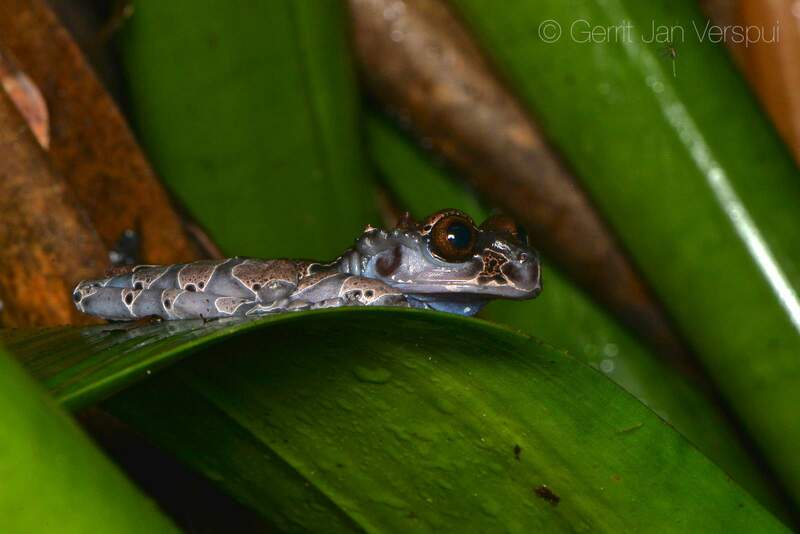 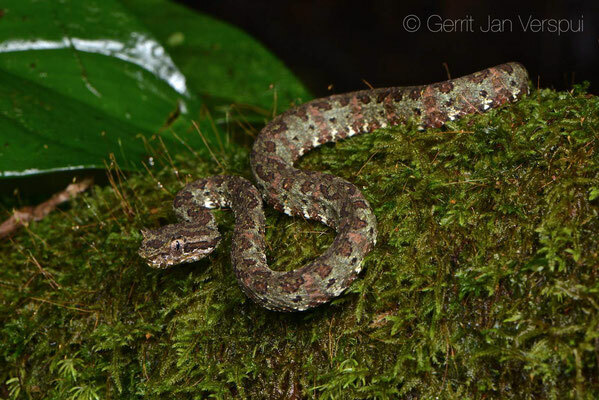 While we were searching we also found an other Eyelash viper and a Snail Eater, so around 04:00 we went to bed. 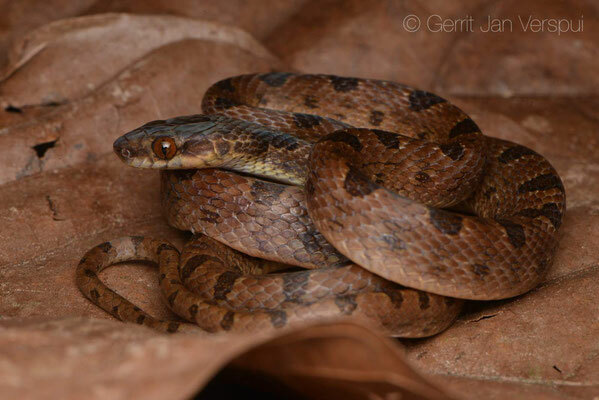 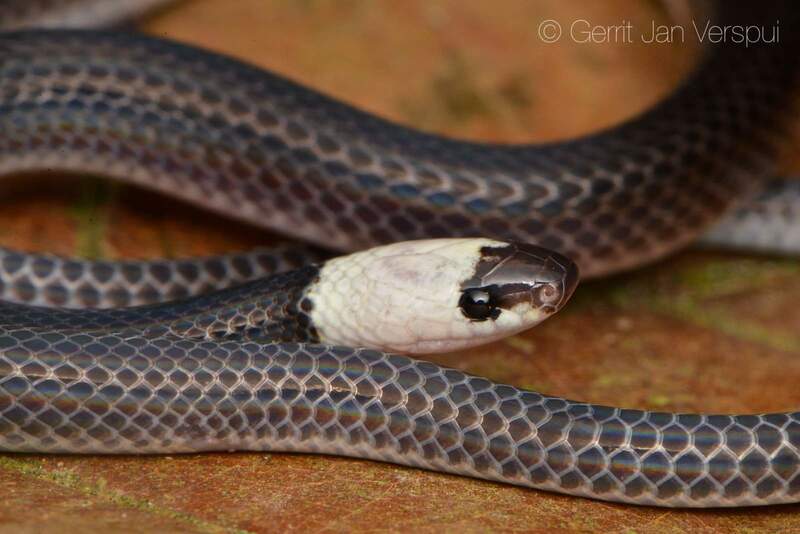 This day was used for photographing the snakes that were found, the Geophis snakes are not easy to determine, one was clear to me, but the other was not, so Im not sure which species it is. 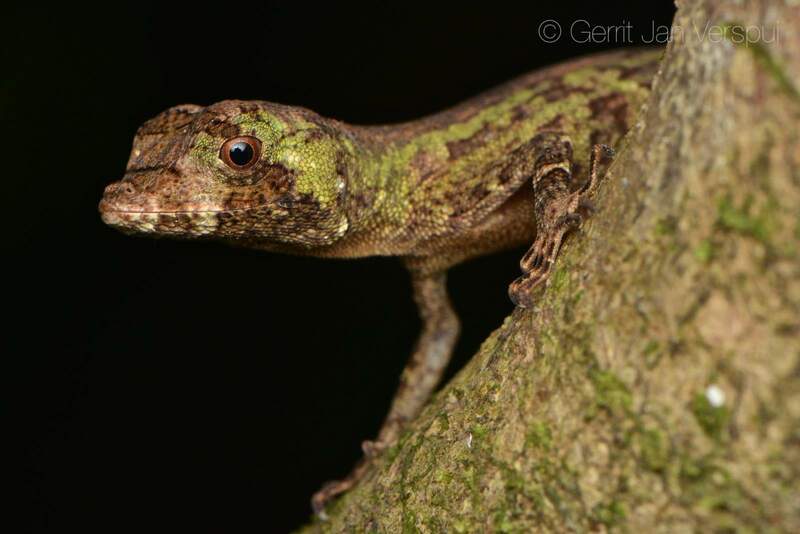 Twan Leenders jumped in and helped me with that one, thanks Twan! 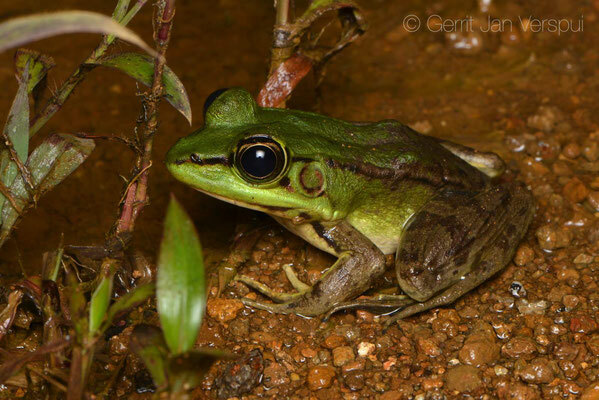 The last night hike at Yatama Eco Lodge was one a bit lower down the mountain, we walked down the road and from a certain point we found a river which we followed upstream, on the way we saw many amphibians, few of them were species we did not see before, like the Leaf Litter Toad and the Olive snouted Treefrog. 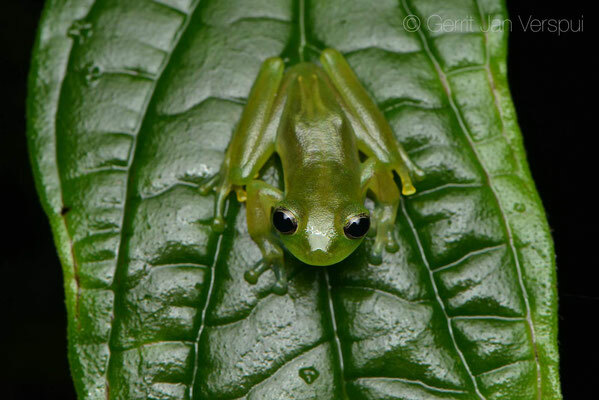 Dwarf Glass Frogs were present too, cute little noisy creatures! 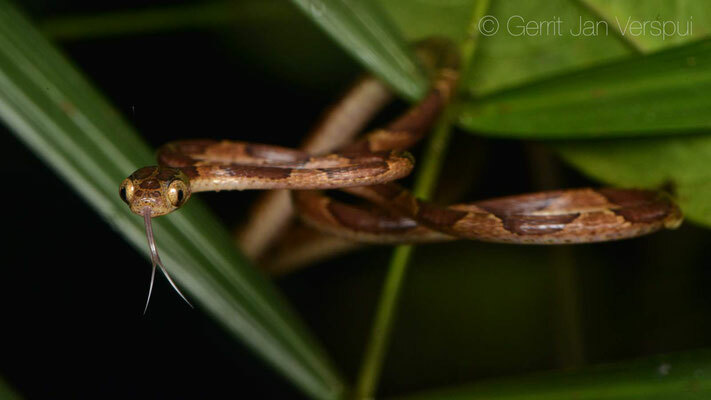 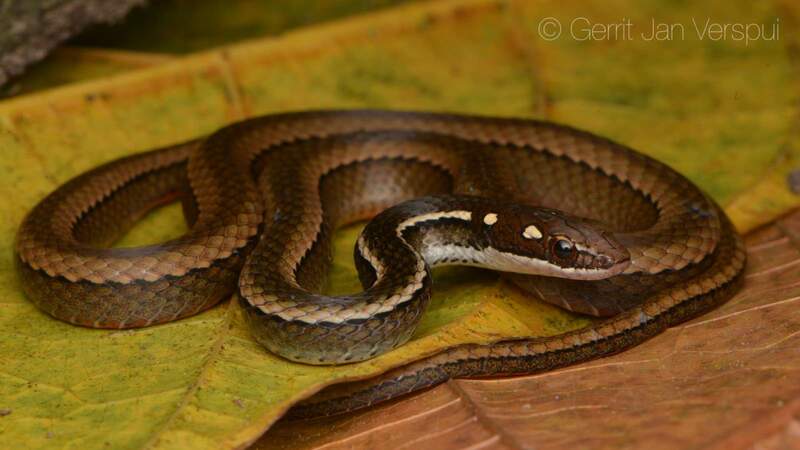 We also saw some snakes, not that many, but one of them was a species I did not see before, so that was great! 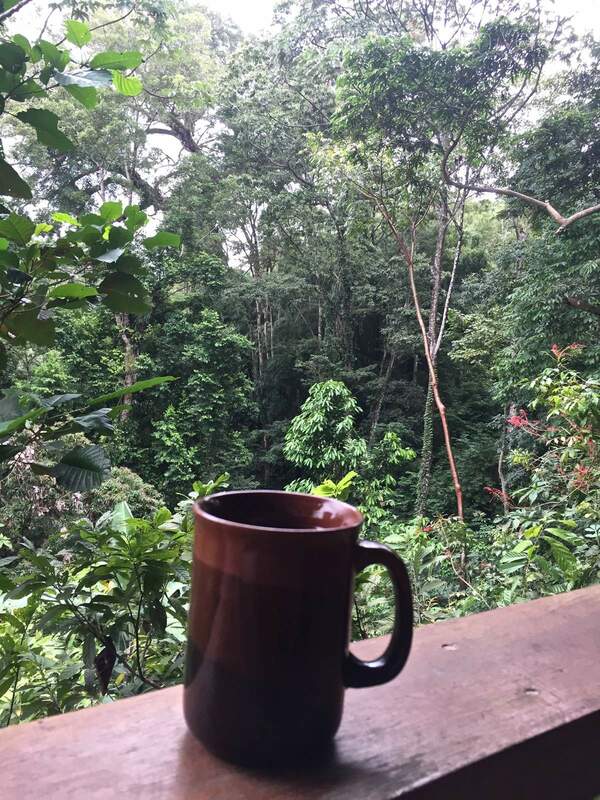 The next morning it was already time to pack my stuff and leave this place, I had a great time here and for people who love nature it is a very cool spot with very nice people who take many hours to show you around in their area, I loved it and I did see 8 new species that I did not see before. 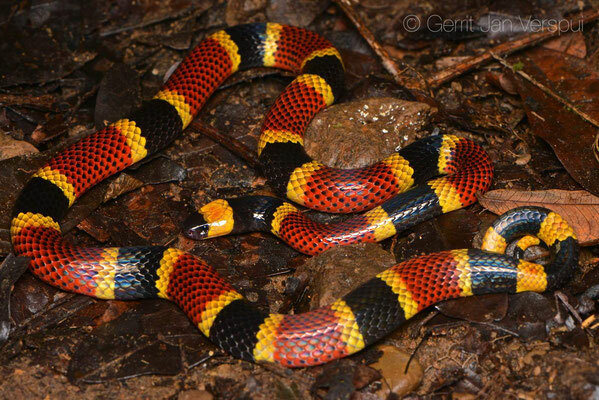 Thanks for everything Pedro, Donald and Juan! This is the only place of this trip that I visited before, in 2015 I had 3 great days at Brians paradise, so I really wanted to return here. 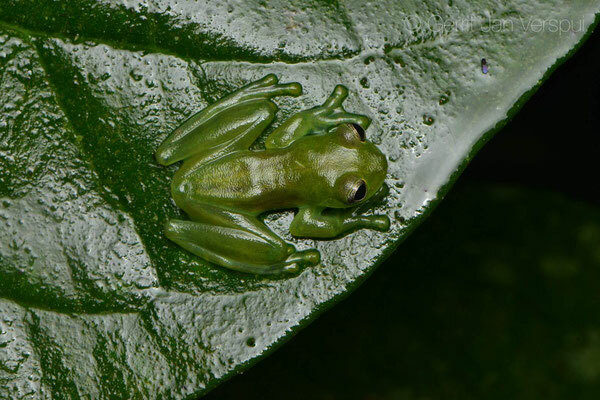 The first night Brian and I went out together and tried to find the Talamanca Glass Frog, but we did not manage to locate the one that was calling, we did see many other cool stuff though. 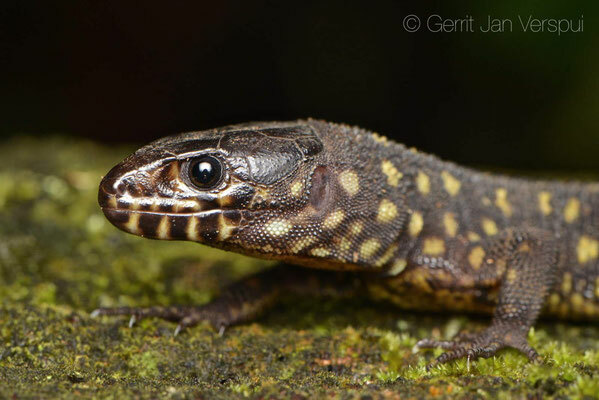 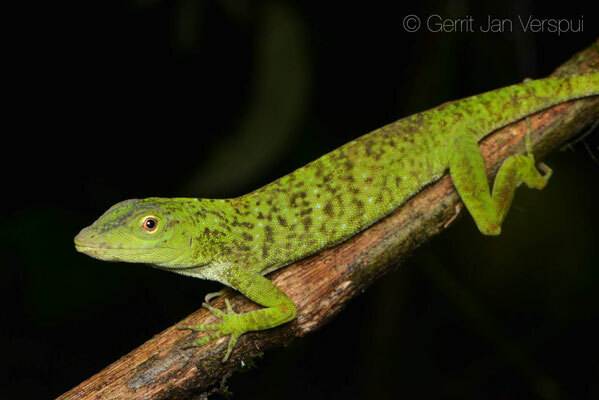 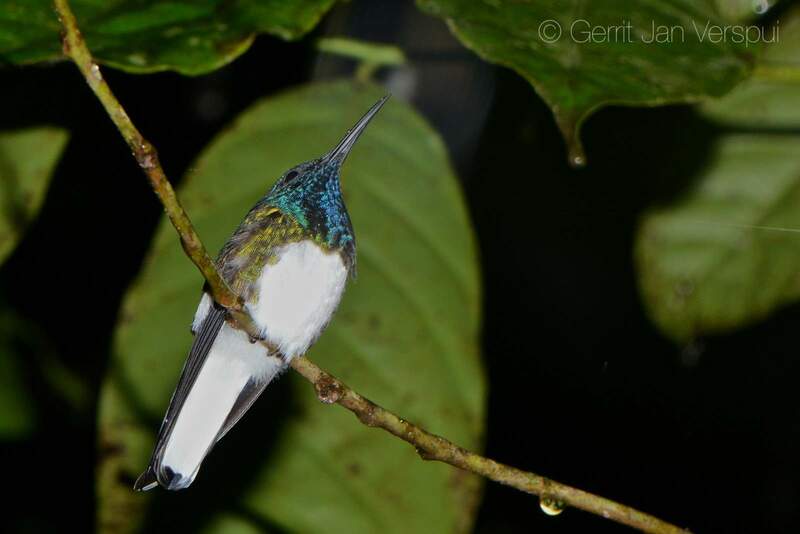 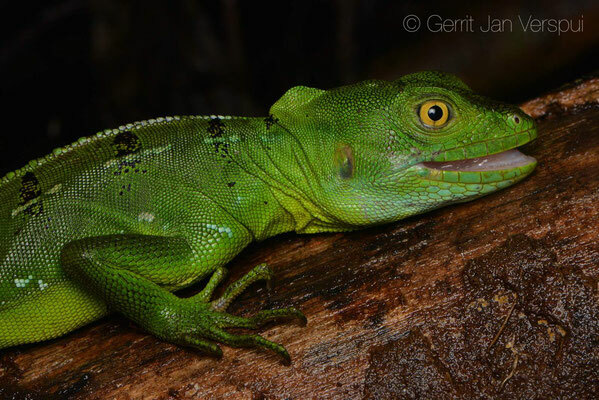 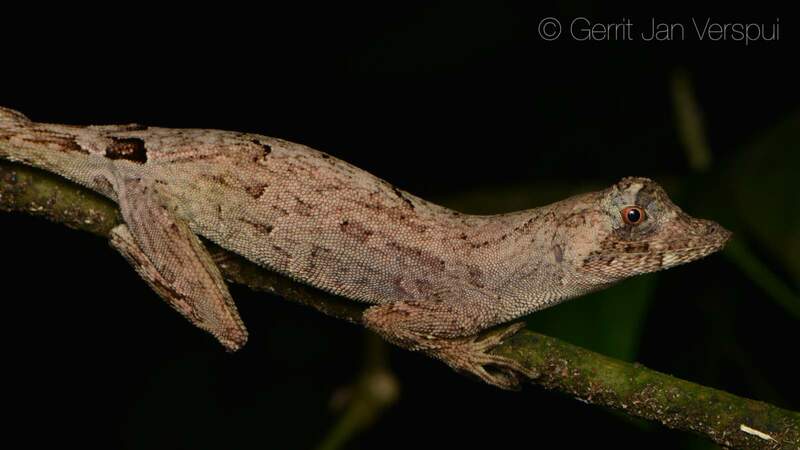 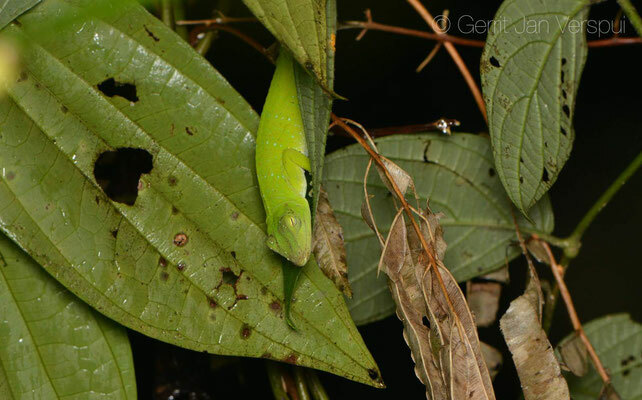 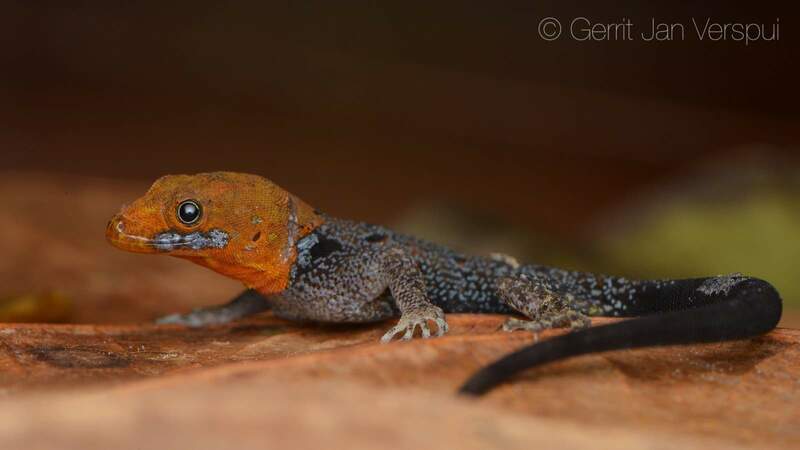 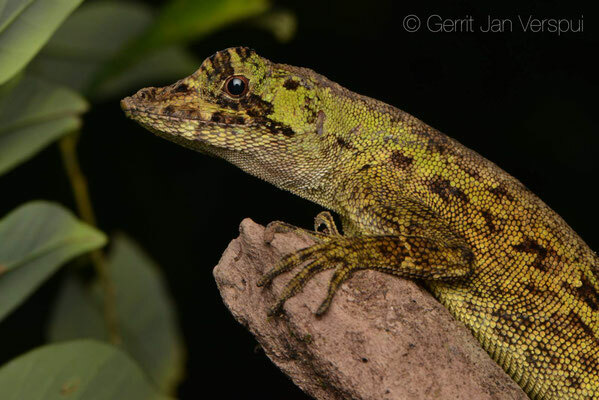 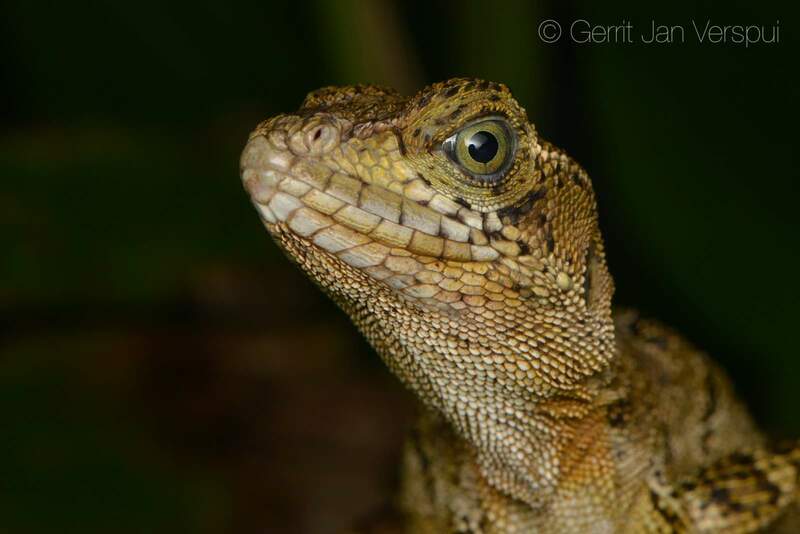 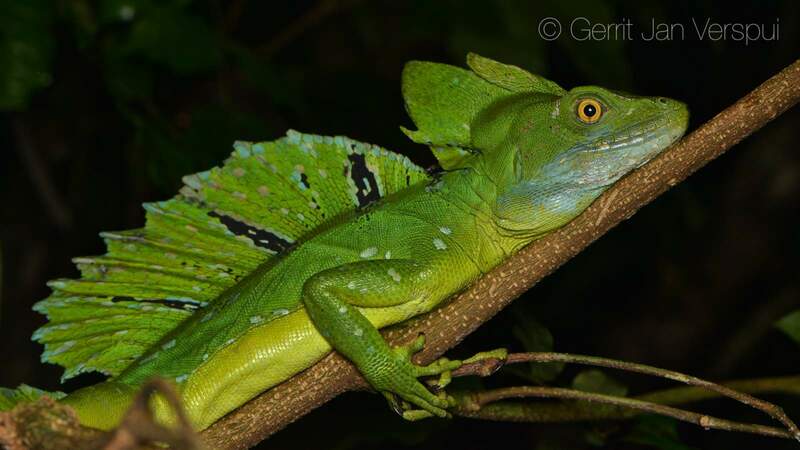 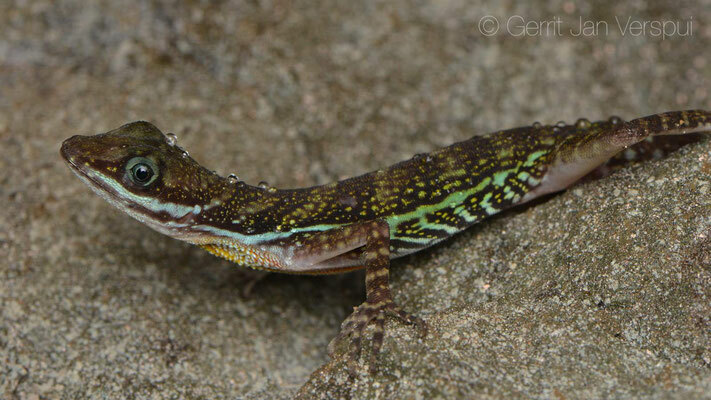 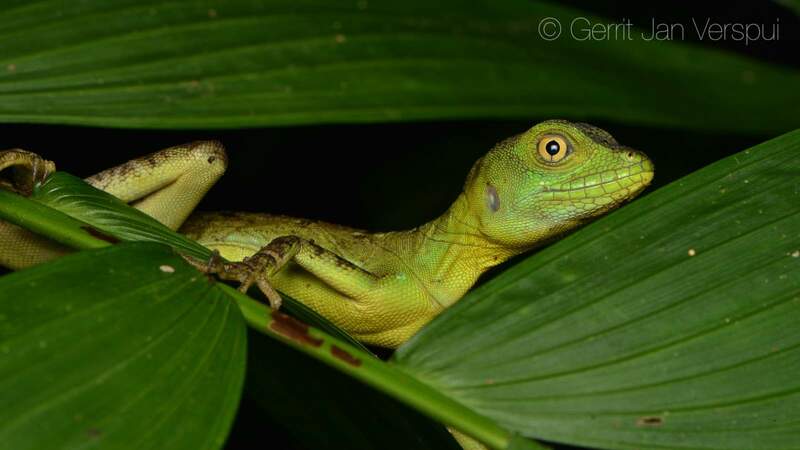 The next day I went to Siquirres during the day and at night I went out on my own, the usual suspects were seen and the Green Anole was the only new seen species for me, I also searched at the area where sometimes people were lucky to find a Bushmaster, but that luck was not for me. 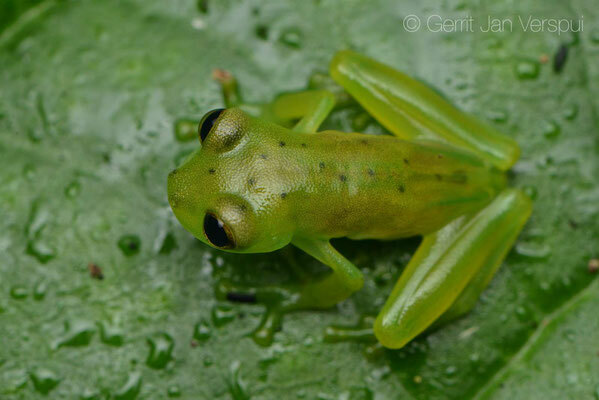 The third day Brian and I planned a search in the area of Cahuita, we wanted to find the Palm Glass Frog and search around for other nice species. 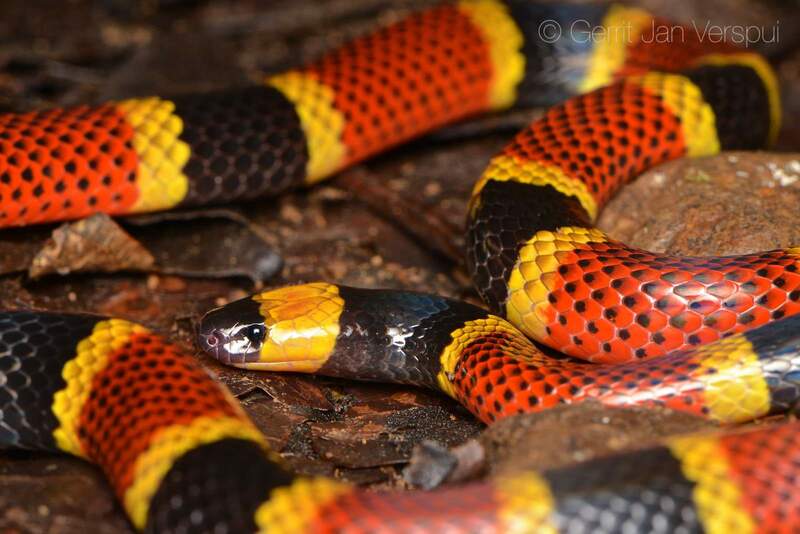 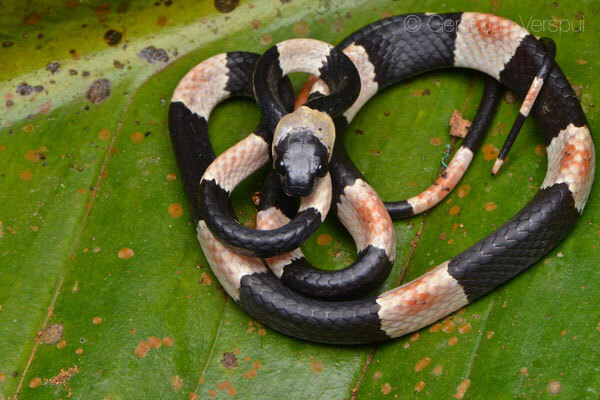 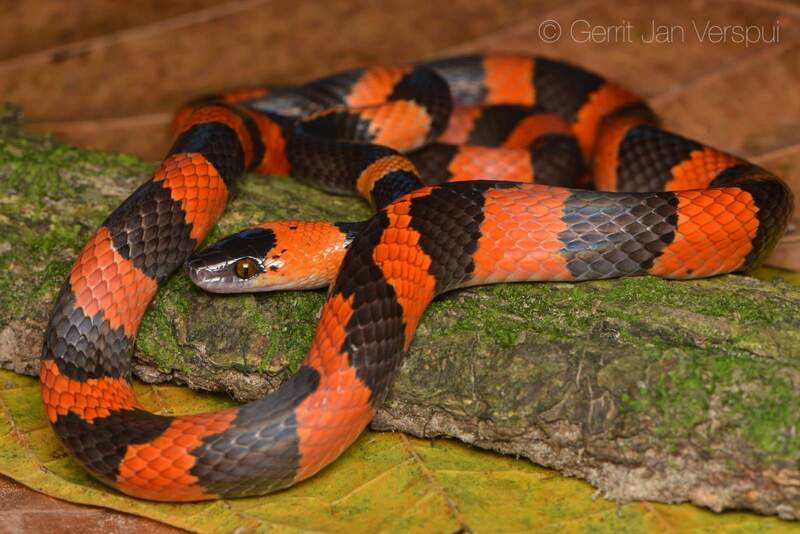 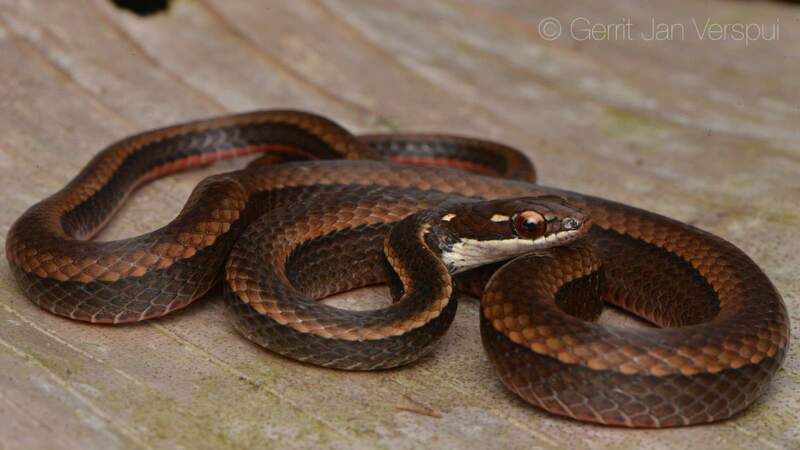 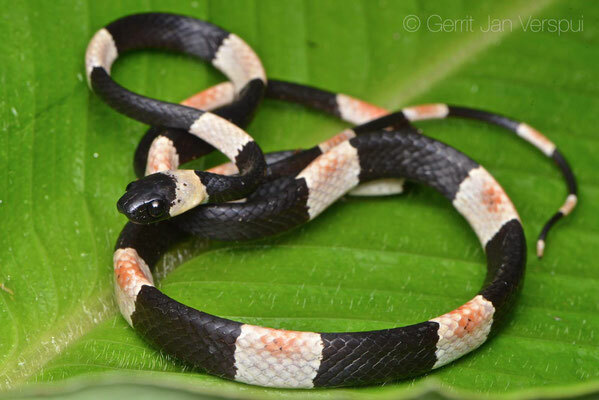 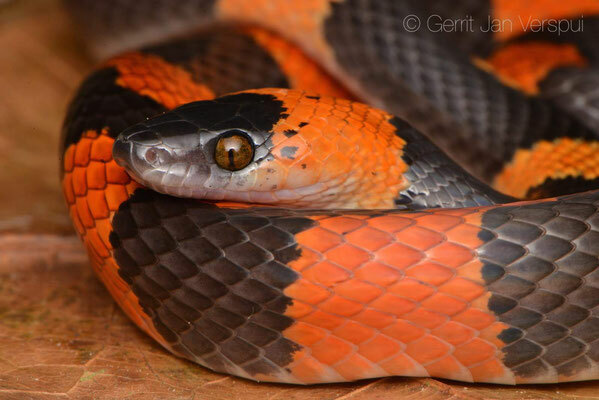 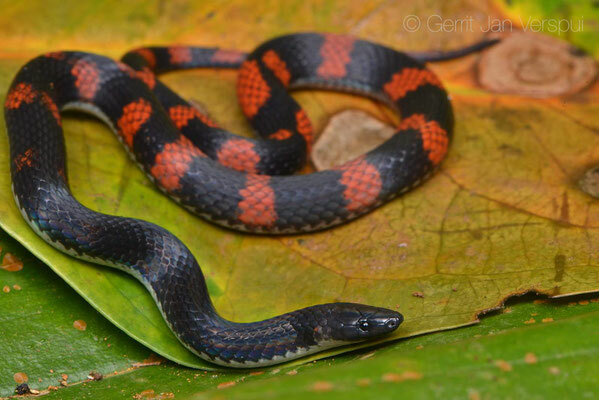 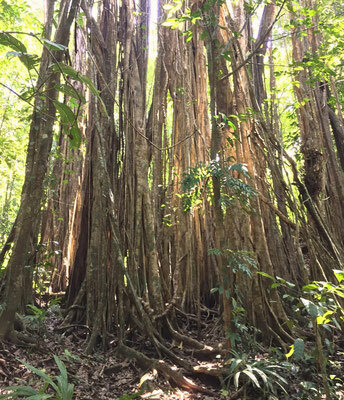 We visited some people who had a botanical garden in that area and they also had a big piece of land, so we searched there, we found some amphibian species that were new for me and I found a Coral Snake that was also new to me. On the way back to Siquirres we stopped at a river and there we found some Palm Glass frogs, so that was already my second new Glass frog. 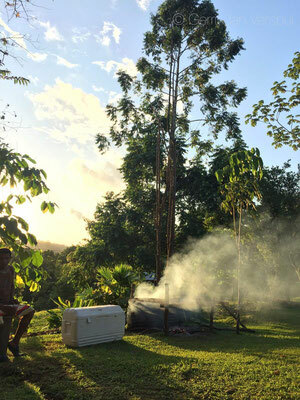 At Limon we had to wait a bit, a guy on a motorcycle drove himself into one of the many truck trailers there and he did not make it alive out of that. 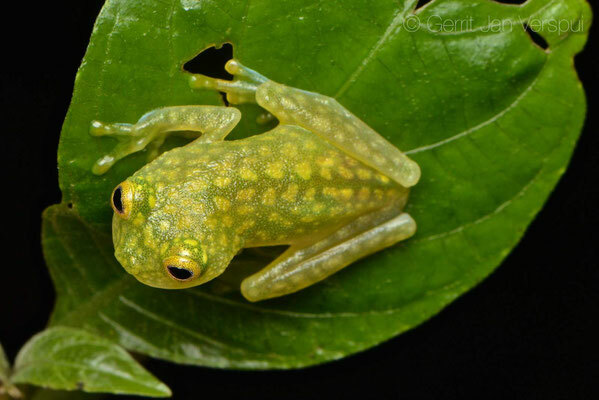 On the last day at CRARC we went to an area where there are more Talamanca Glass frogs, an other cool new species for me! We did return at CRARC pretty early, so I went into the reserve alone to find some more animals on my last night at CRARC. 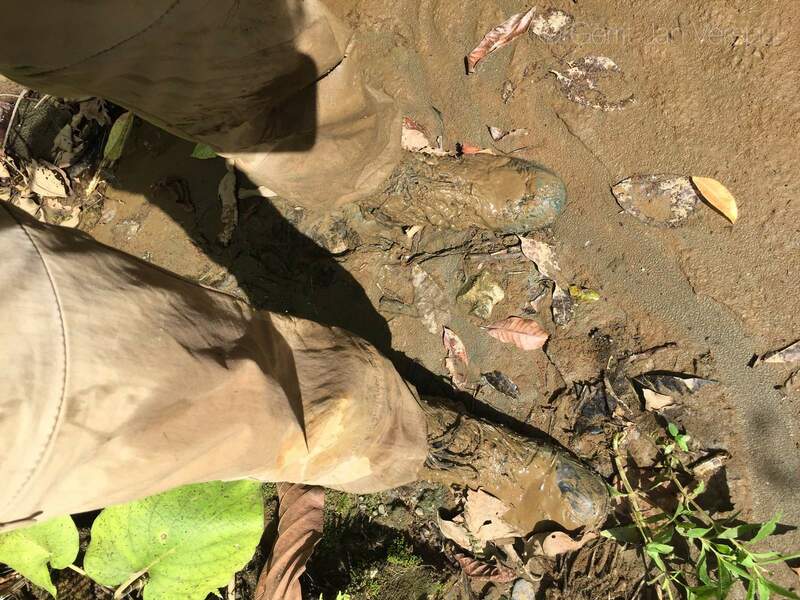 I wanted to stay out not so late, but somehow I never manage to do that, the last part was following a stream all the way up to the road, this took an extra 2 hours so I was in bed again after 03:00. 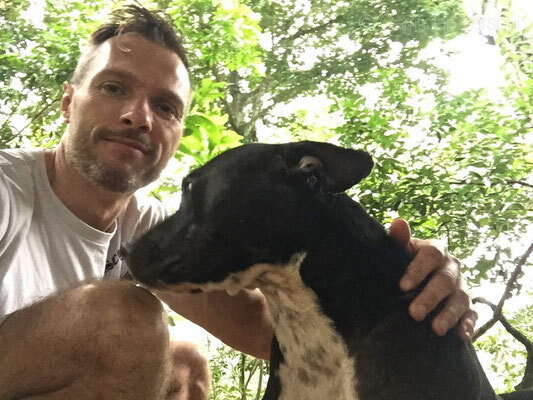 The next day I said goodbye to Brian and his family and went on my way again. 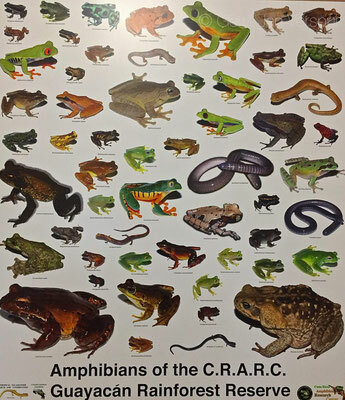 CRARC is always amazing, if you love amphibians this is for sure the best place to go to! 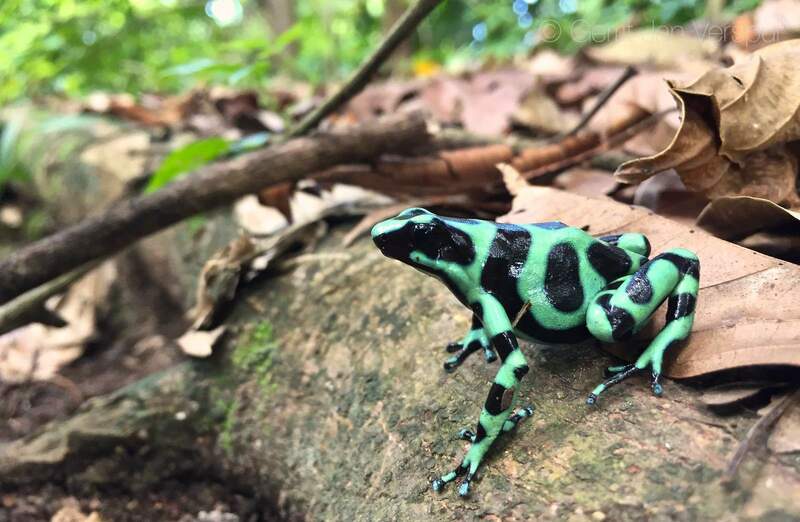 I found 8 new species for me during my stay there. Thanks Brian for the great time again! My next stay was with Sabastián and his family at Kekoldi, the place I stayed is a big Jungle house made by himself in the middle of the jungle, the reason I went there is because many people were already very lucky and found 1 or more Bushmaster there. I knew up front that december was not the best time for finding snakes in Costa Rica, but you can always be lucky of course. Every day I went out alone and at night Sebastián went with me, we walked many hours and even after Sebas already went to bed I searched for 1 or 2 hours more. We found a lot of good stuff, but the much hoped for Bushmaster was not there. Sebas said that he knew 2 glass frog species from his land and they were seen and heard regularly, but I also heard a third one, after a short search we found some Dwarf Glass Frogs there too, so that was cool! 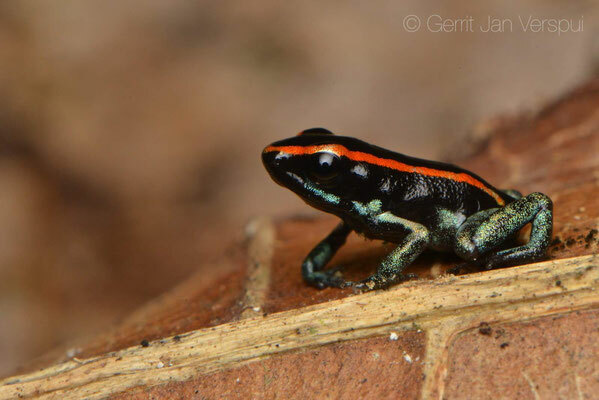 A thing that was not cool was my meeting with a bullet ant, when you walk around there you see many, but when I am photographing a frog I don't have any view behind me and one of them stung me in my leg, it is by far the worst feeling ever until now that I had because of an animal bite or sting. 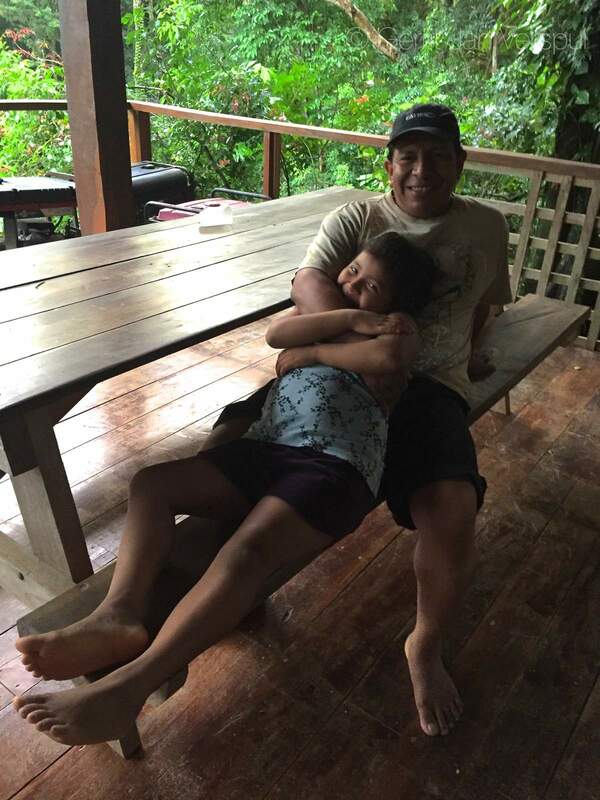 (Yes I cried..) If you really want to know, just give it a try, make sure to get the real bullet ants from the pacific side, they are the best! Even when we did not find as many snakes as we hoped for this was still a very good place to stay, every day good food and such nice people! 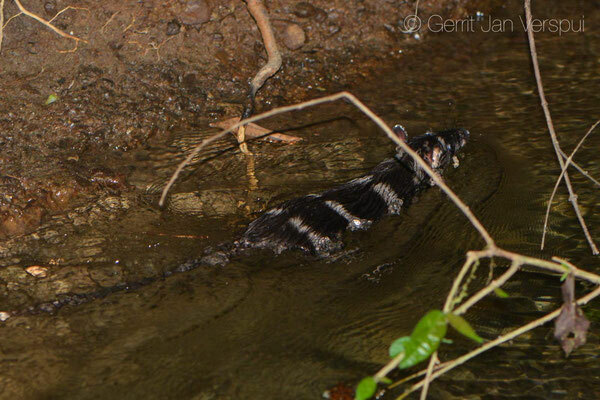 Sebastián's daughter for example was always helping me when I was making photos of one of the animals we found. 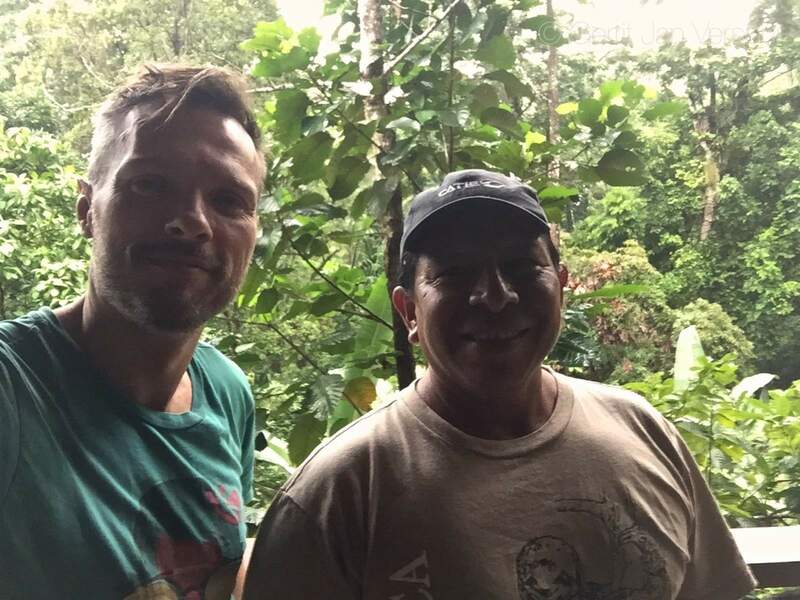 Thanks for the great time Sebas! The last couple of days of the trip I was staying somewhere on the Osa peninsula and that is a very long drive from Puerto Viejo de Talamanca so I made 2 nights somewhere in between Kekoldi and Osa, the first night was at San Gerardo de Dota and I had a very nice place with a good view and a bathtub, I searched there a bit during the day and at night, but temperatures very close to the freezingpoint were not good for anything, so nothing was found. 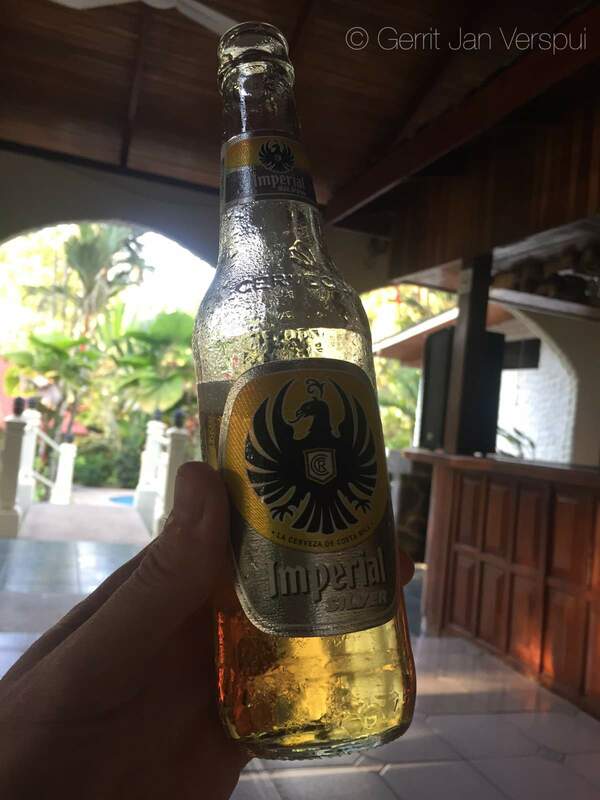 So beers in the bathtub were the only good thing I could think of at that time. 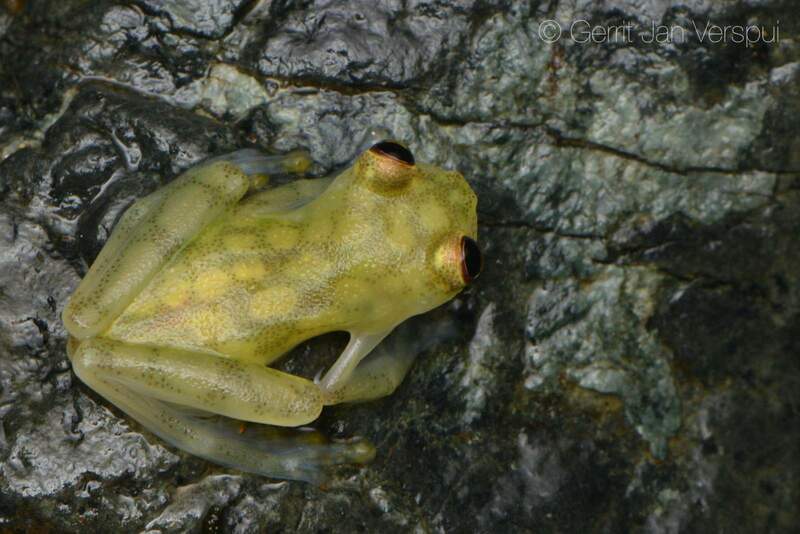 The second night was at La Ceiba Eco Adventures and it was a cool place to search around a bit at night, at the river were many Cascade Glass Frogs calling, I have never seen so many glass frogs together, they were all over the wet rocks at the waterfalls, many of them in amplexus and all the males were calling. 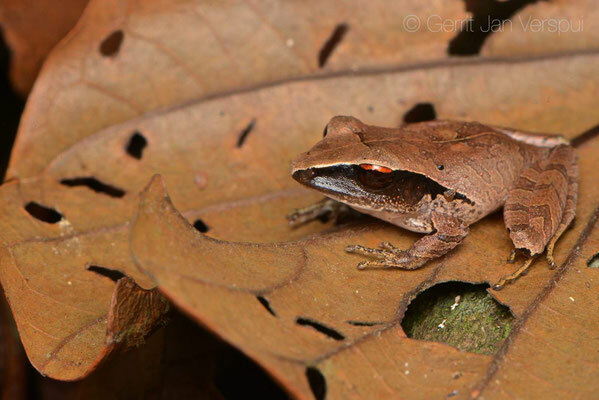 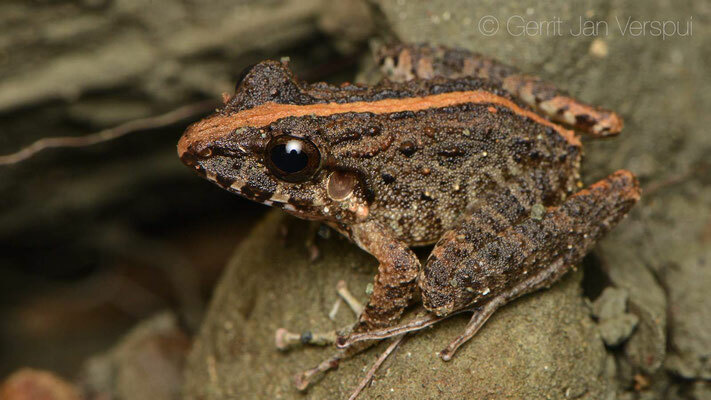 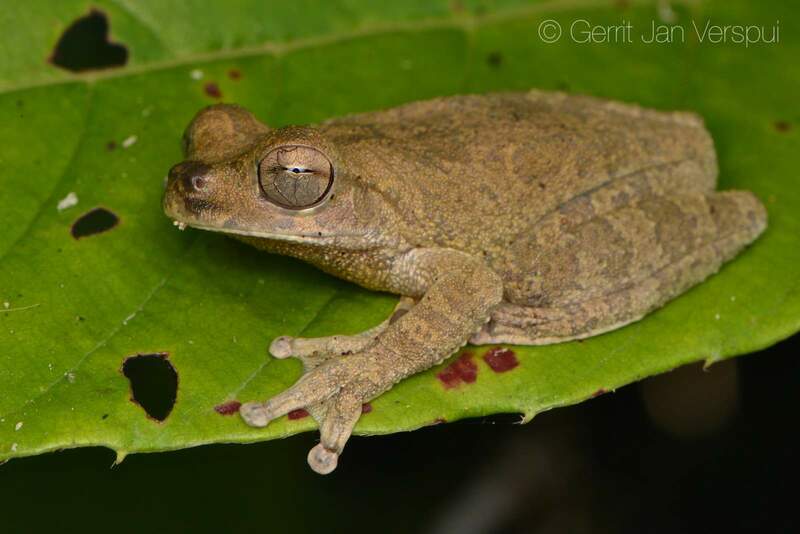 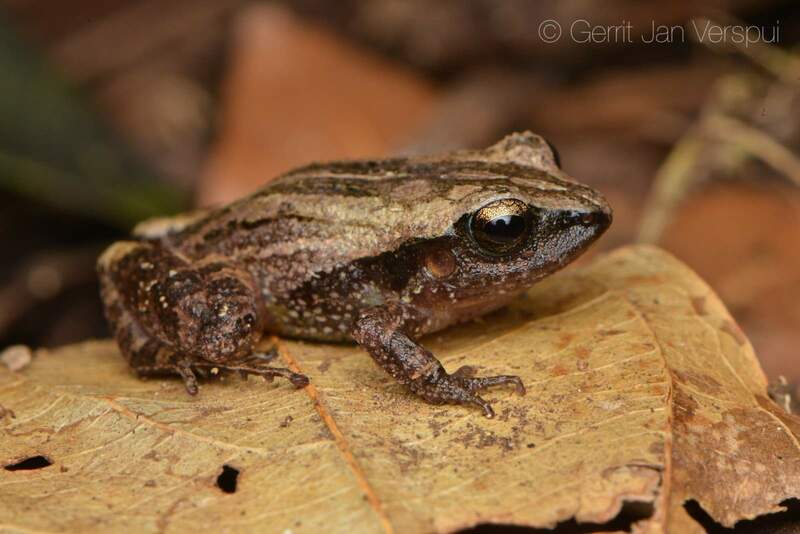 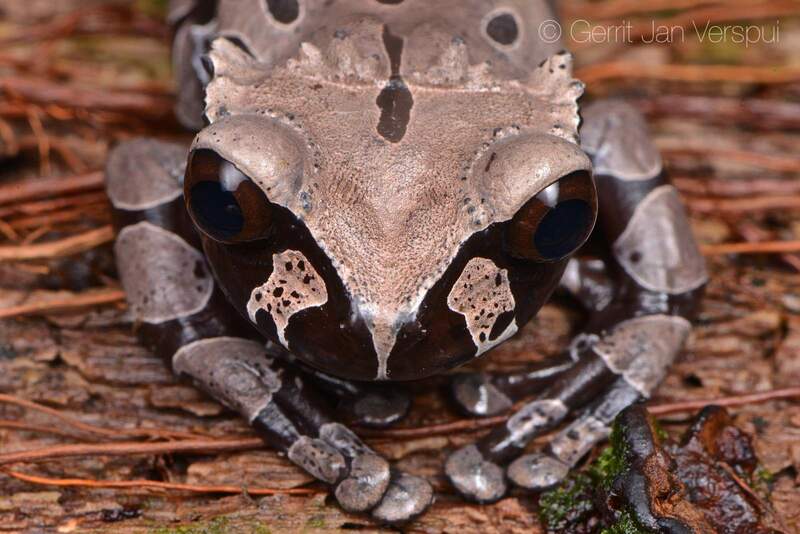 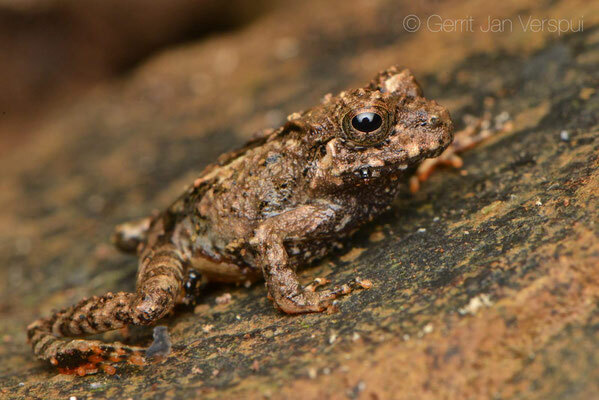 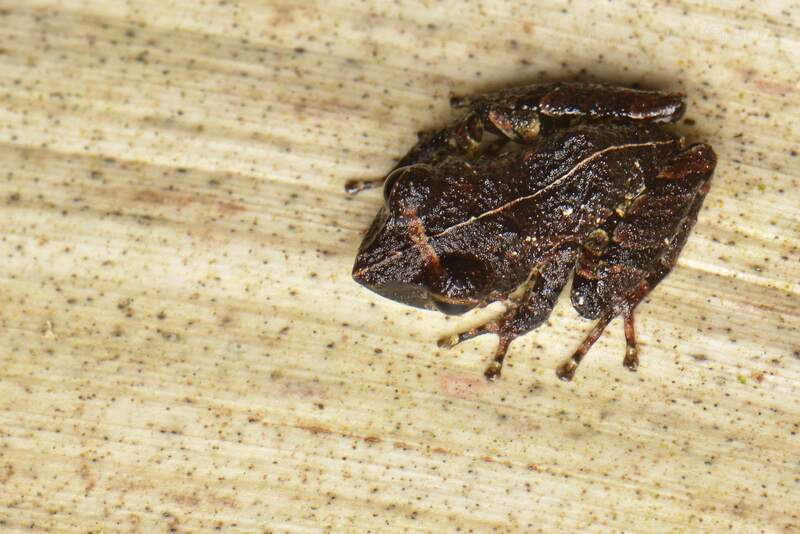 An other cool species was the Pug-nosed Treefrog, I heard many calling, but they were hard to find, it took me some minutes to find a couple them, most were on the banks between the vegetation, only few were in the water or on a higher leaf. 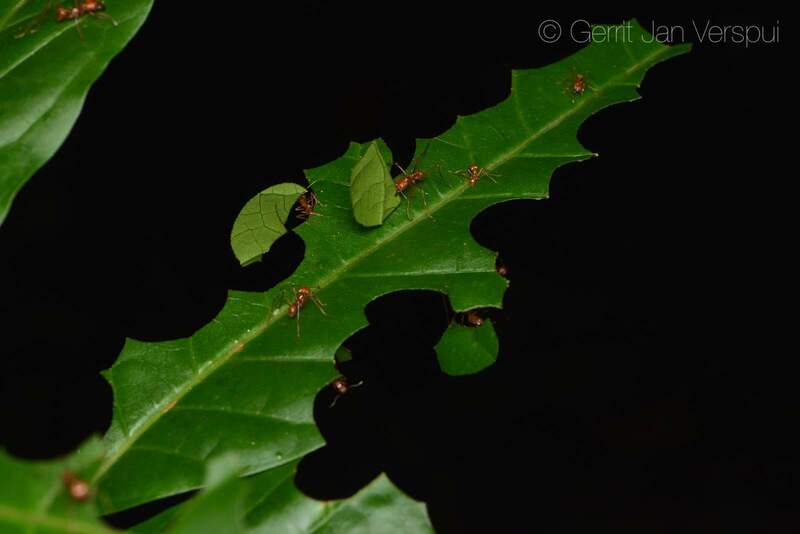 While searching around this place I met with an other ant species, I think they were acacia ants, I walked through vegetation and was stung by 9 of them, all of the places I got stung were swollen and the feeling when I was stung was a bit unpleasant-painful, but totally not comparable to the bullet ant sting. The last place of this trip was La Tarde, I arrived there in the afternoon and searched a bit around the lodge, not much was found. In the evening I met with Marcello and he wanted to join me on a night tour. 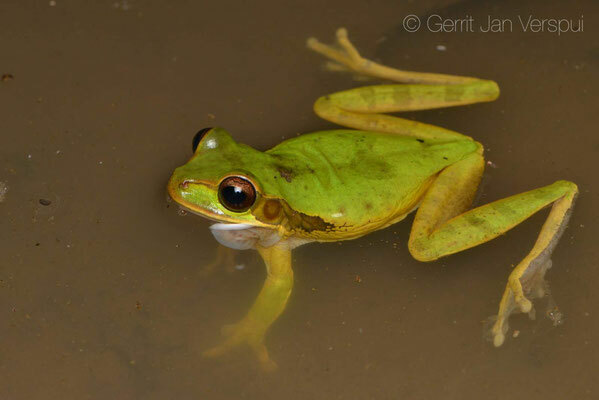 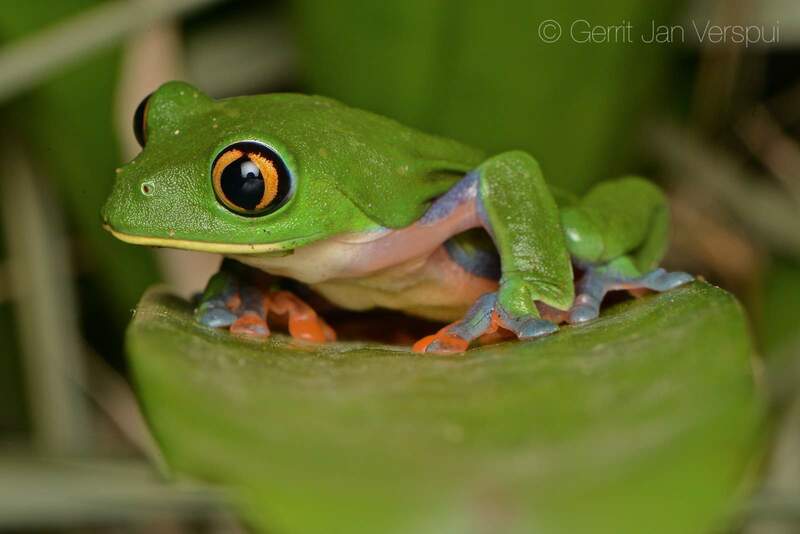 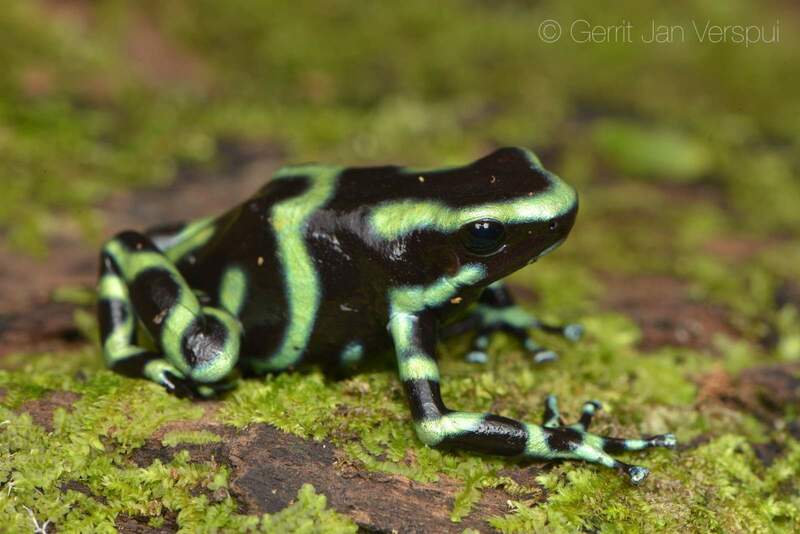 We went on some trails where Marcello pointed out a huge tarantula and after a while we arrived at a small stream and 1o meters before I was at the stream I spotted an Emerald Glass frog, it was a juvenile. 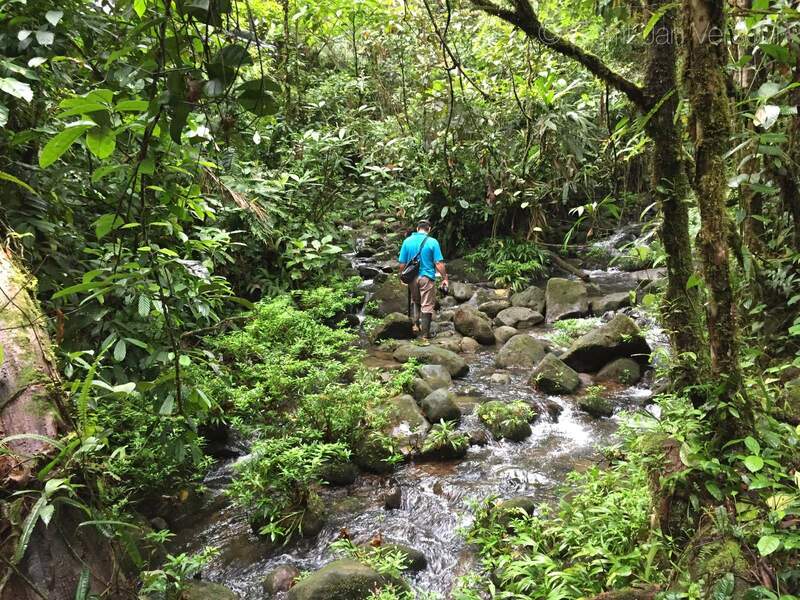 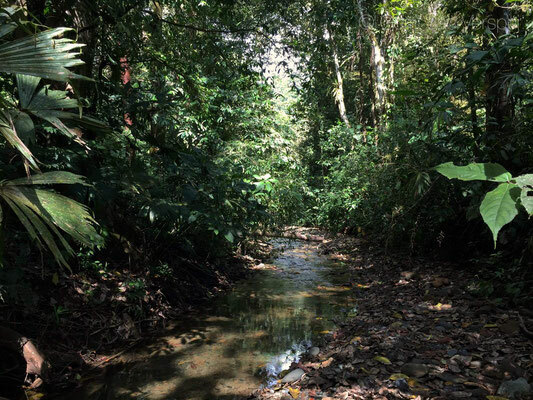 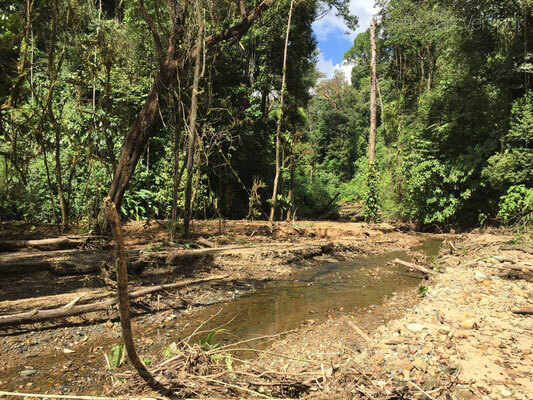 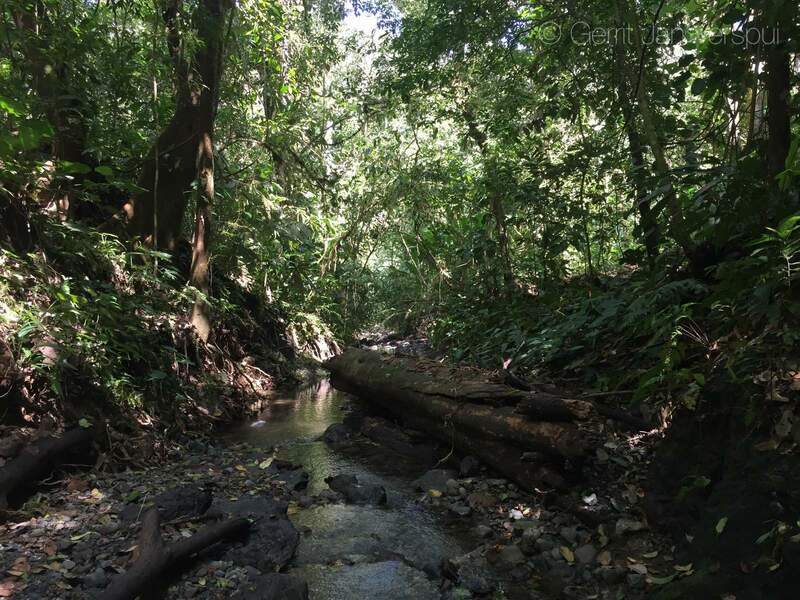 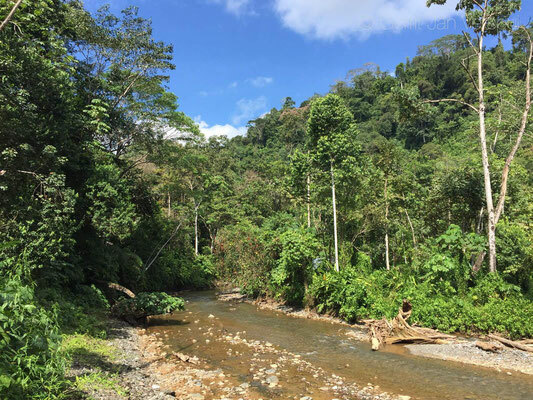 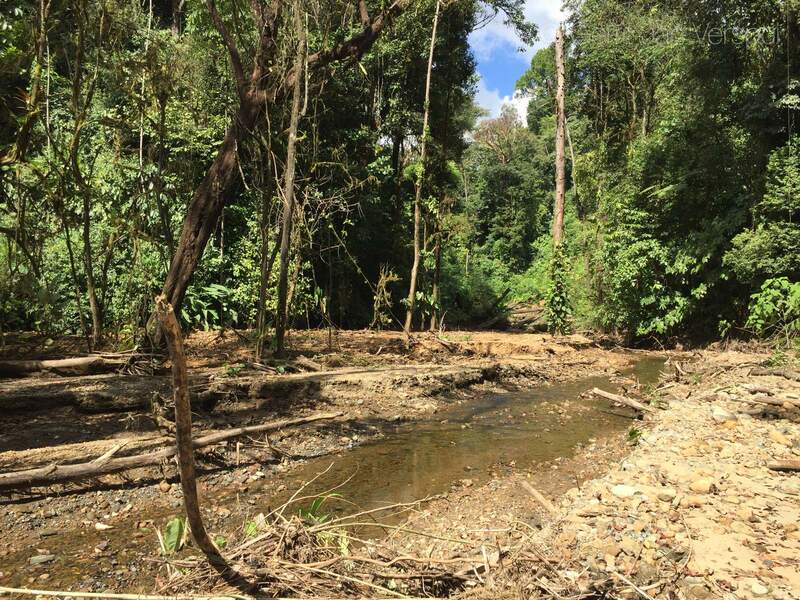 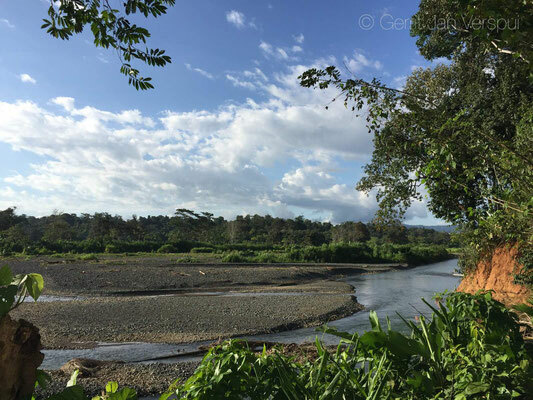 Marcello said that there are 6 species of glass frogs in that stream and one of them was not seen by me yet, so if I would be lucky I would see my 11th Costa Rican Glass frog species somewhere here. 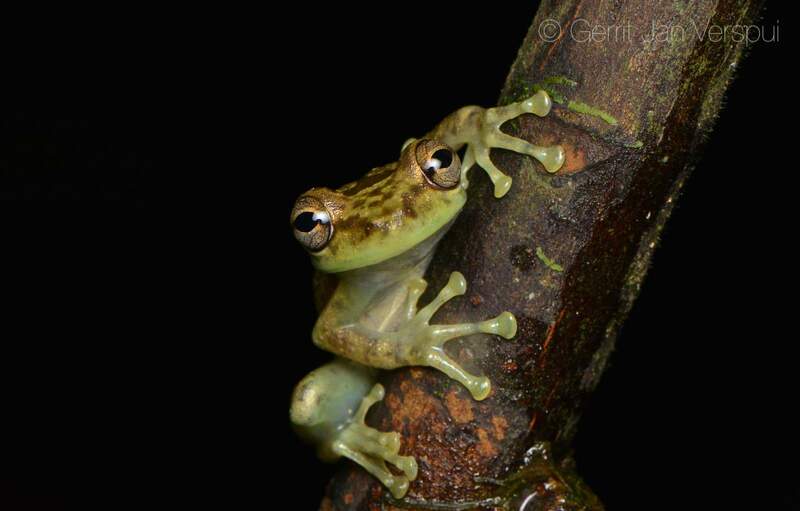 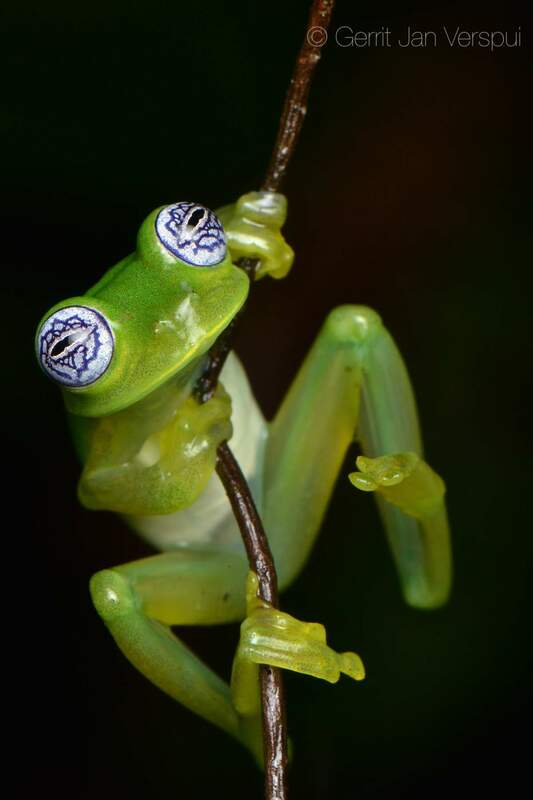 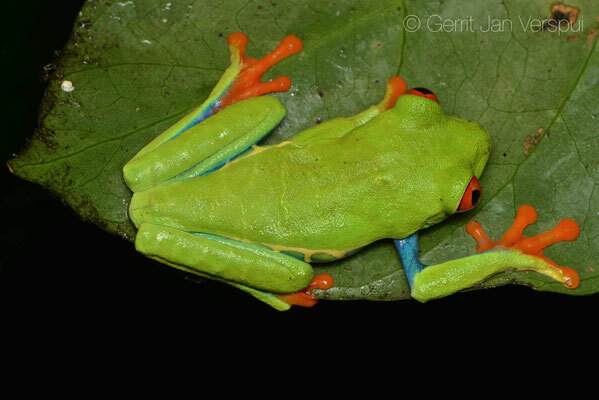 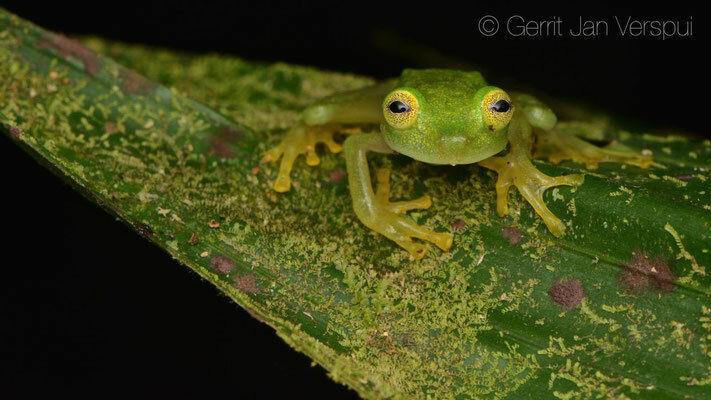 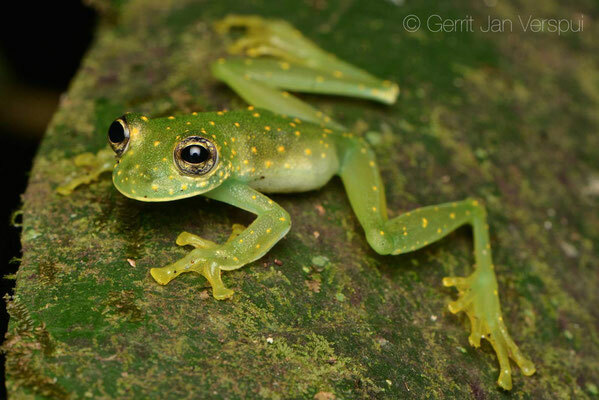 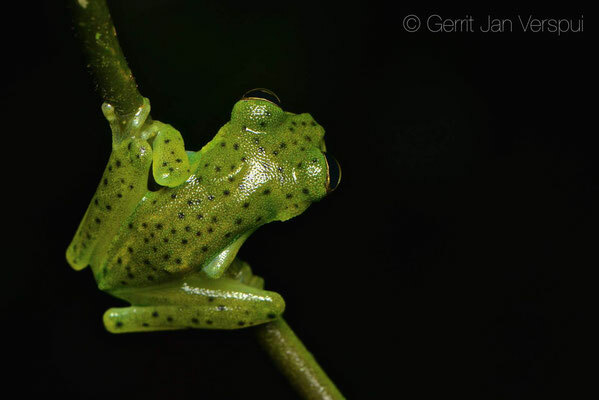 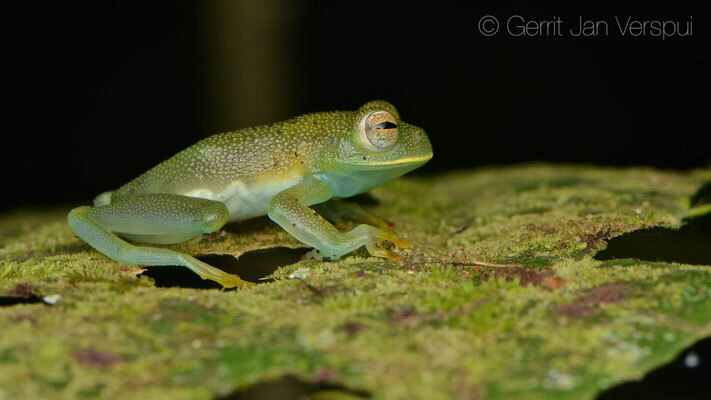 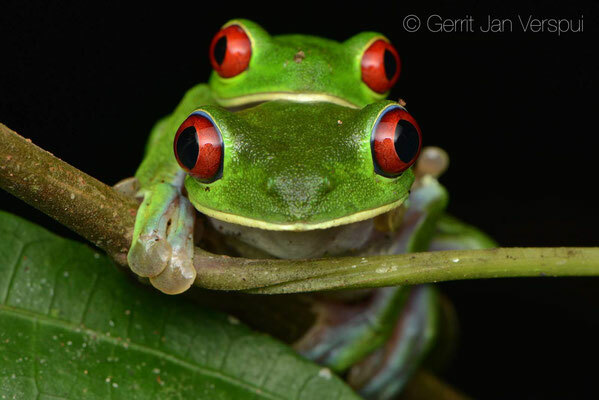 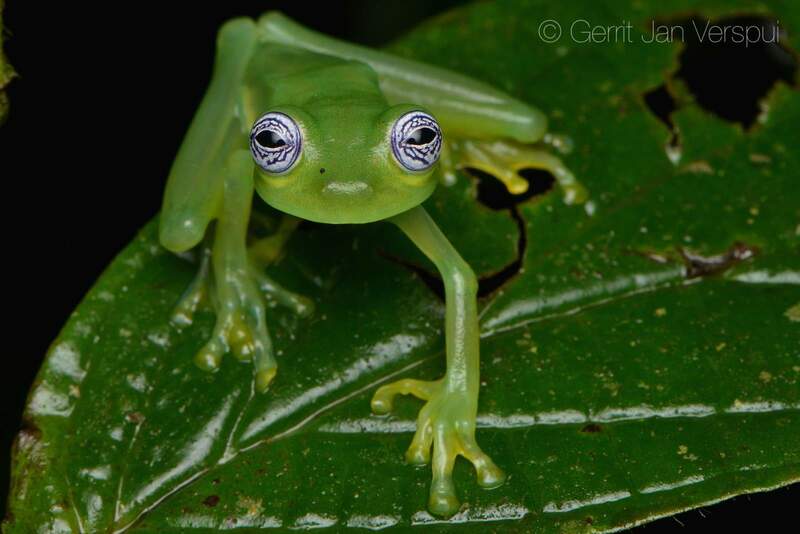 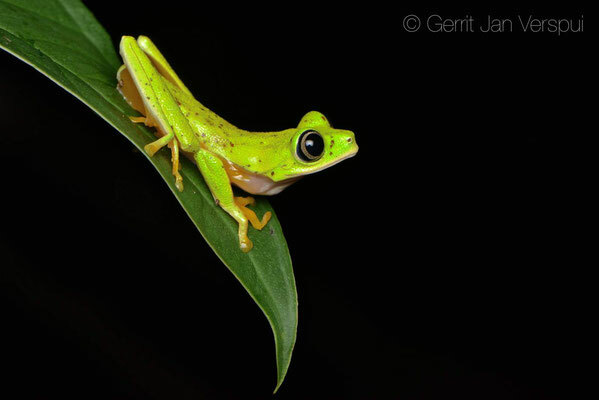 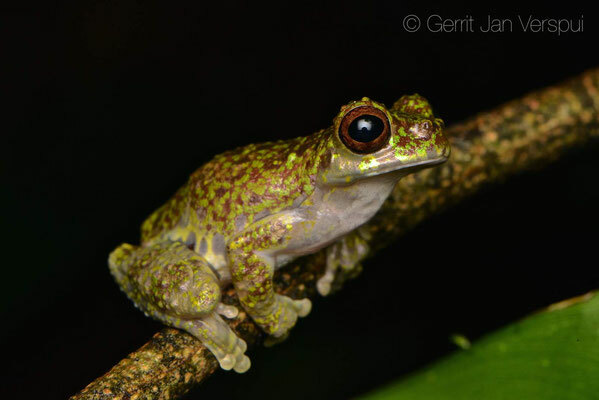 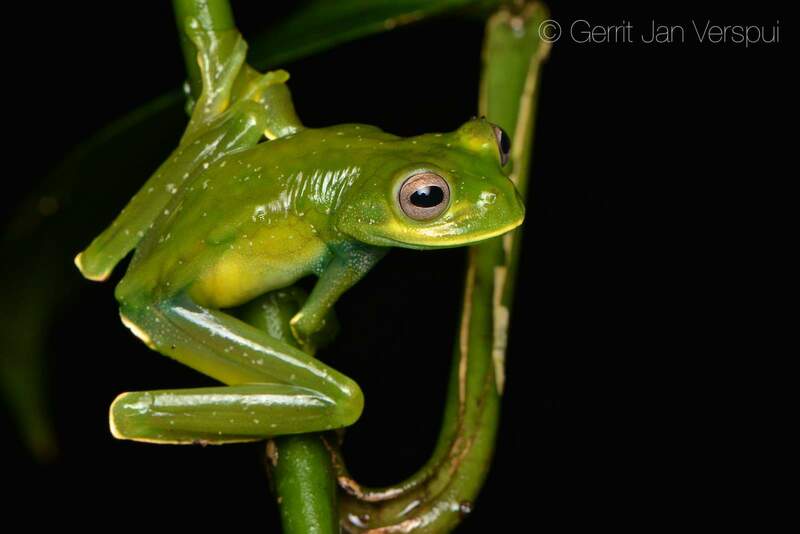 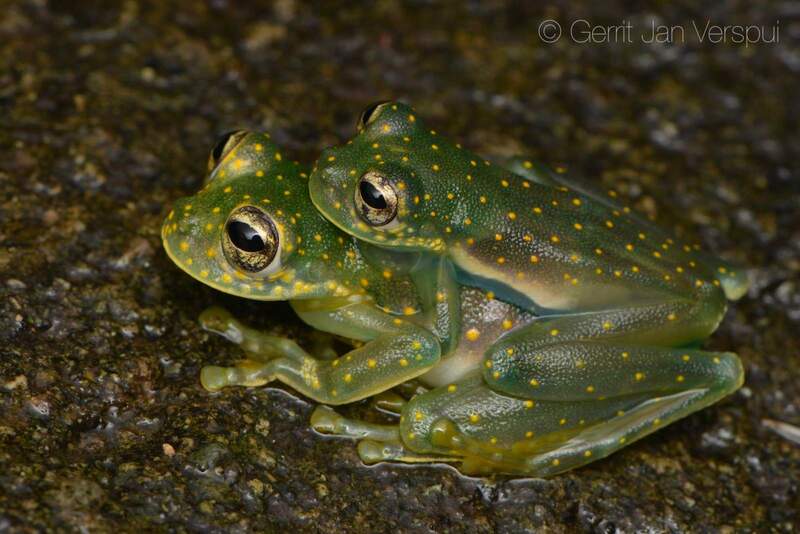 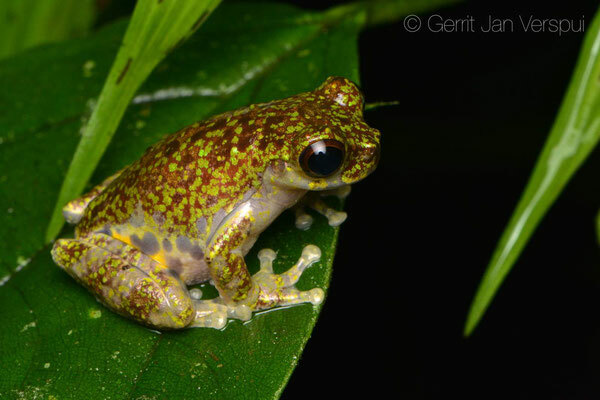 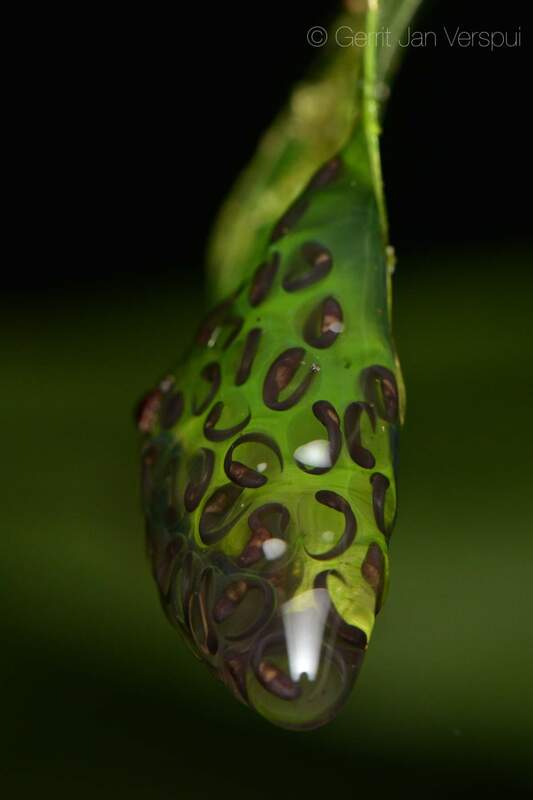 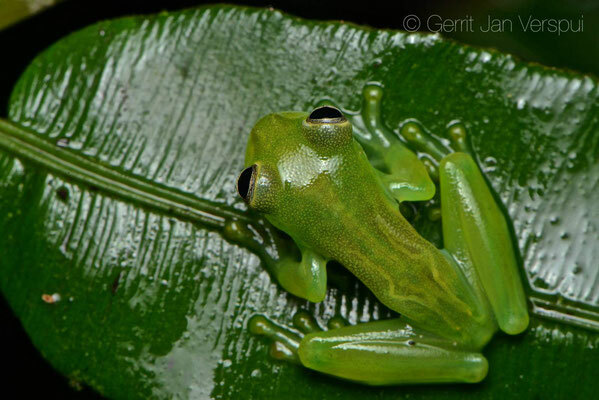 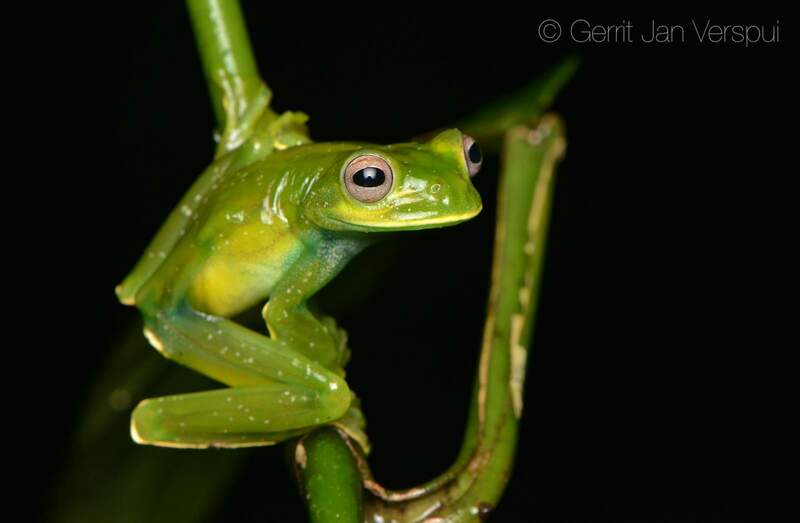 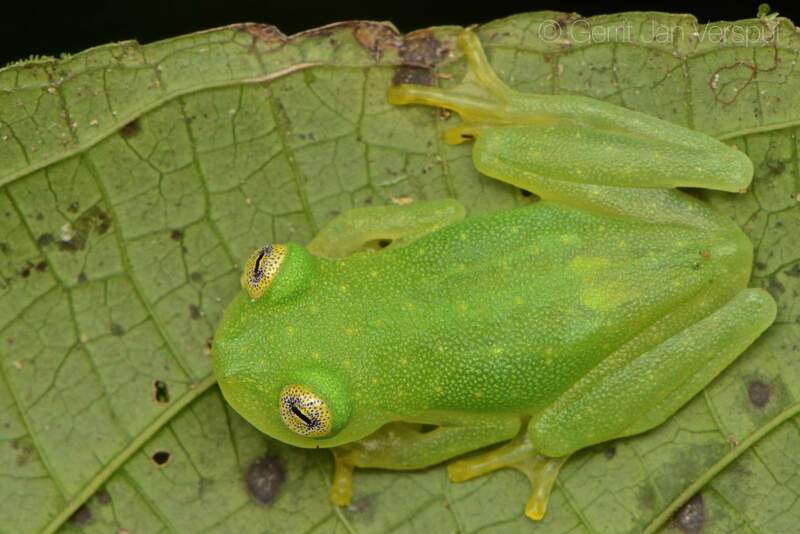 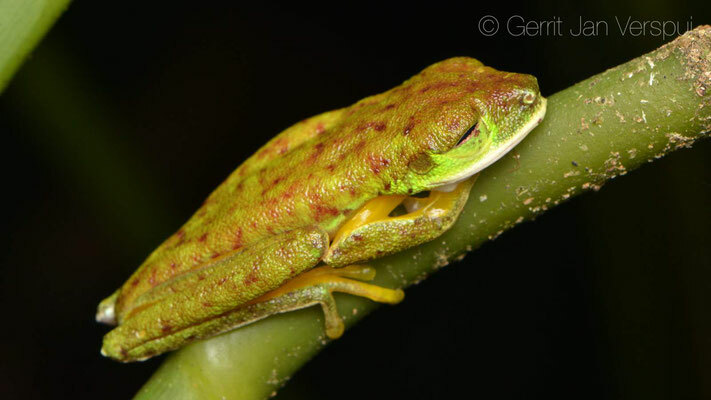 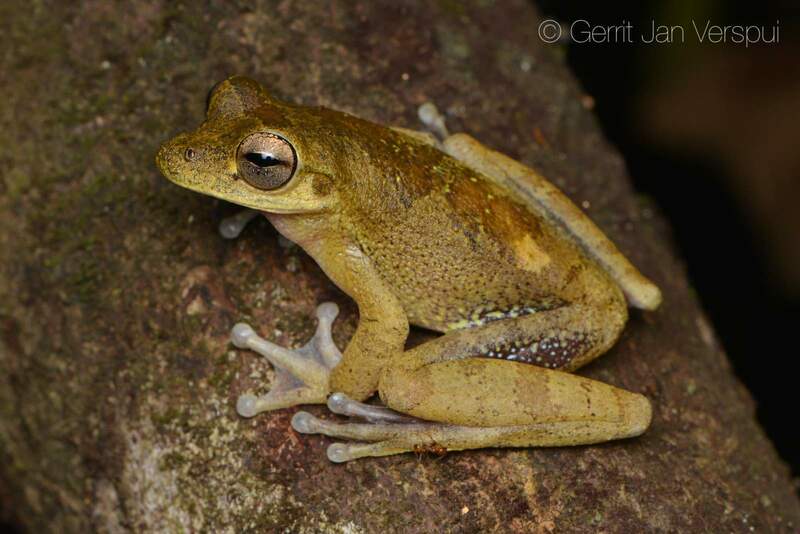 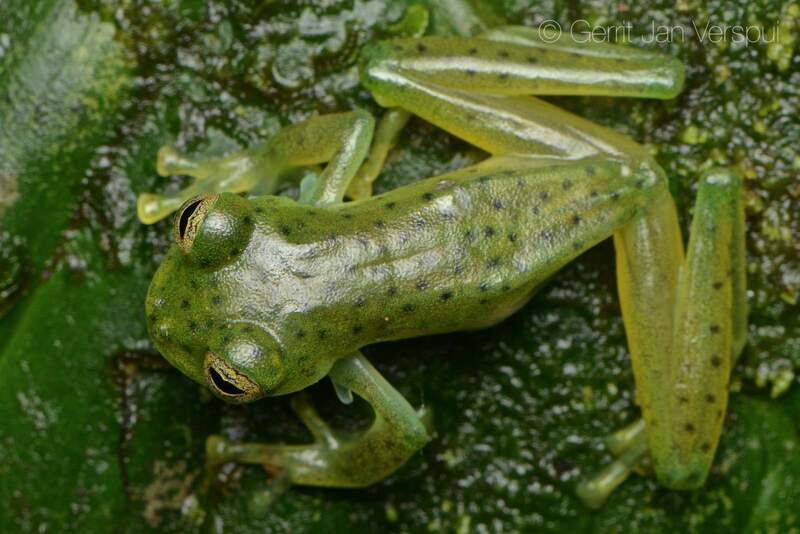 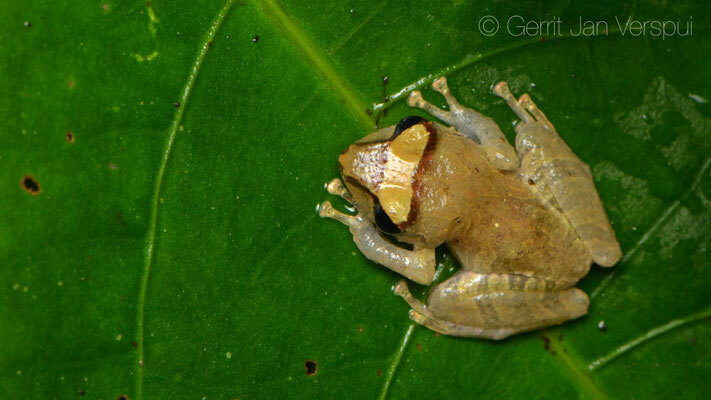 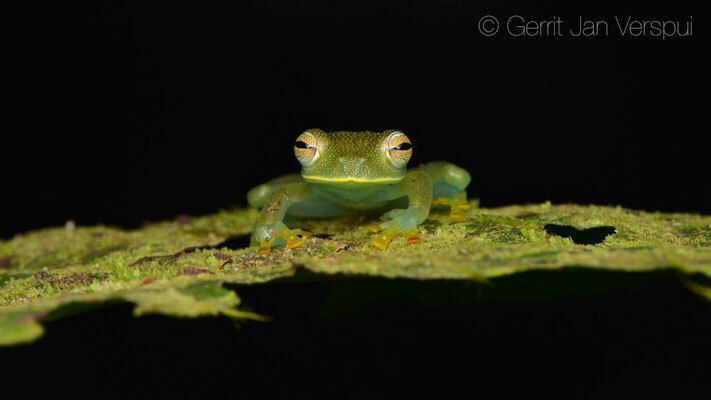 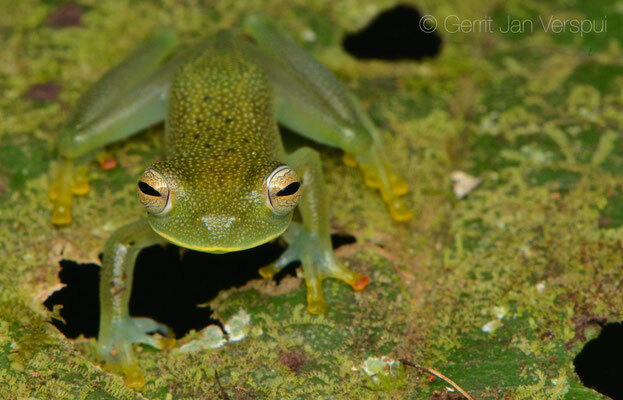 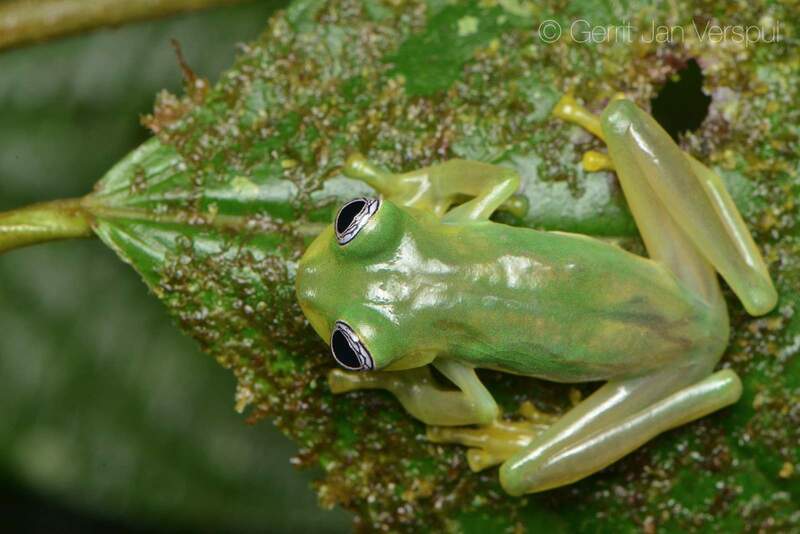 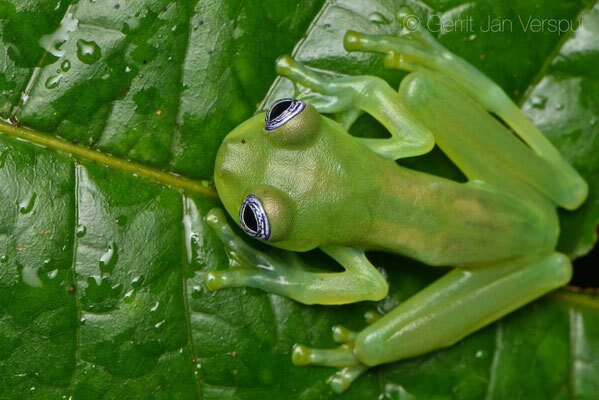 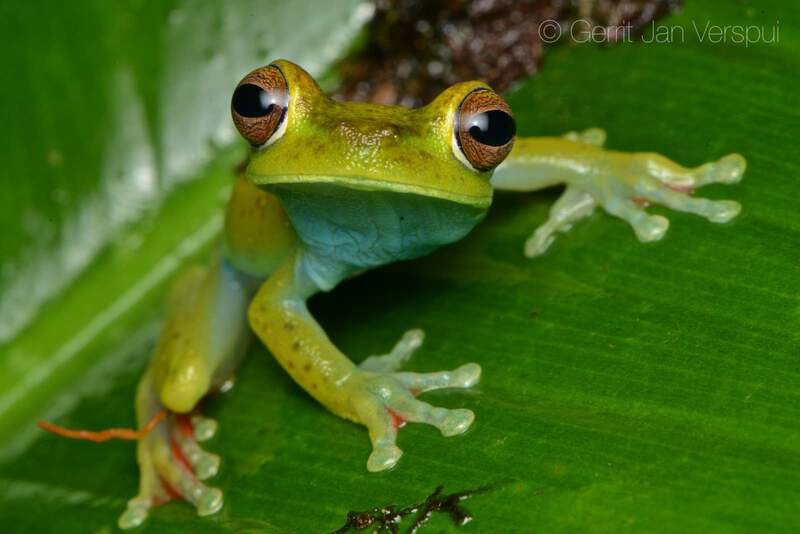 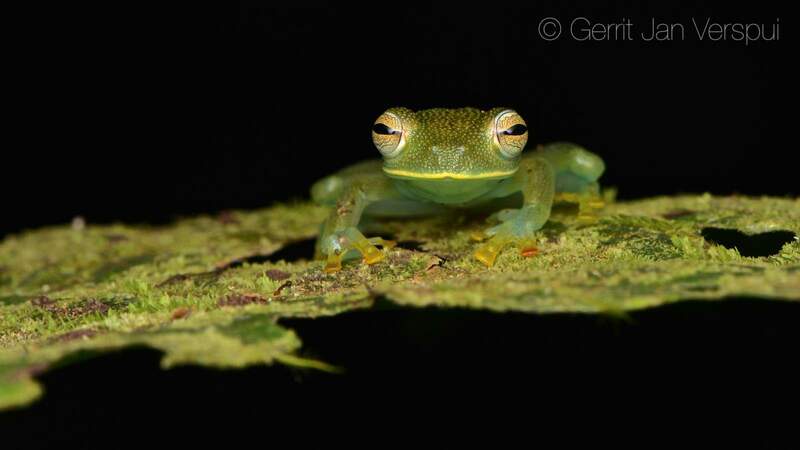 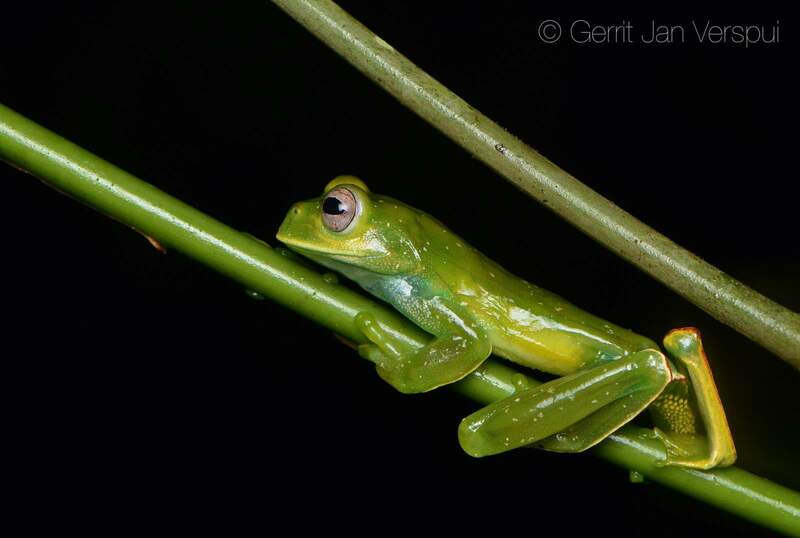 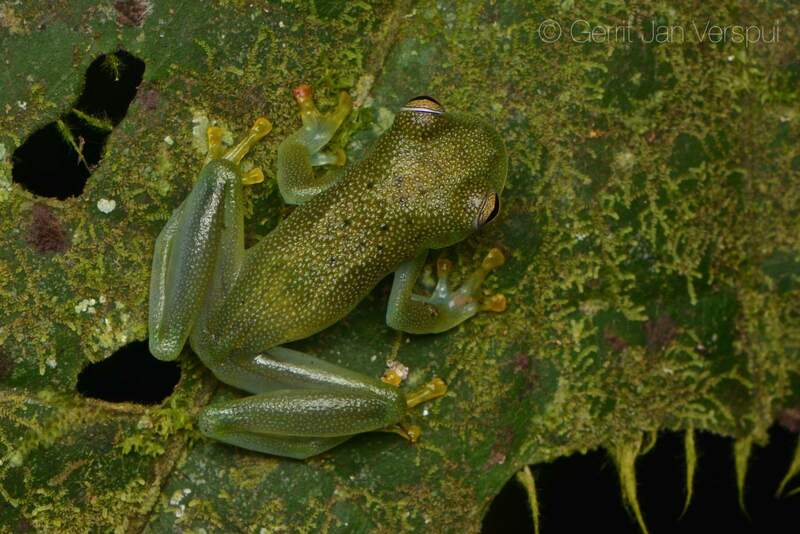 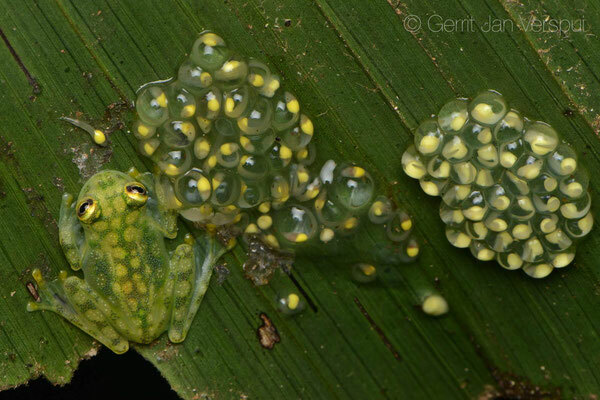 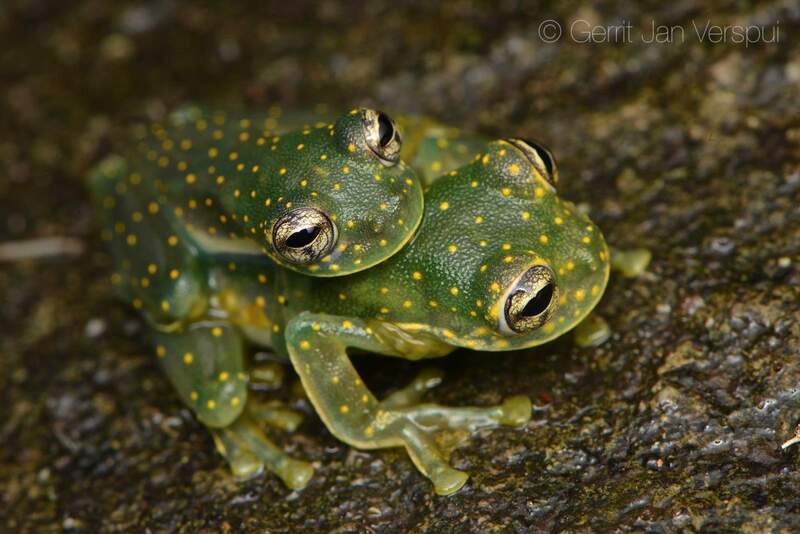 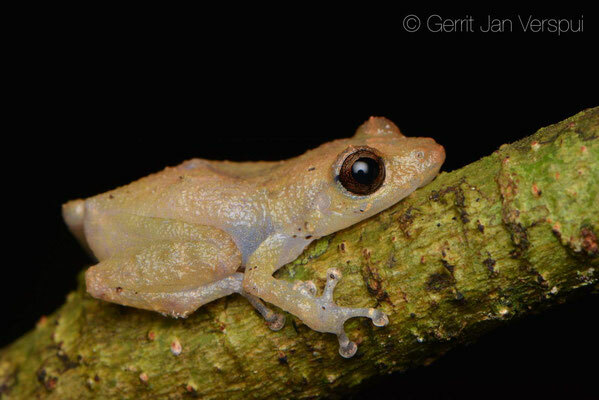 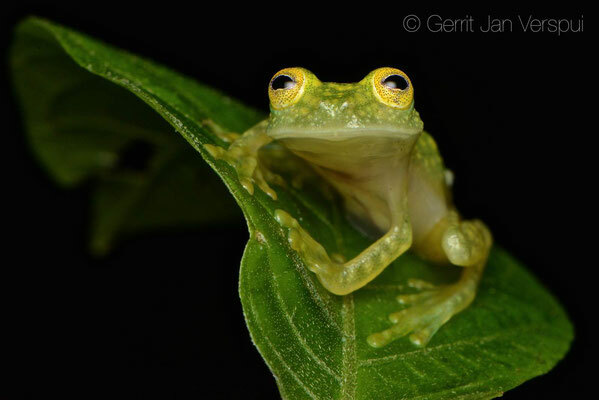 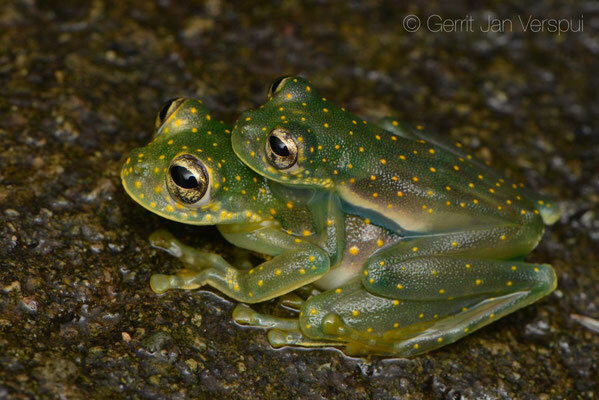 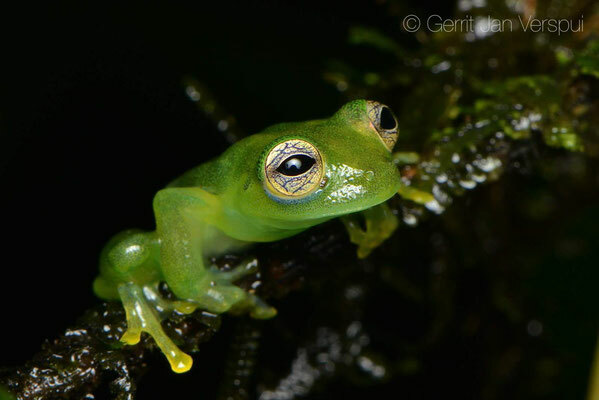 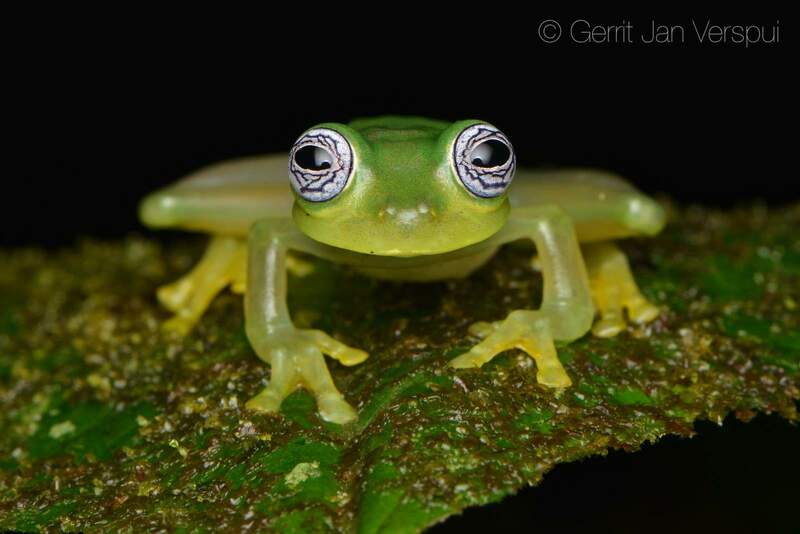 That night we found 3 glass frog species and heard the 4th one calling, the ever unreachable Granular Glass frog. 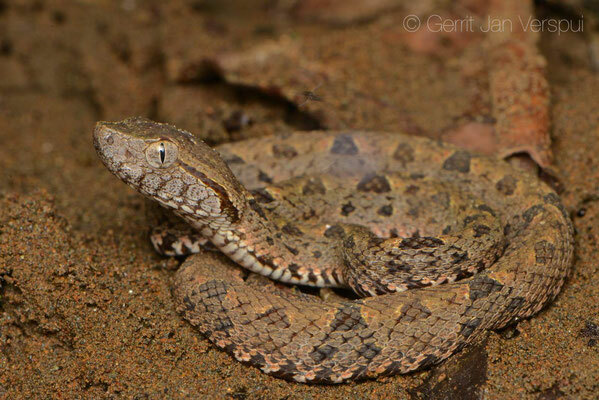 On the way back to the lodge Marcello suddenly made a very weird dance move, but what actually happened was that he saw a 1,1 meter Fer de Lance at the very last moment and did everything possible not to step on this snake. After some photos we continued our way back. 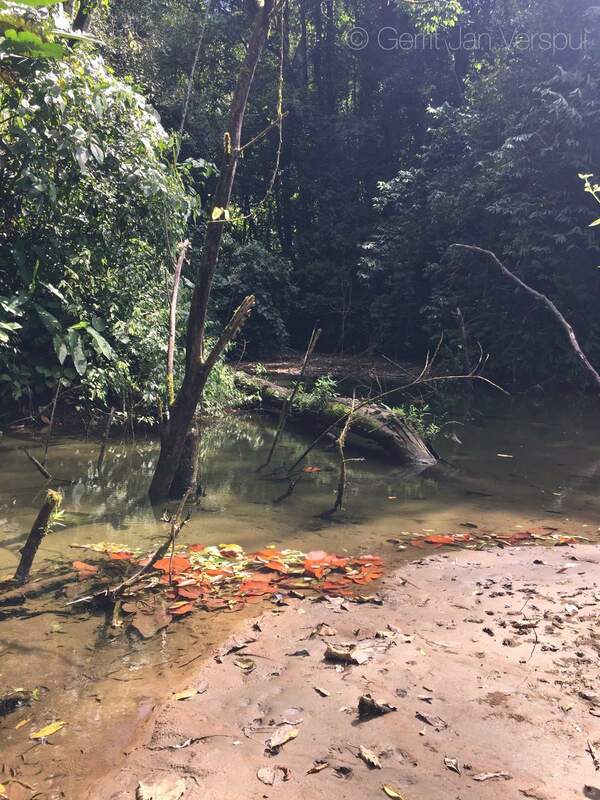 The next day I went in the jungle around 08:30 and returned after 13:00, I looked around in the whole area where there has been a landslide some time ago and I checked out some places where I thought it would be good at night. 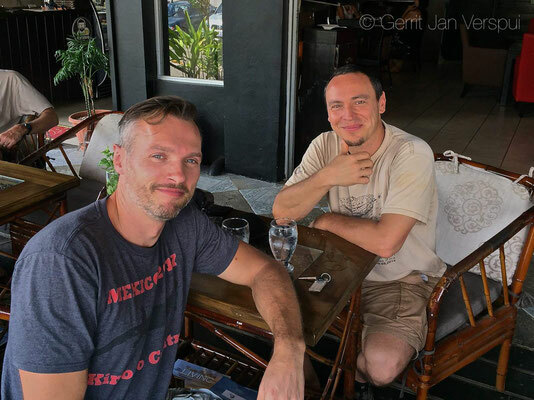 After a good lunch I drove to dante's lodge for some wifi and a beer or 2. 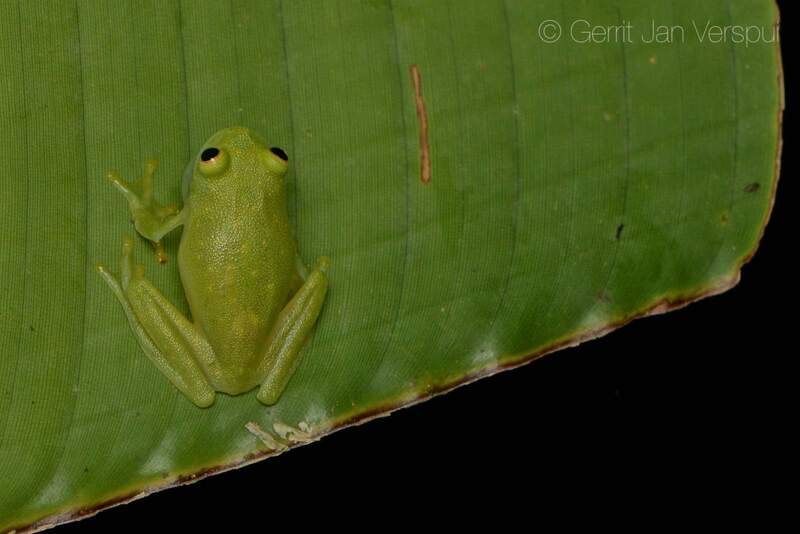 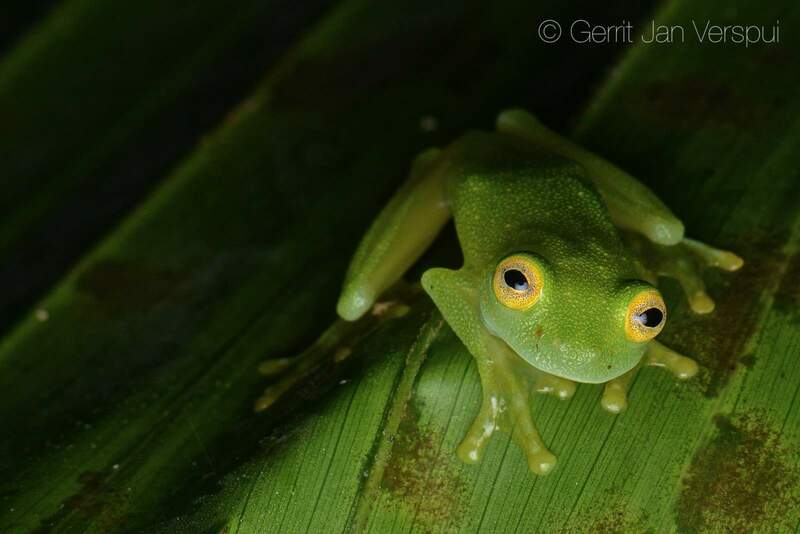 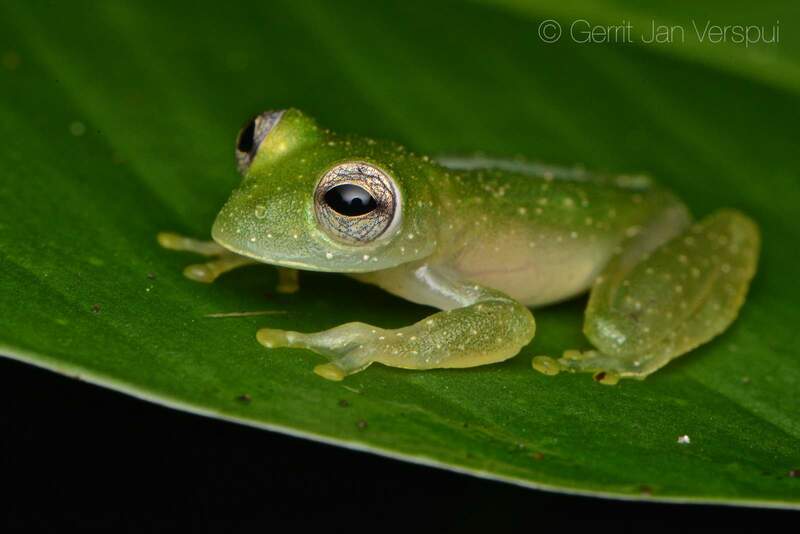 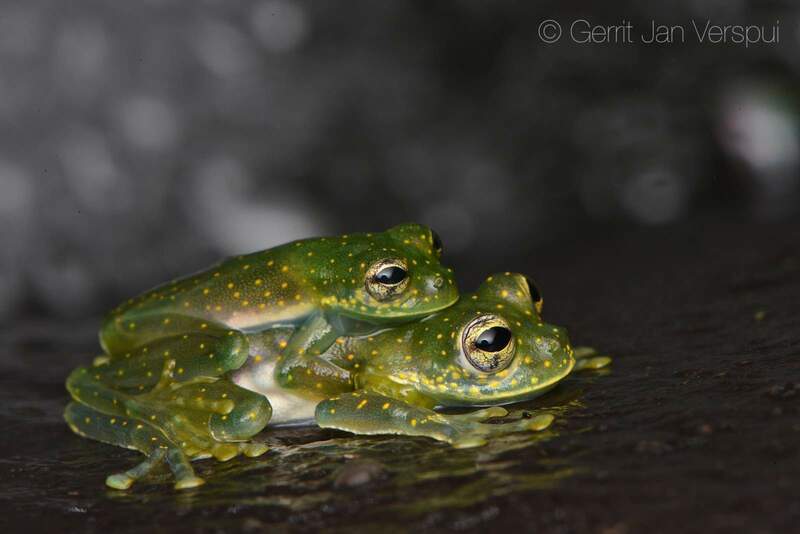 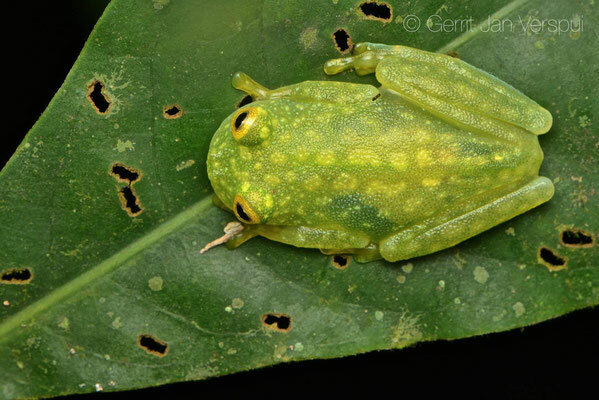 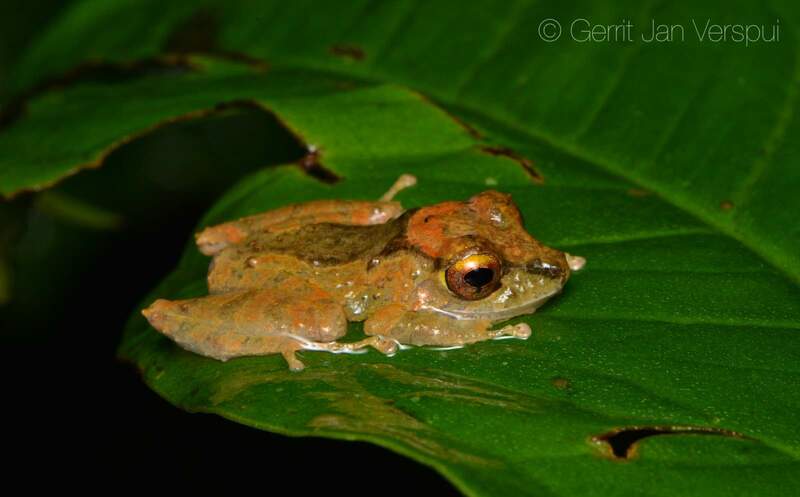 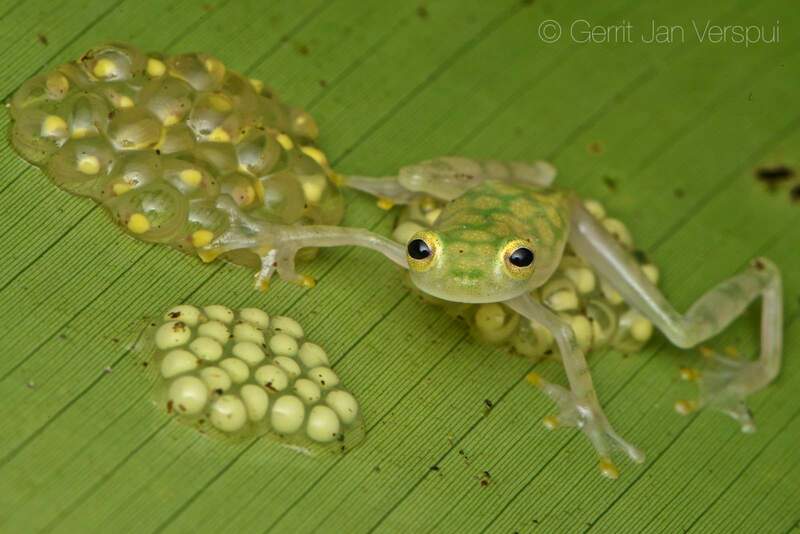 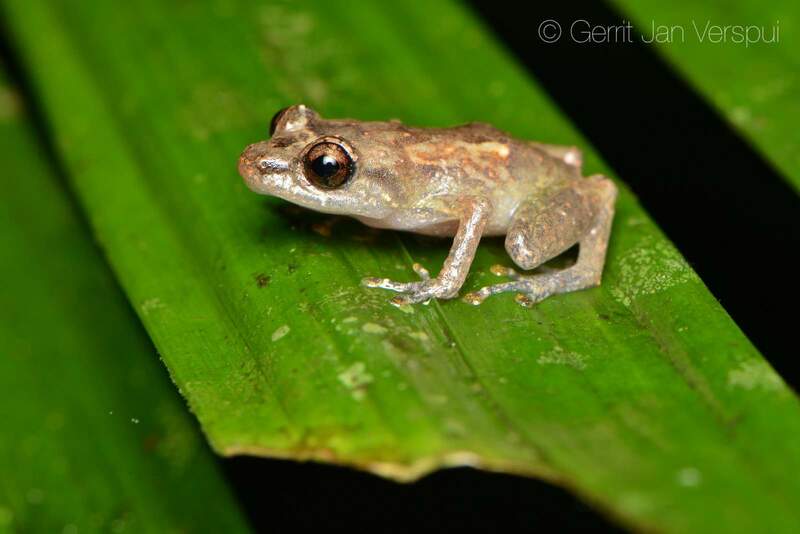 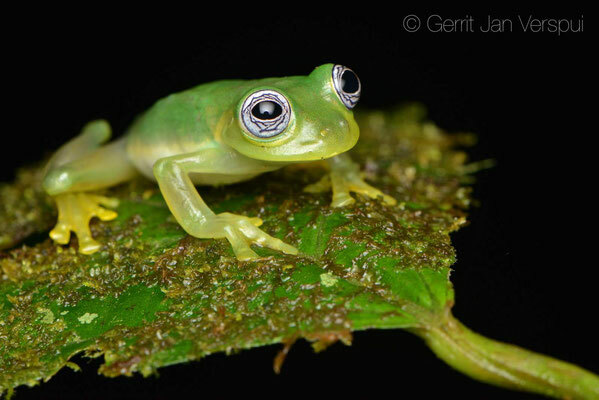 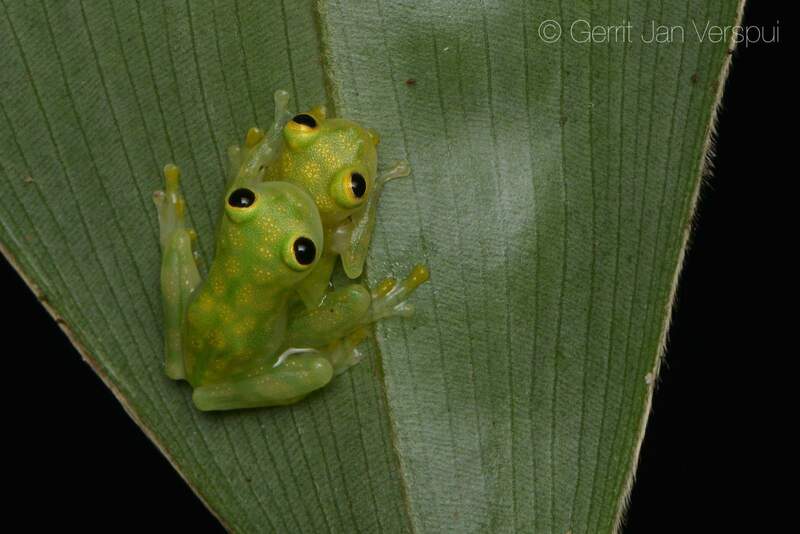 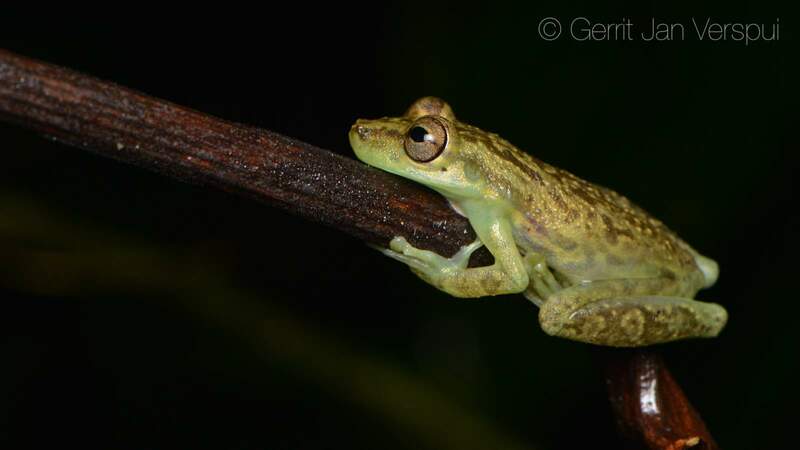 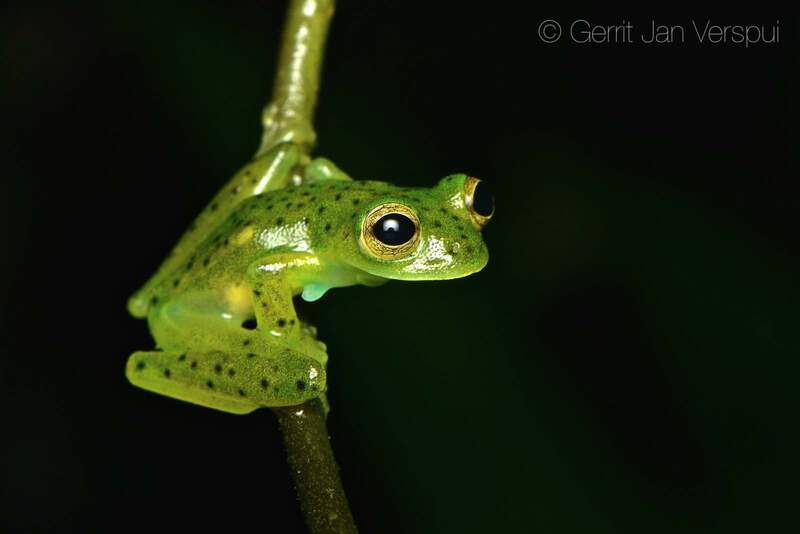 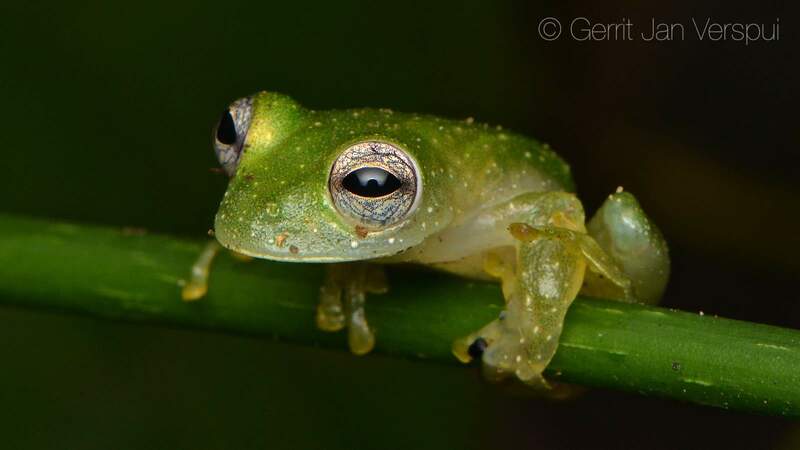 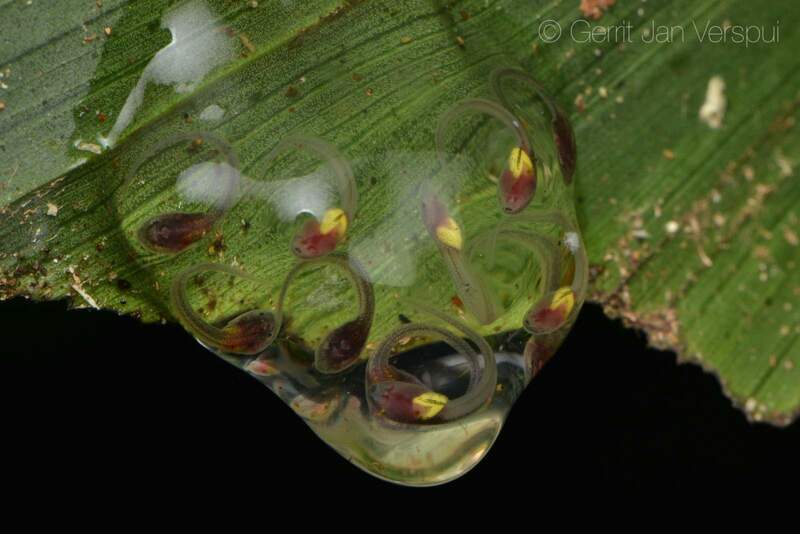 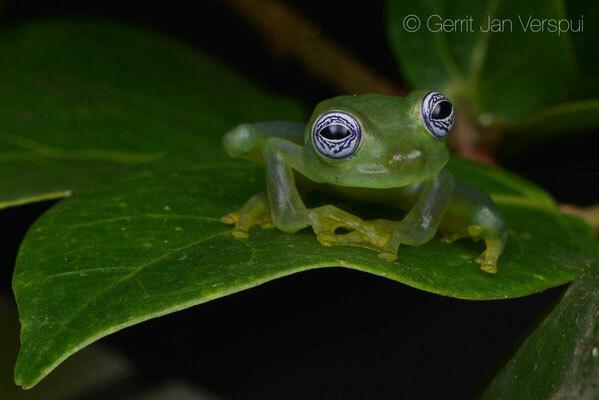 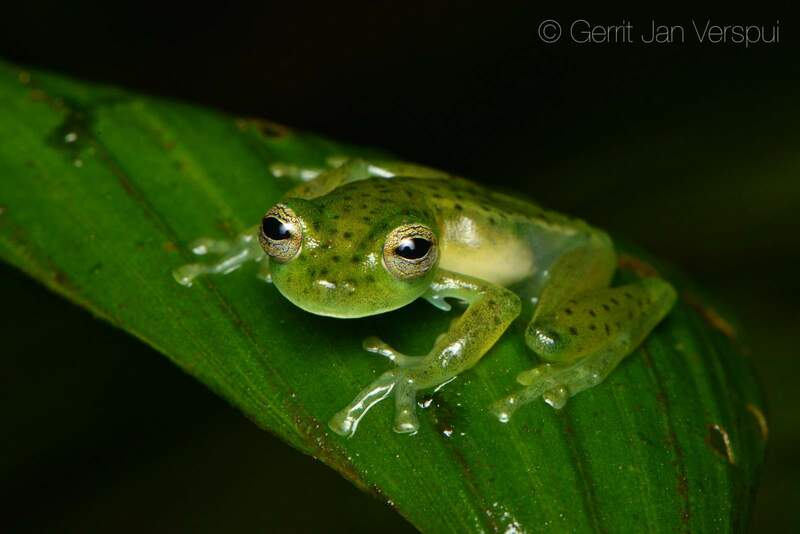 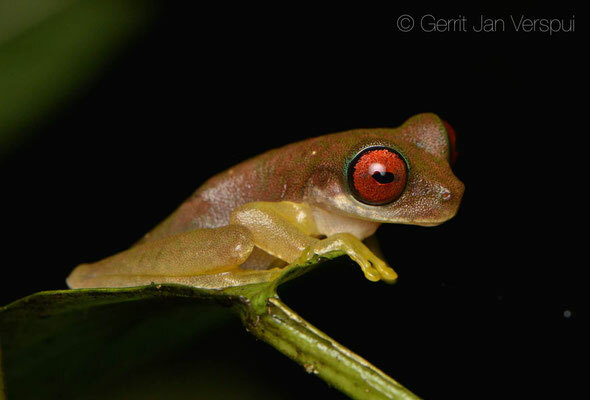 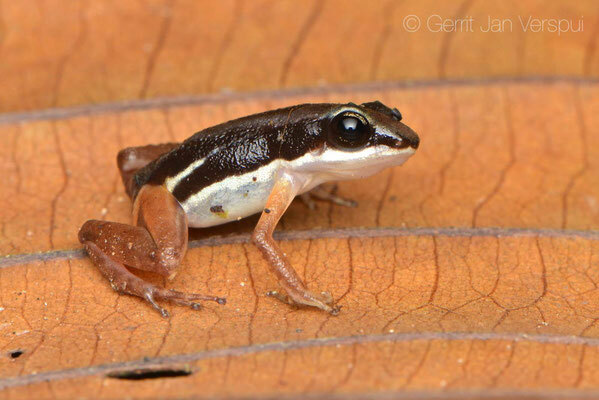 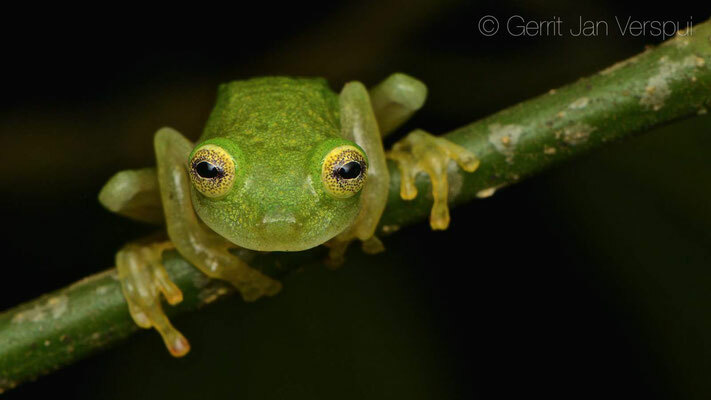 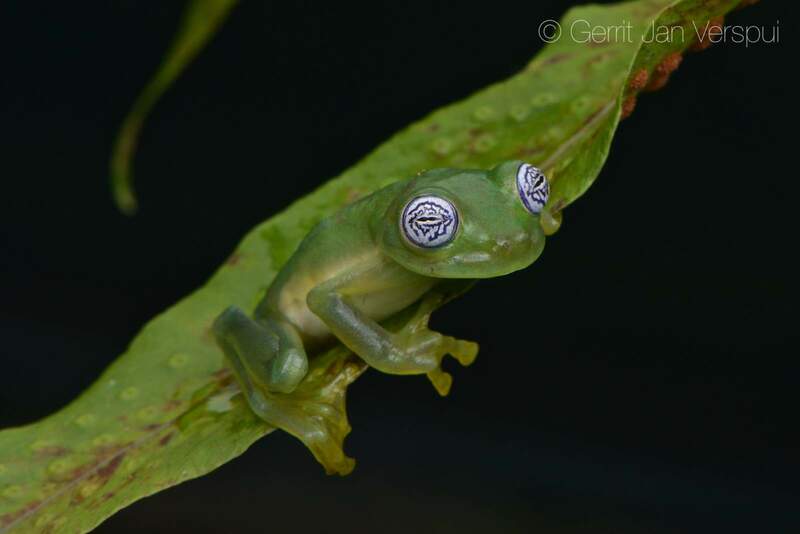 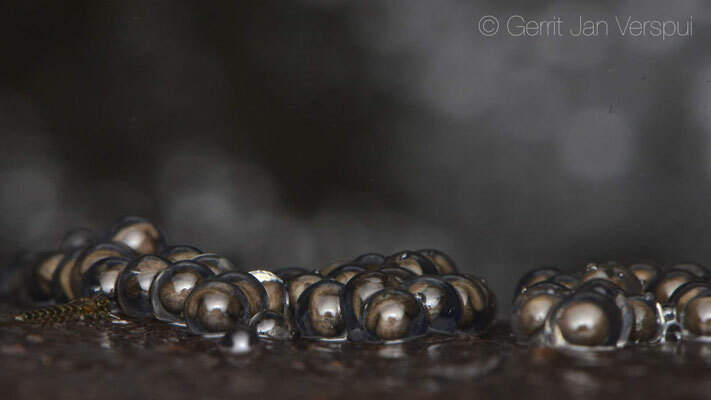 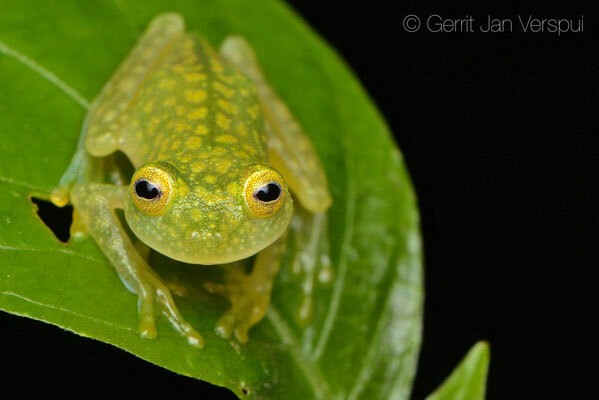 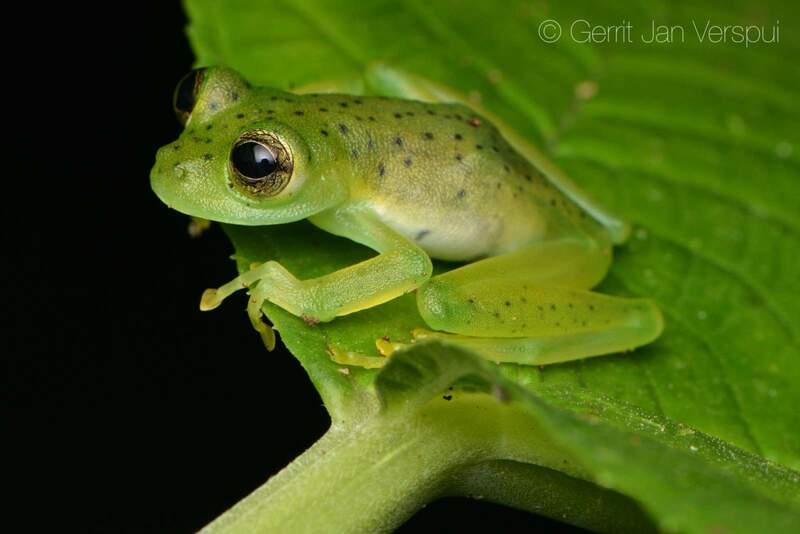 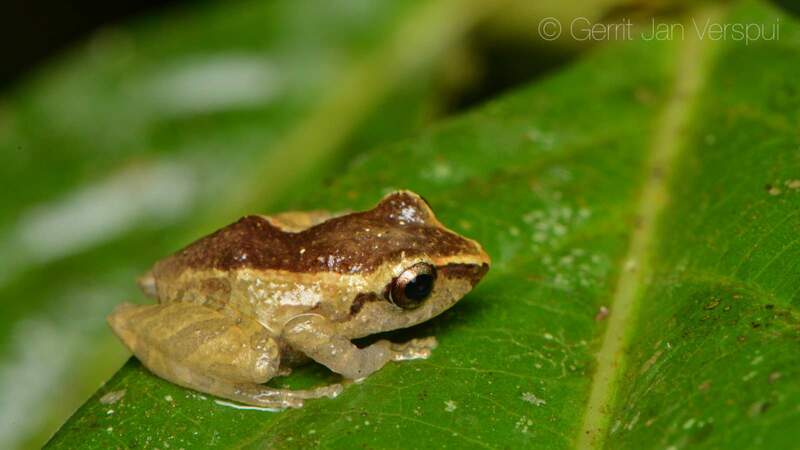 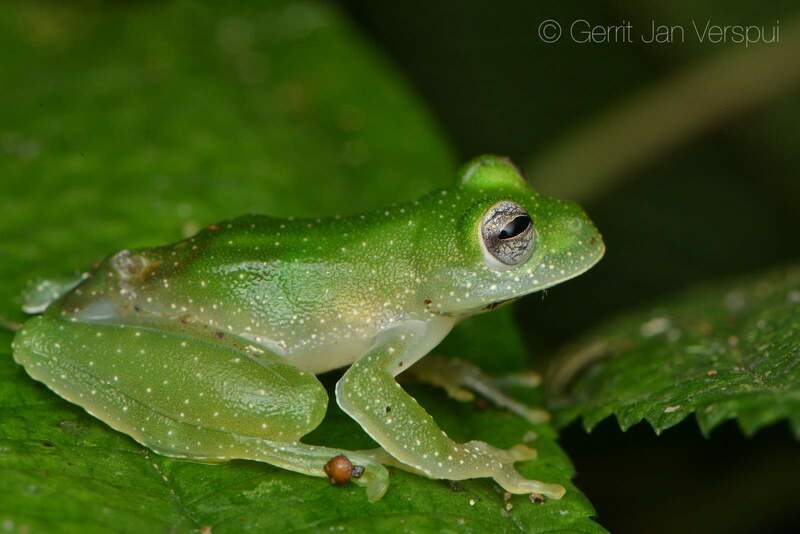 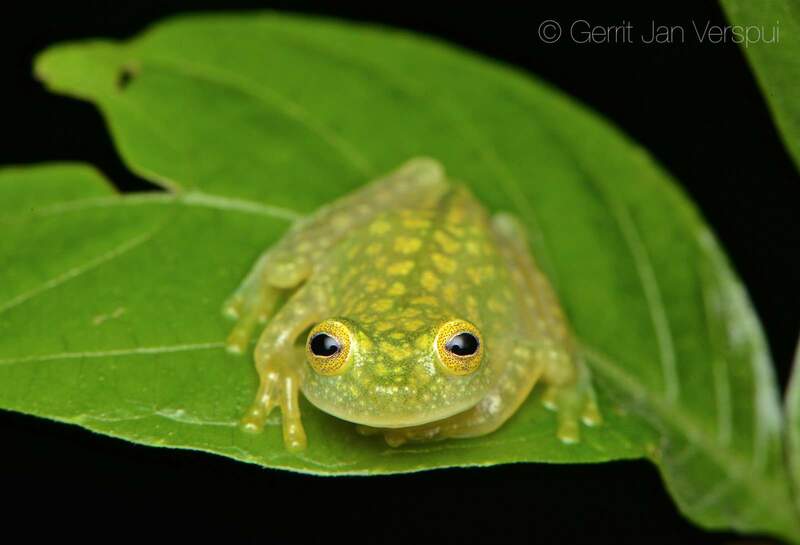 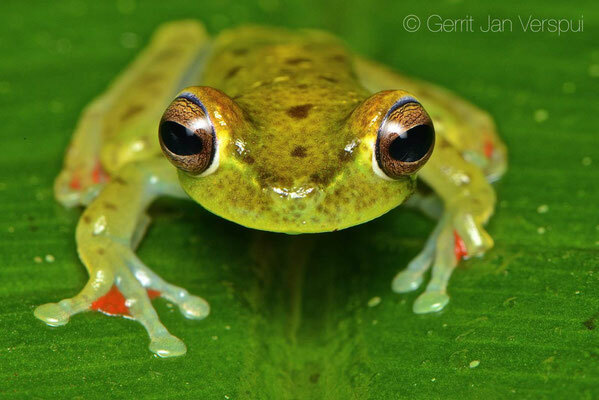 That night I found the 11th species of glass frog for me, the Bare-hearted Glass Frog. 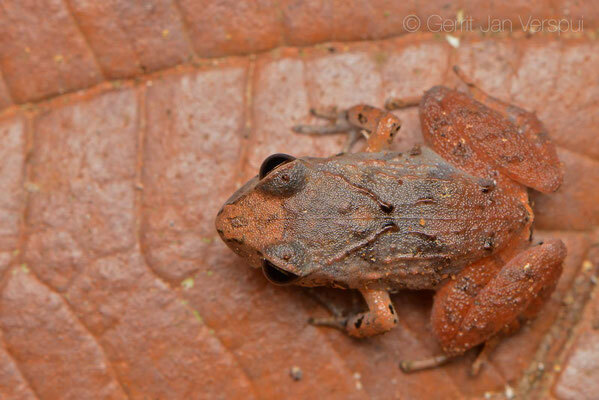 The next day I search next to the trails in the leaf litter and I found 2 species that were new for me, in the afternoon I had a beer again at Dante's lodge and when I returned at La Tarde there was already a big group of people drinking beer and there was a pig on the bbq, it was the 23rd of december and this means in Costa Rica that you have a party. 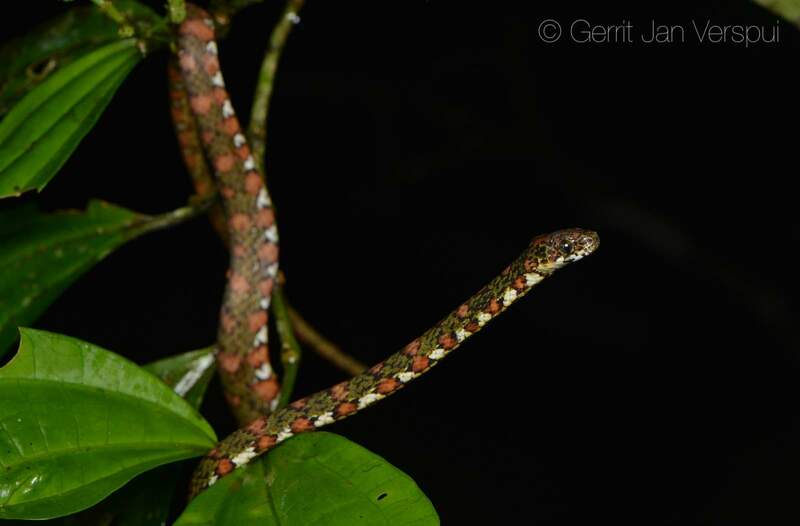 Marcello made sure I got a beer and it was a very good night with lots of laughs, good (snake)stories and nice people, but as everybody knows, there are still animals waiting to be found somewhere, so around 20:30 I got my gear and walked into the jungle. 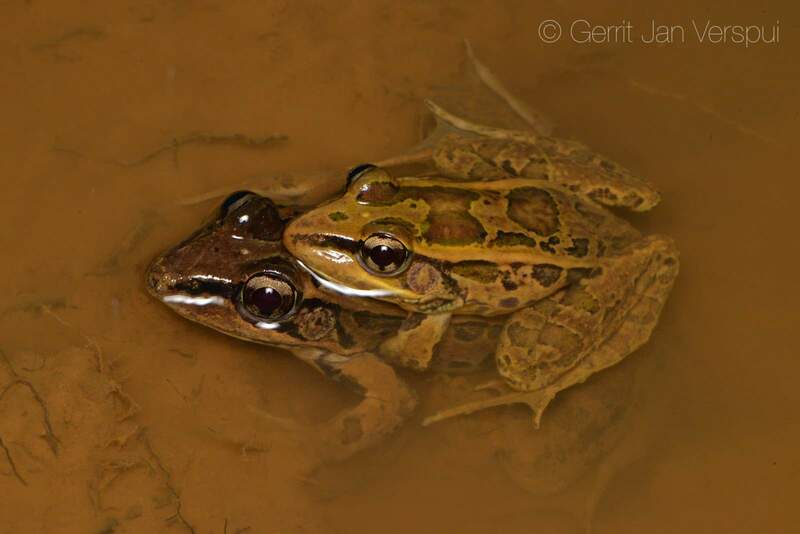 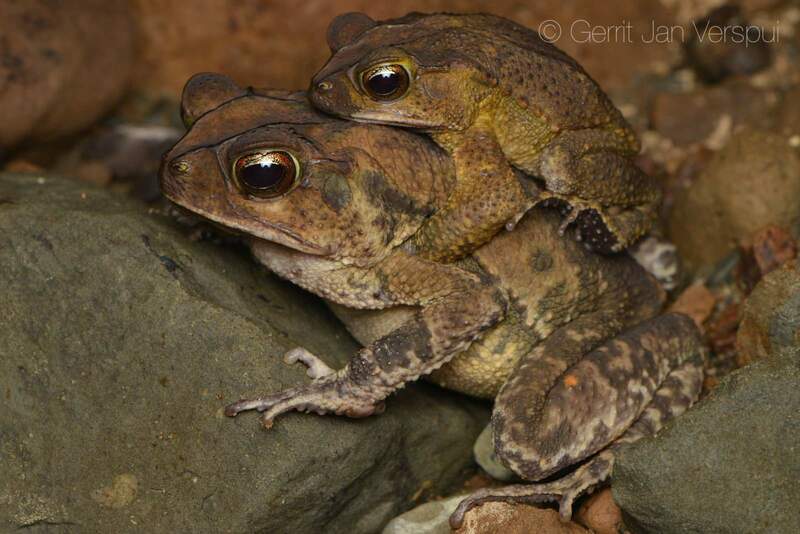 That night I walked along the river and saw many amphibians in amplexus. 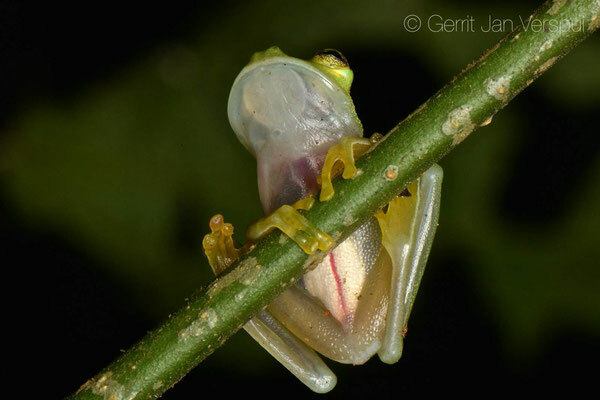 There was still a thing that frustrated me a tiny bit, the Granular Glass Frog was almost everywhere during this trip in Costa Rica, but always and always they are too damn high up a tree to reach them. Again I heard them calling, they have a very loud call that is not easily mistaken with other calls. This time there were 2 males calling from a tree at around 7 meters high , but the trees were on a high bank that was already 3-4 meters high, so I crawled and climbed through dense vegetation to get up the edge of the bank, from there it was still almost impossible to locate the frogs, so I had to climb in the trees and finally after bending away branches I saw a frog calling on top of the leaf, almost the highest point in the whole bunch of trees. 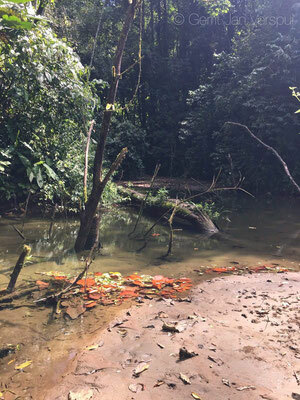 I tried to reach for the frog, but it jumped away at least 4 times and the last time it jumped on a branch that I used for reaching out to the frog. 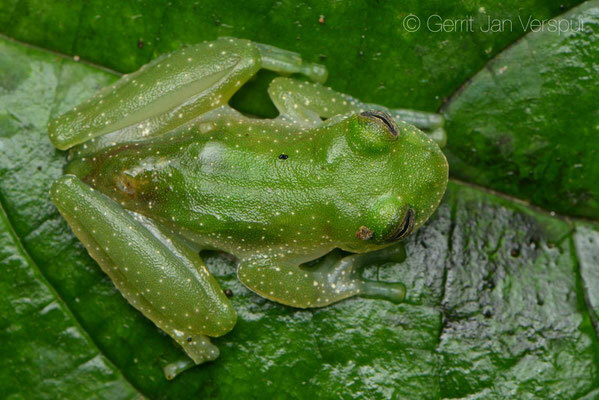 Finally I had my second Granular Glass Frog ever, I heard around 100 but saw only 2 this far. While I was photographing it jumped away and I never saw it again.. but I already had made some photos, so I did not cry very long over that..
After this I went to the area where I found the Bare-hearted Glass frogs the day before and I found some more of them so I could make some more photo's. Around the time I stept in my bed I didn't even know anymore how to count to ten, I was very tired. 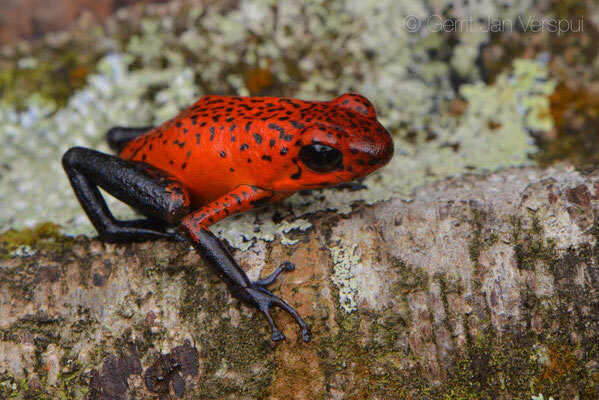 The last day at La Tarde, I went to the area around Los Brazos in the morning, this was the place where we stayed in 2015 and it was a good place for all the dart frog species back than, but now I did not see many animals, only one juvenile Golfo Dulce Poison Frog and a Capito Anolis. 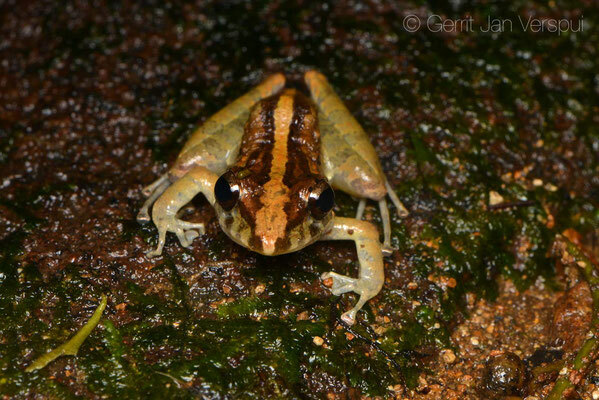 On the last night at La Tarde I wanted to walk from the beginning of the stream all the way to where the Los Patos trail crosses the river, this was partly a very hard route because of the landslides and other parts were easy, again I found many amphibians and now I also found 2 Fer de Lance's and the last glass frog species that lives in this area, so all 6 were found here at La Tarde and for this trip I saw 10 species. 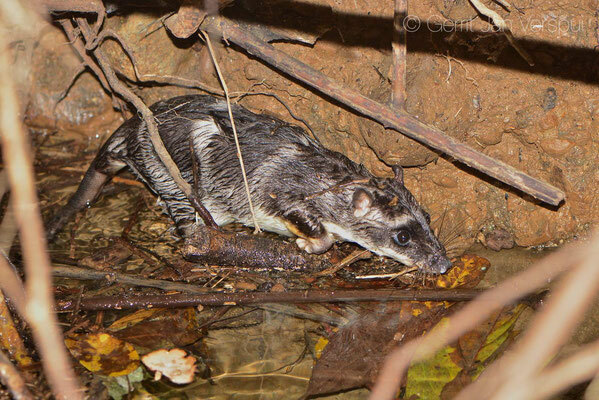 When I walked back along the river and my energy level was so low that I almost fell over every stone that was under my feet I saw something swimming in the river, it was a Water Opossum and it was not that difficult to follow it around a bit and make a photo or 2. 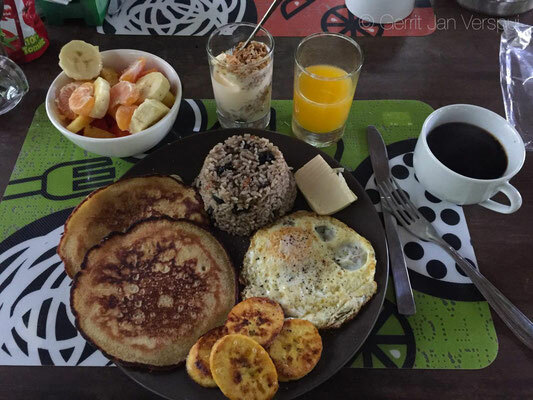 I can't remember how I got in my bed, but I know I was tired and hungry. The next morning I had breakfast pretty early because I had a long drive towards San Jose, but first saying goodbye and thanks to Eduardo and his family, what a special place they have here, I would love to return here one day and roam the area at night again, if you visit this place, ask for Marcello as a guide, he knows everything about the amphibians and reptiles in the area and he is very good company! Thank you Marcello! 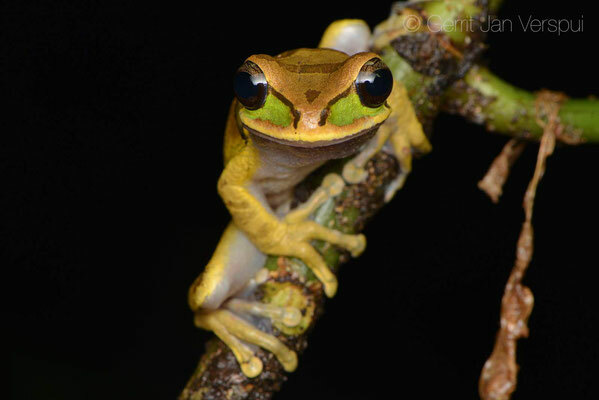 On the way to San Jose I wanted to meet up with Cesar for a coffee at Uvita and that was a great idea, we had a good conversation about herping and other stuff, at some point he was a little distracted, but I had seen that behavior before and recognized it straight away, there was a woman walking by...Thanks for the laughs and your time Cesar, it would be good to herp together one day! 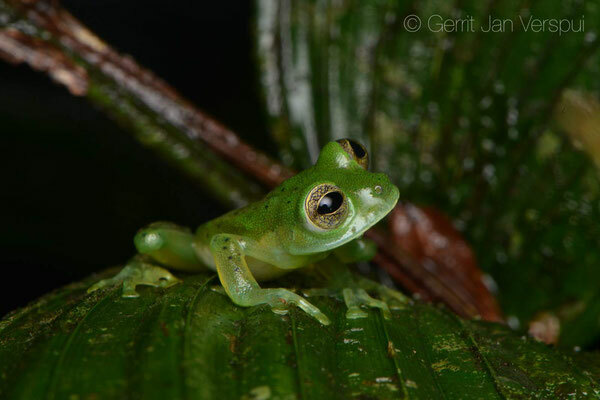 In San Jose I wanted to meet with Pablo Alpizar, we already had some contact during this trip, so I invited him to join me on my last herping mission before I would step into the airplane. 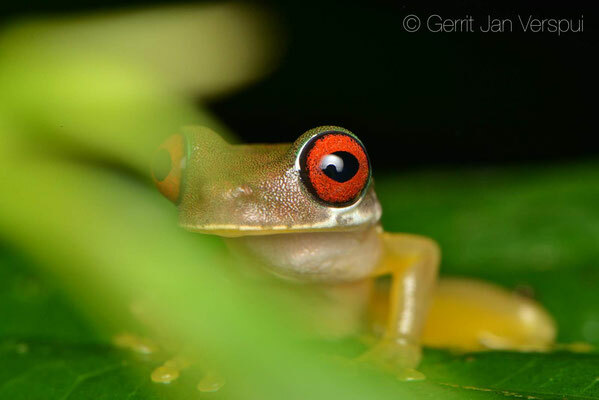 I arrived at the place when it was still light, Pablo and his wife were already there, so we ordered some beers first and as soon as it was getting dark we walked to some ponds and searched for the very cool and big Yellow-eyed Leaf Frog, Pablo spotted one first and after that we found 4 or 5 more, what a cool species and what a great way to end this trip. Thanks Pablo for your time! 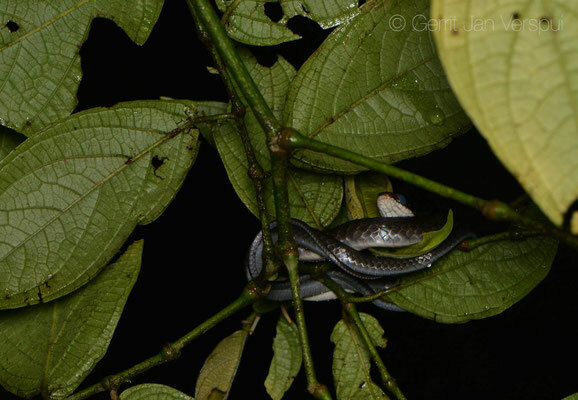 Of course I knew he really wanted to see this species as well, so it was a win win situation! 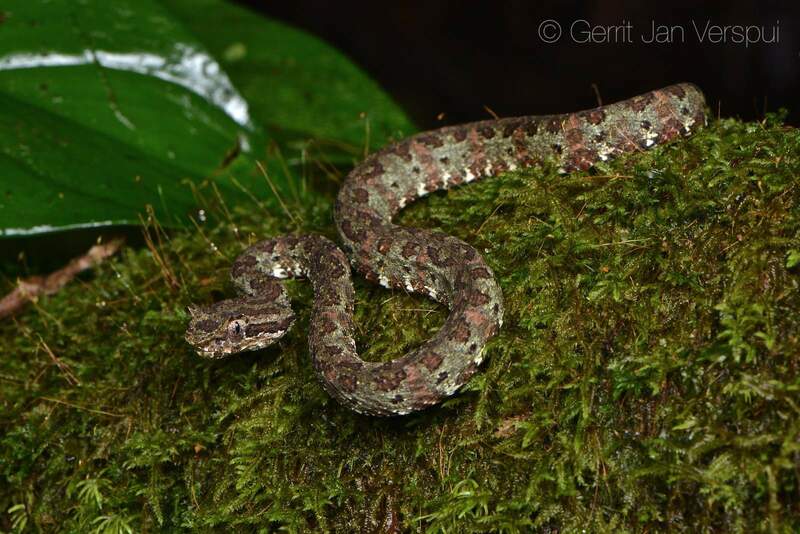 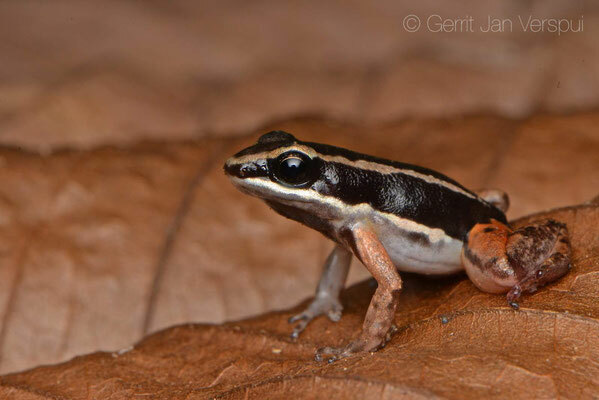 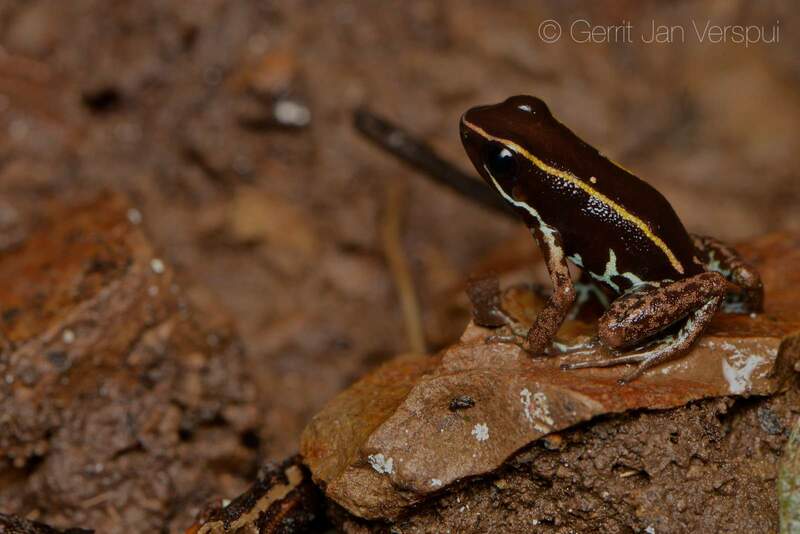 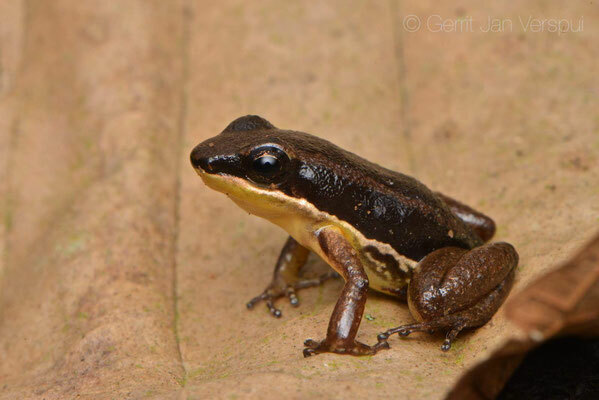 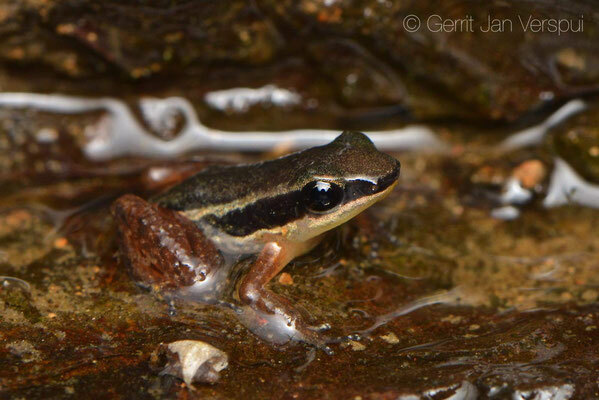 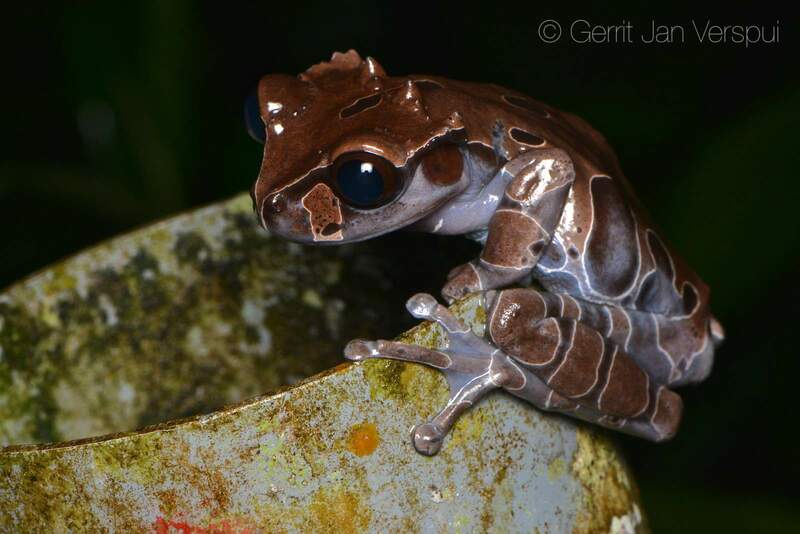 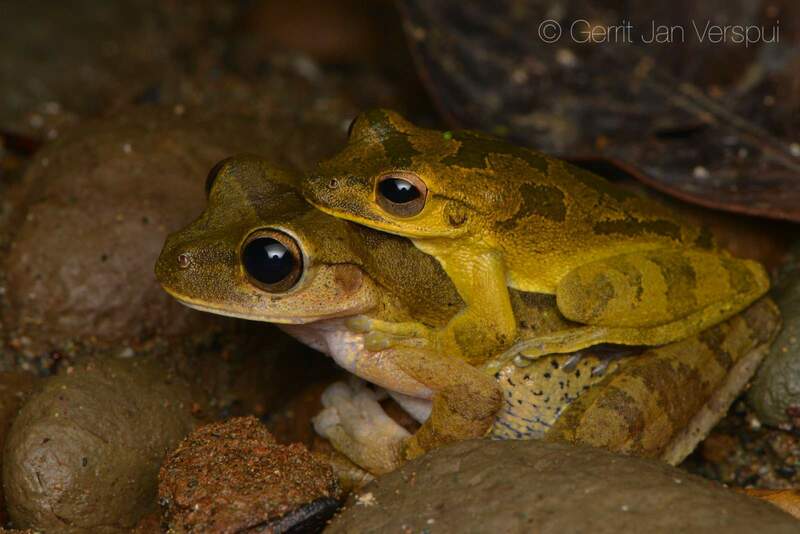 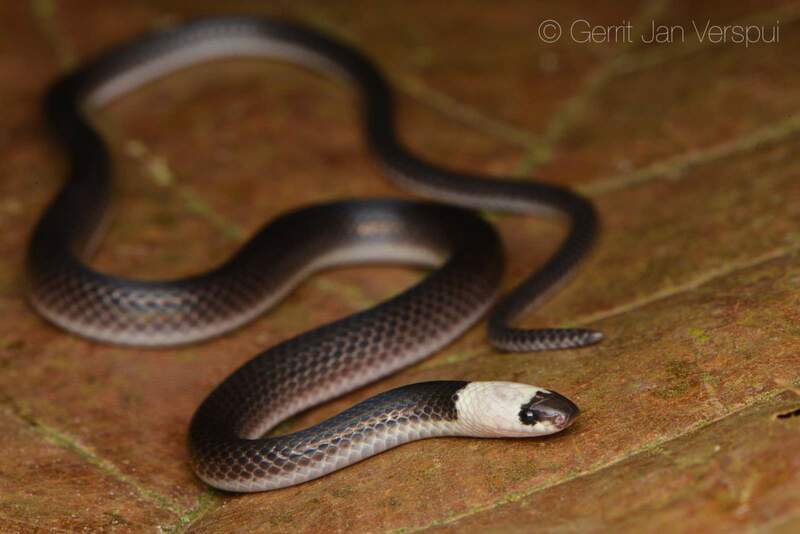 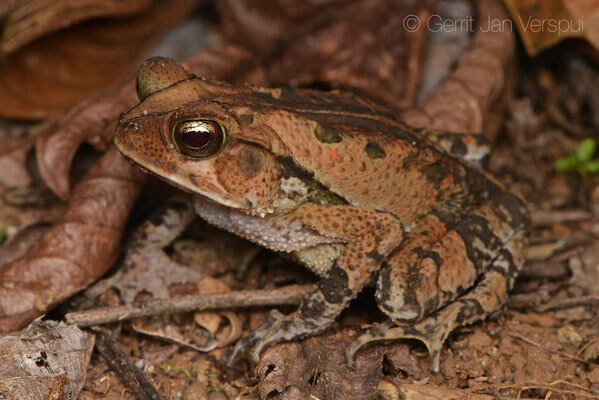 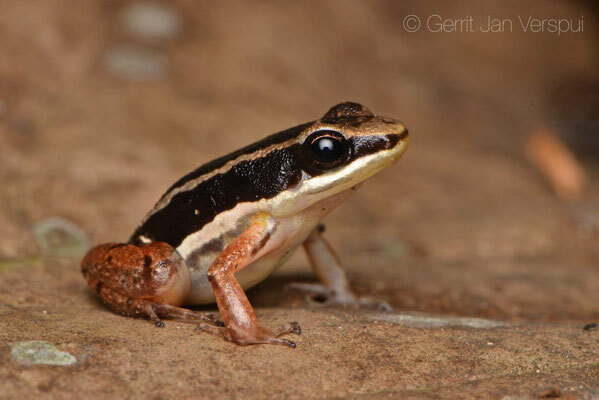 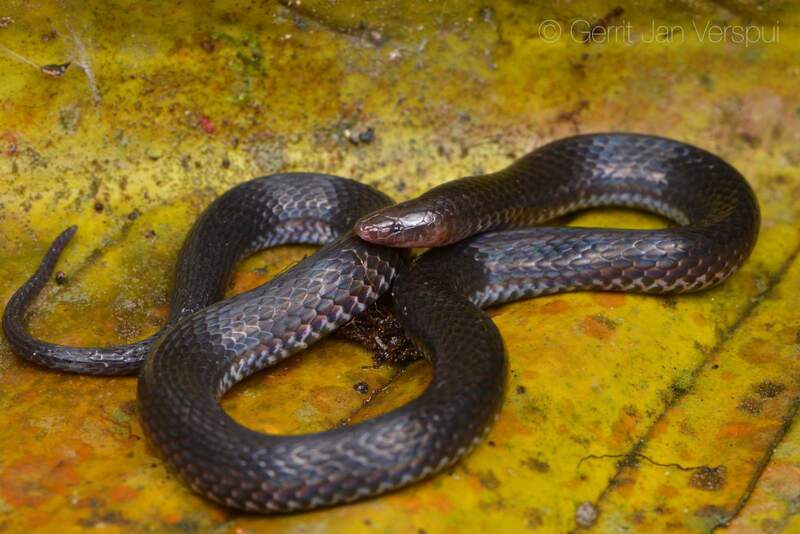 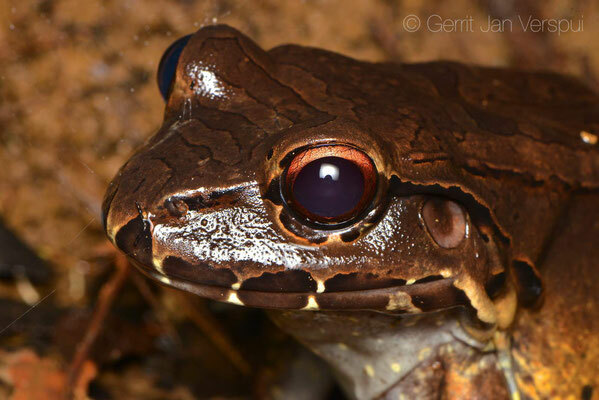 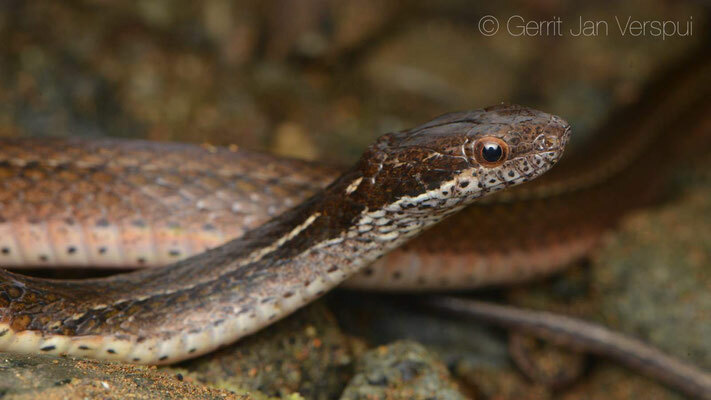 Compared to 2015 I had the feeling that it was much harder to find snakes now (Trip Report 2015), the amphibians were there, but most of the time in low numbers. 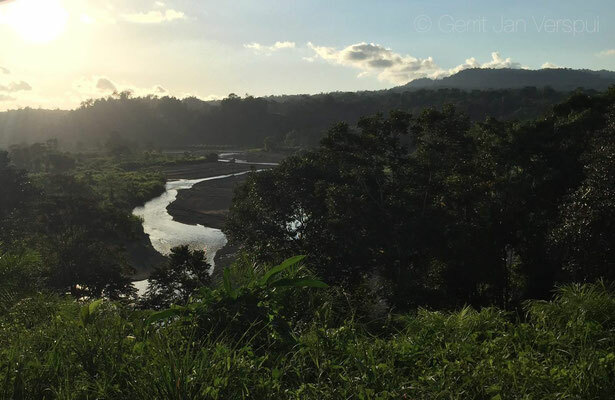 This must have something to do with the season, it was the start of the dry season, but when I look back now at the photos I must admit that I am pretty happy with the results. I know people are thinking now: wtf is he talking about, he found so many cool animals, but reading this report will not give you the feeling that there were many hours without finding anything at all, but that was just the way it was. 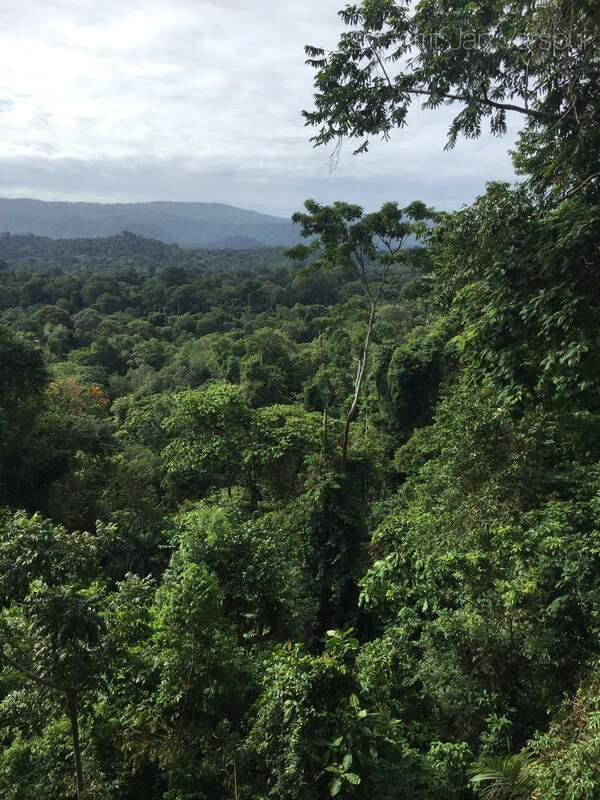 I want to say thanks to all the people I met or almost met during this trip, mostly because your help and time this trip was a success! Pedro, Donald, Juan, Andrey, Brian, Sebastián, Cata, Eduardo, Marcello, Cesar, Pablo and his wife. 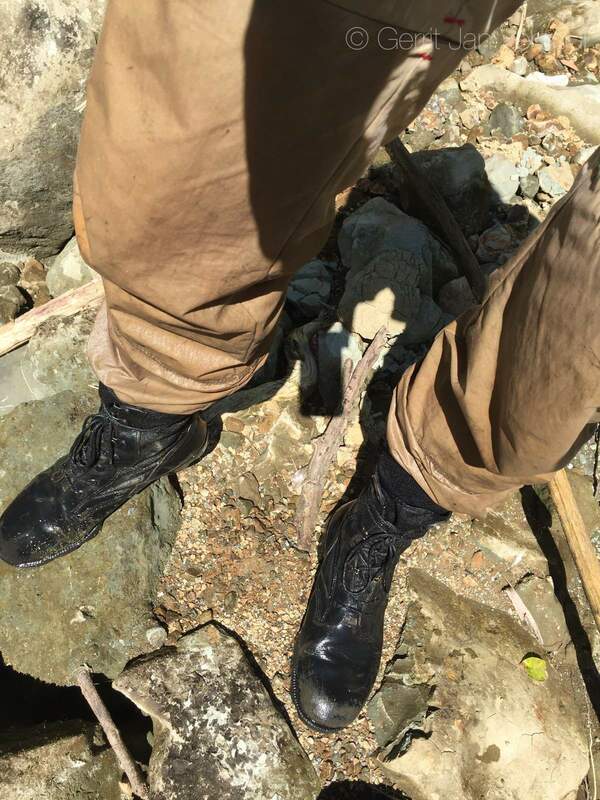 Thanks you all! Now it is waiting for april, Uganda with my friends Laura, Bobby and Jelmer! I can't wait!